Below are some projects where our products were used. To find more investments click here. 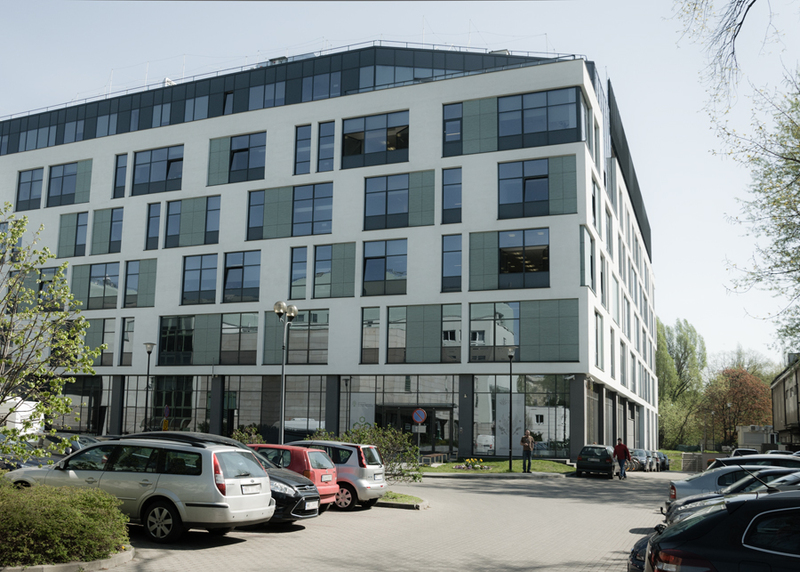 The new headquarters of the well-known Wrocław Centre for Rehabilitation and Sports Medicine is one of the most modern medical facilities in Poland. 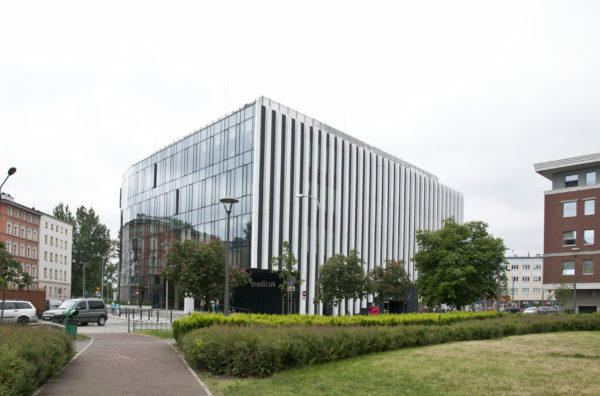 It was awarded distinctions in the category "Public Building" in the architectural competition Beautiful Wrocław 2018. 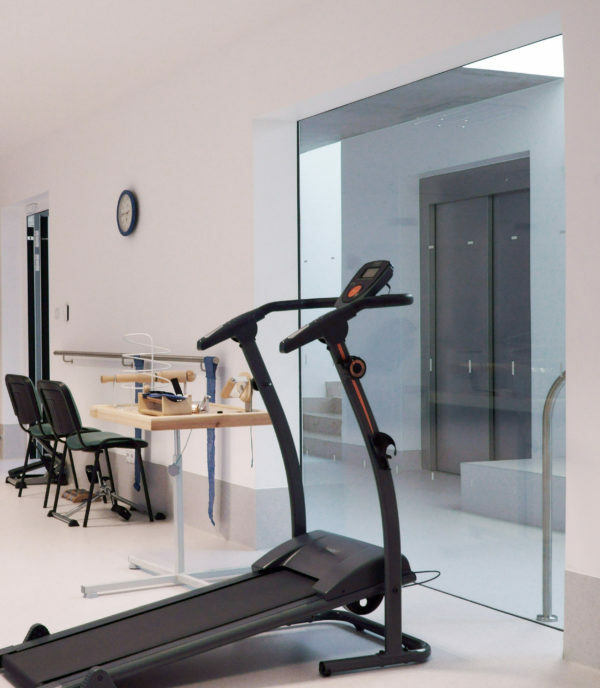 A three-storey building with an area of almost 13,000 m2 houses a healthcare centre with a modern operating suite, rehabilitation areas and a hydro-kinetic therapy pool. 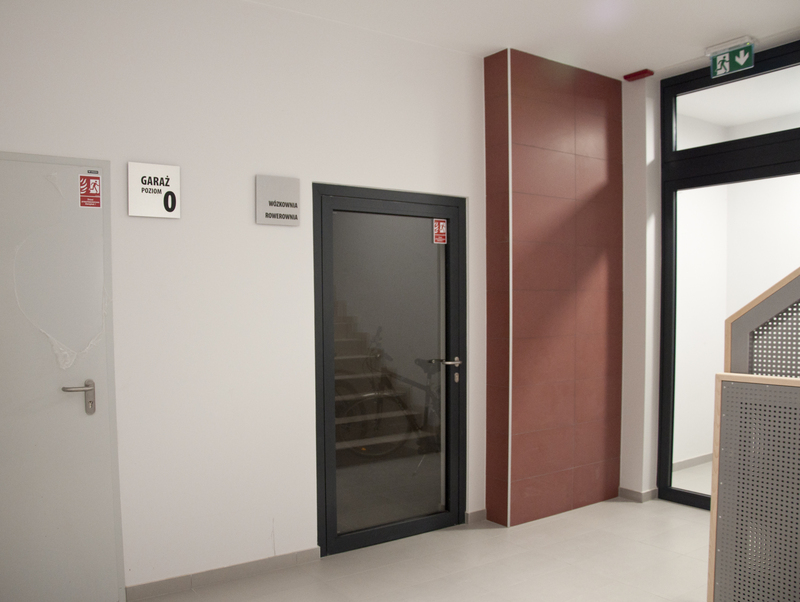 POLFLAM® glass, class EI 60 was used in the fire-safe doors of this building. 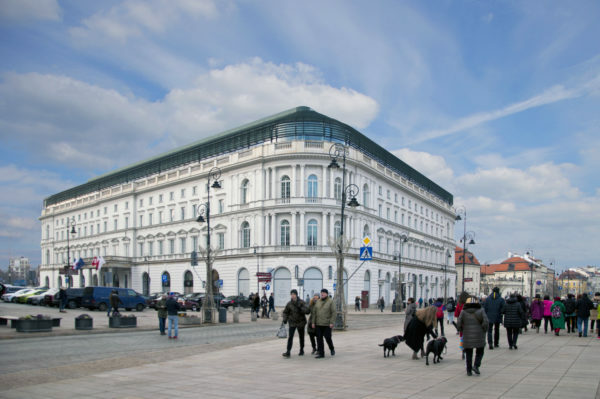 The Europejski Hotel, which opened for the first time in 1857, is one of the icons of Warsaw and one of the most valued hotels in Poland and in Europe. 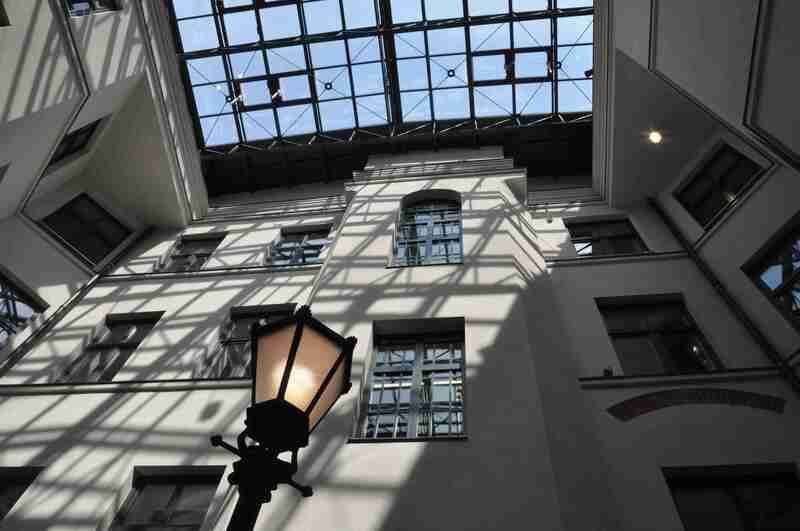 In the years 2013-2018, it was thoroughly renovated: in accordance with the rules of conservation art and, at the same time, with the use of the state-of-the-art solutions of modern architecture. 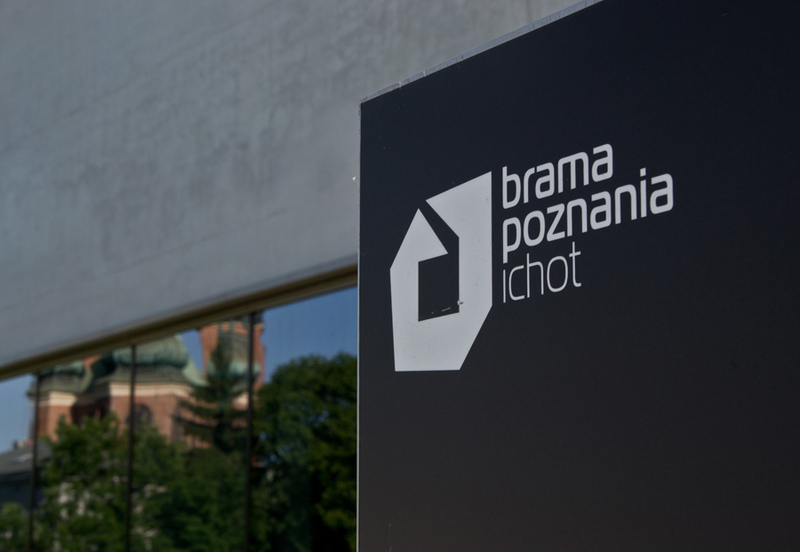 architectural design: Point Co. Ltd. Pracownia Projektowa sp. z o.o. 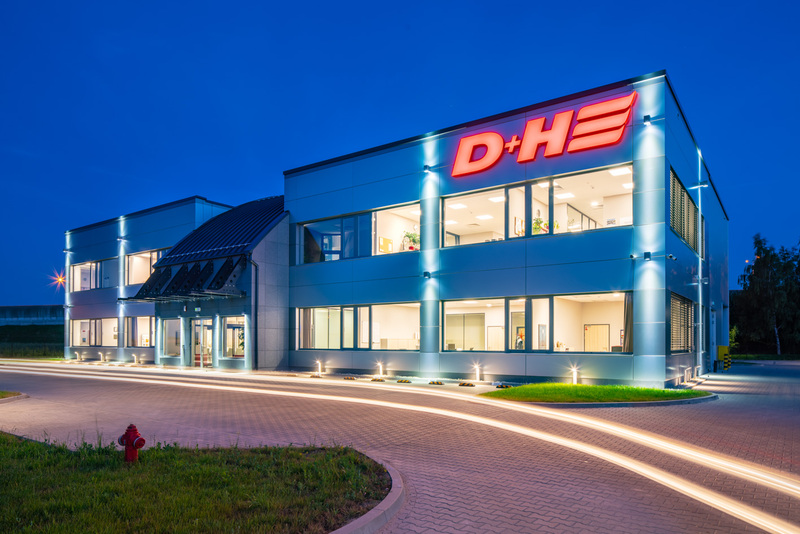 The new headquarters of D + H Polska is a two-storey facility with over 700 sq m of office space and a 400 sq m warehouse. 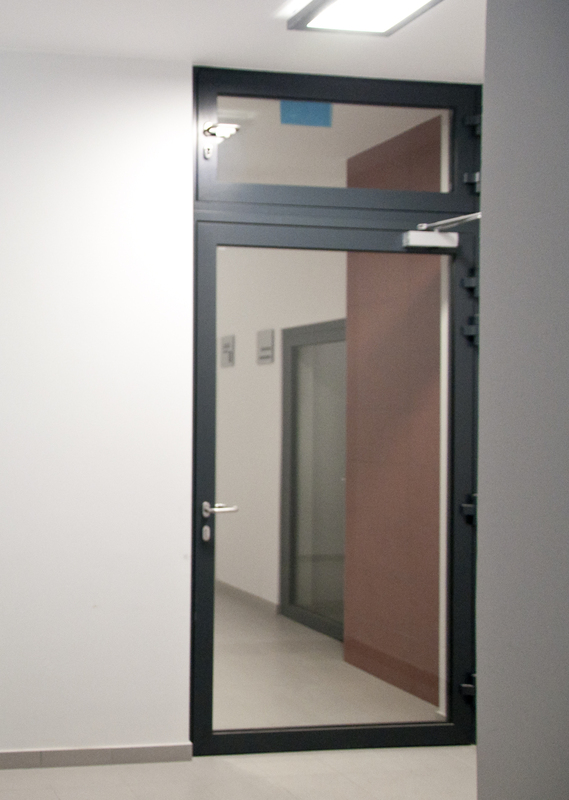 The design contains the most advanced solutions in the field of fire protection. 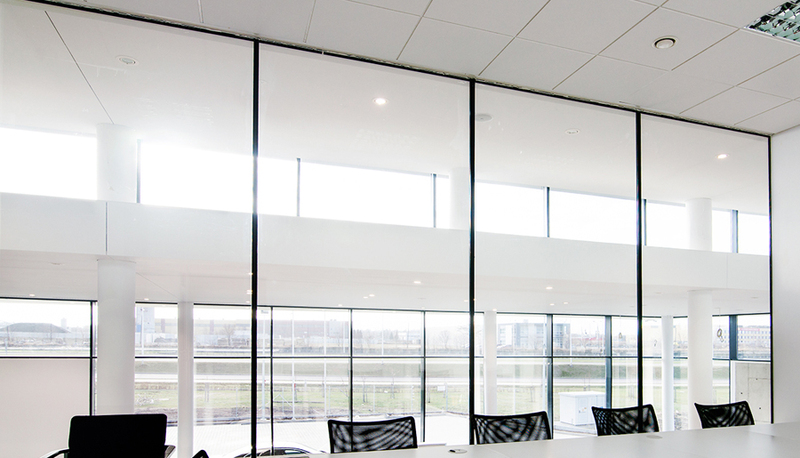 POLFLAM® BR glass, class EI 30 was applied in glazing partitions separating two conference rooms. 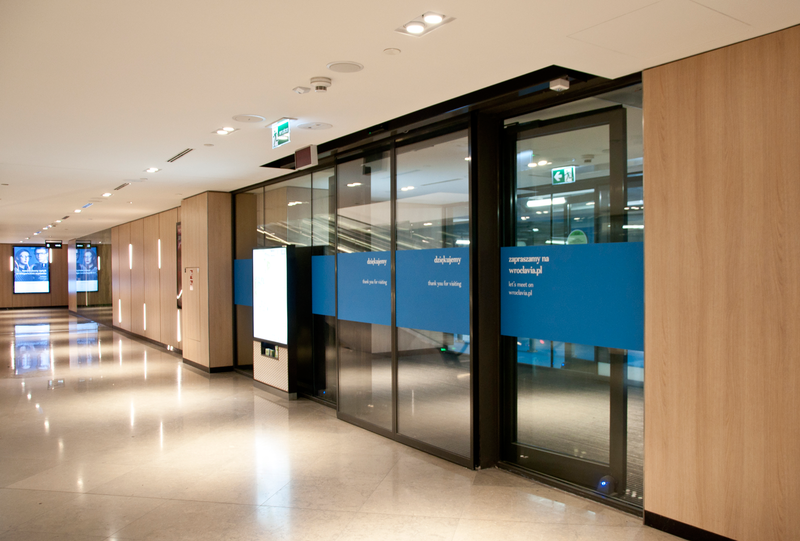 In one of them, intelligent LCD glass has been applied as an extra glass panel, allowing to obtain, if necessary, the effect of opaque glass. 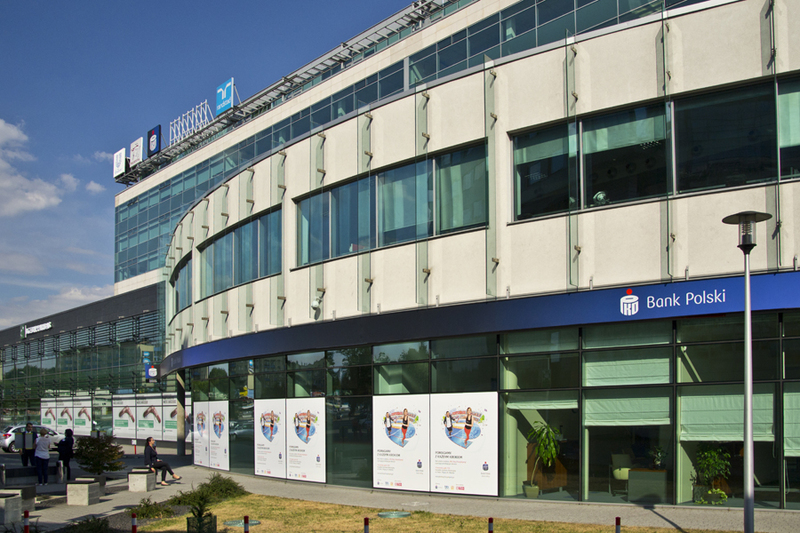 The newest BZ WBK bank building in Wrocław is a six-storey office building in the Fabryczna district. 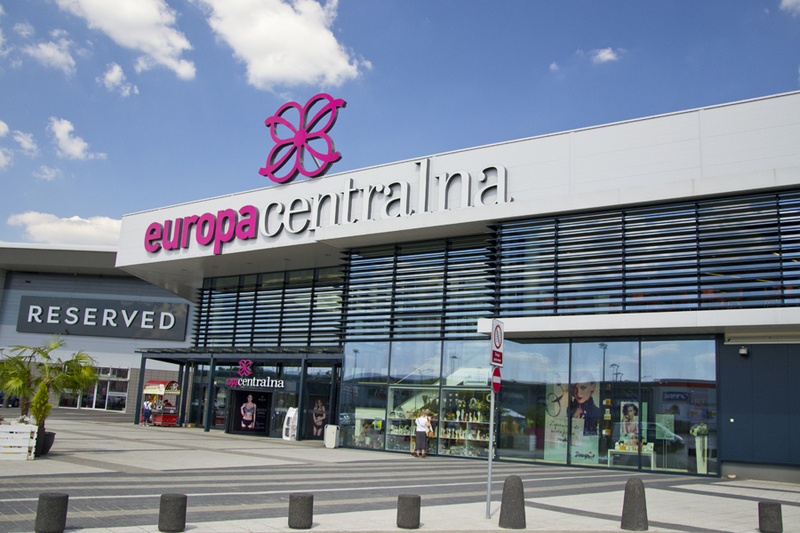 It was opened in early 2018. 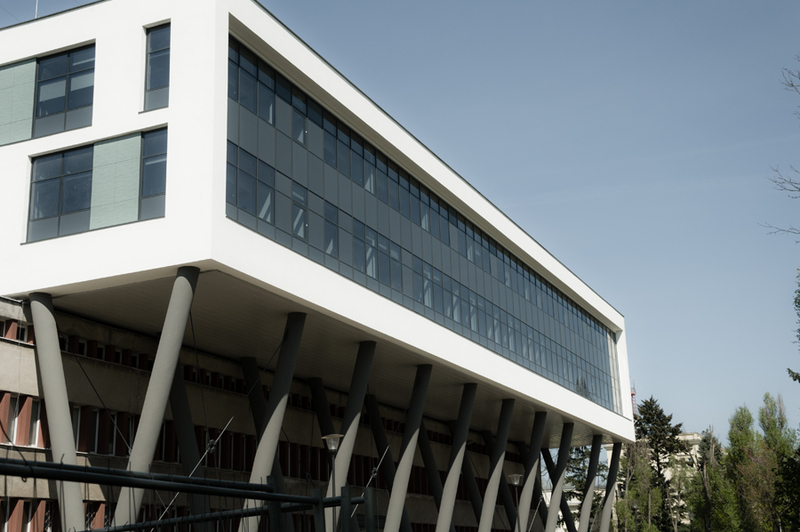 The usable area is 17,000 sq m.
In the part of the façade, which was required to be fire resistant, POLFLAM® glass, class EI 60 was used. 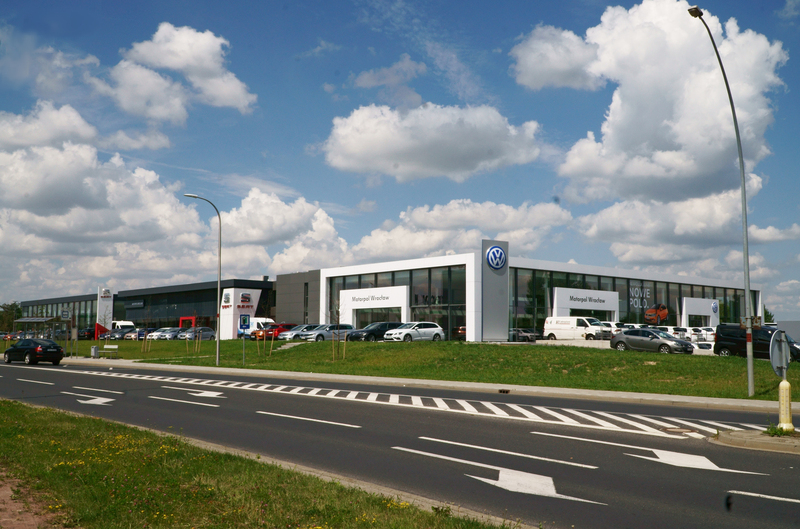 MOTORPOL is a new showroom and service for SEAT and Volkswagen. 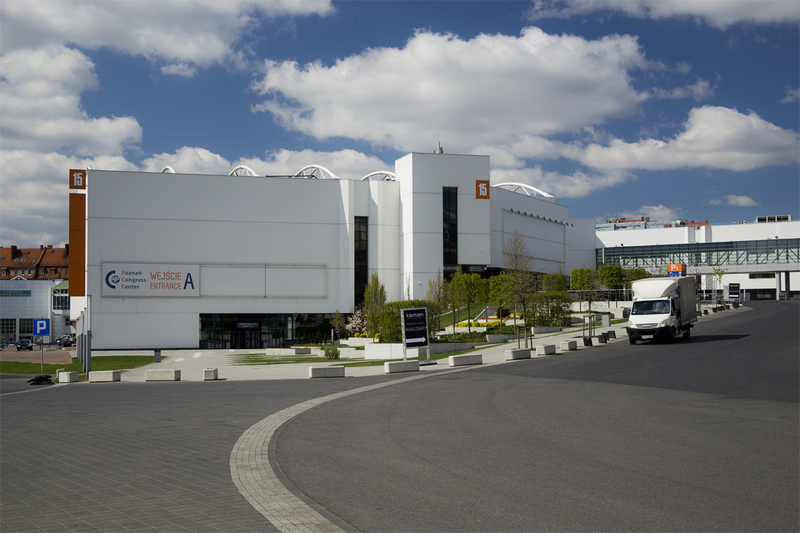 In two exhibition halls, there is the largest car showroom for new and second-hand cars in the region. 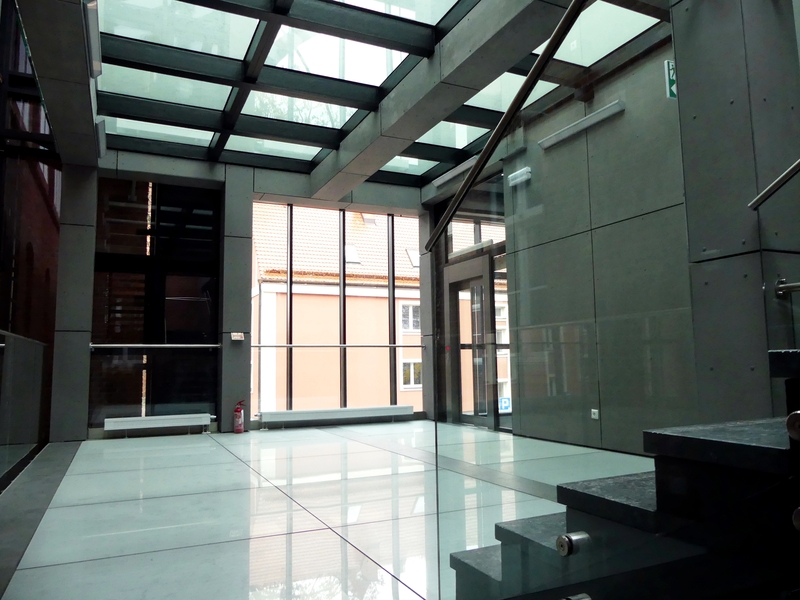 POLFLAM® glass, class EI 60 was applied in the facade of the building. 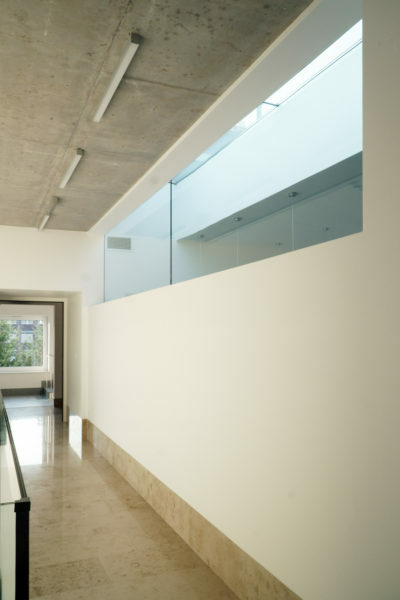 It was also used in skylights and internal glazing. 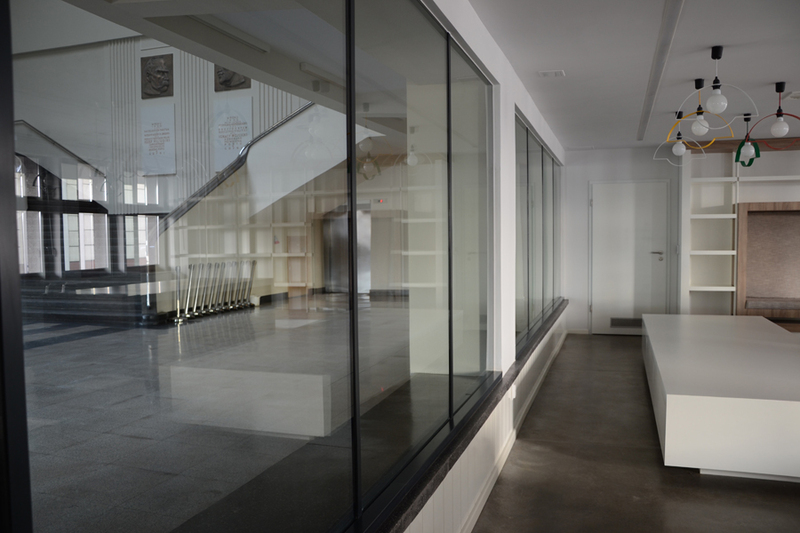 The five-storey building X2 Boutique Office is a cozy office building maintained in a post-industrial style. 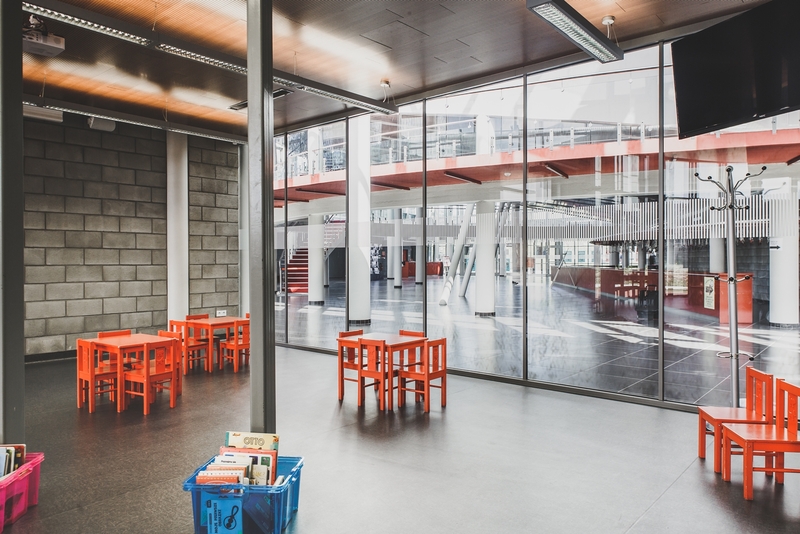 The interiors are dominated by steel, concrete, glass and aged brick. 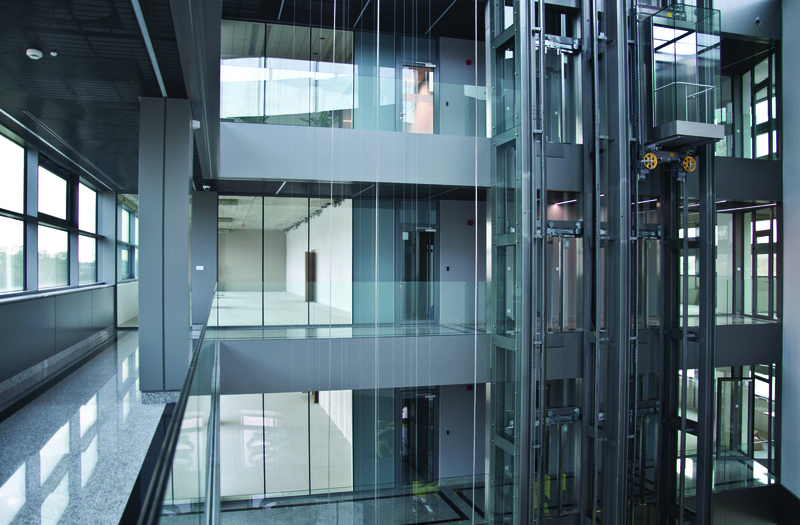 POLFLAM® glass EI 60 class has been used in firewalls in the interior of the building. general cobtractor: BIL Sp. z o.o. 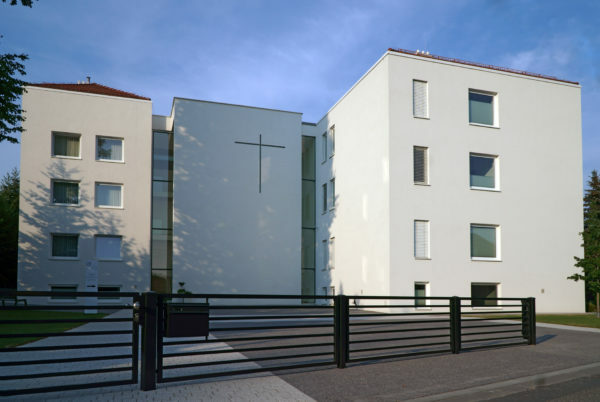 In the revitalized and extended facility of the house of social welfare and the monastery, POLFLAM® glass, class EI 30 and EI 60 have been applied in a number of ways: in the glazing of the walls of the conference room, the rehabilitation room and the chapel, as well as in the fire-resistant doors and windows opening at the atrium. 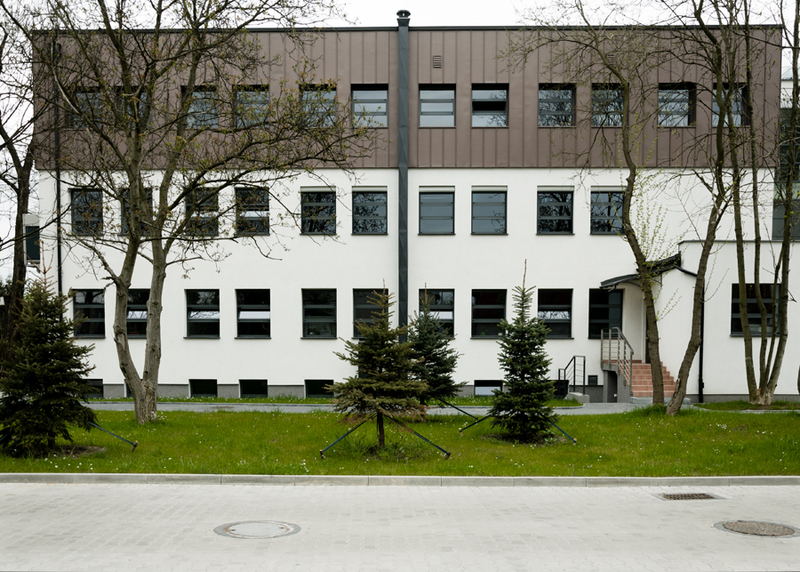 The house of social welfare in Dobrzeń Wielki received a distinction in the competition Mister of Architecture of Opole Province 2014-2016. 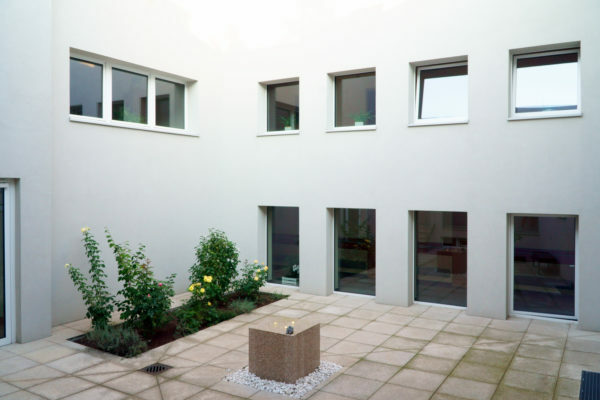 The designers of the house of social welfare are also the winners of the general title of Mister of Architecture. 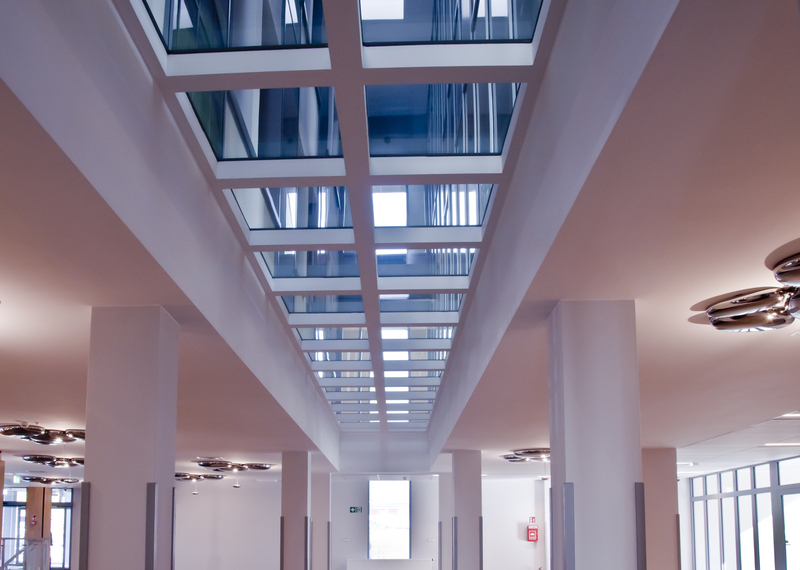 POLFLAM® bent fire-resistant glass was used at the headquarters of one of the companies. 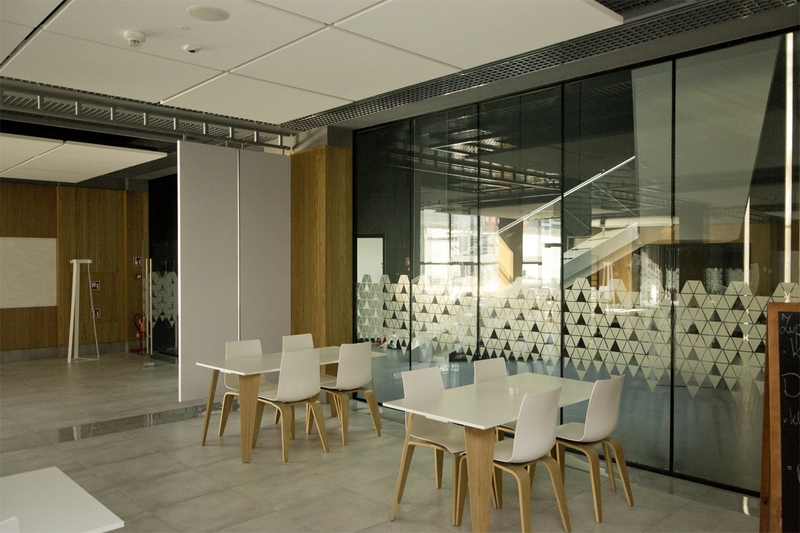 It served to functionally separate the staff room from the office space. 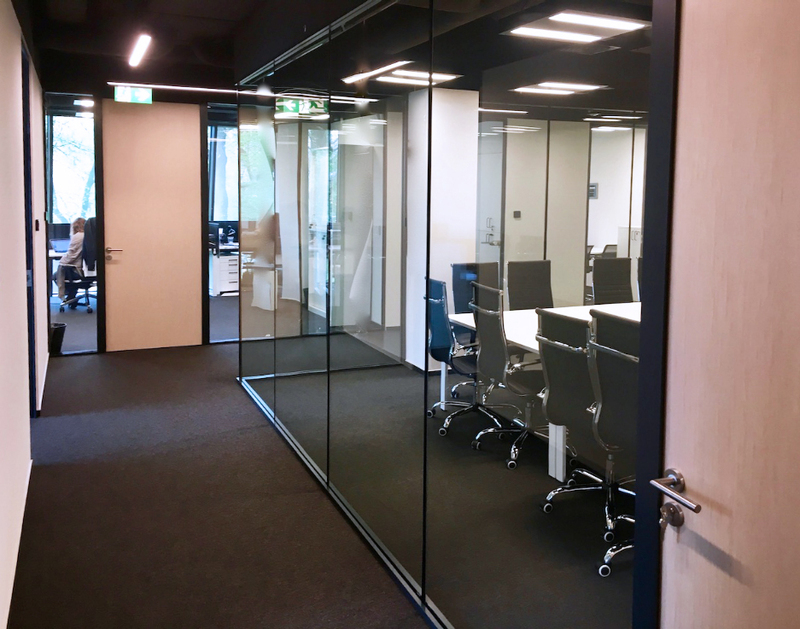 The glass partition in the EI 30 class allows for saturating the space with daylight. 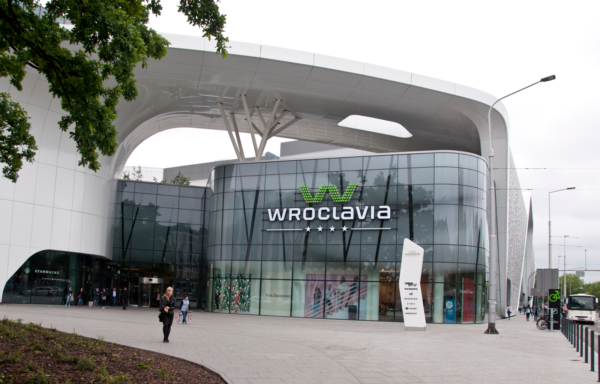 Wroclavia is a modern shopping centre in the centre of Wrocław. 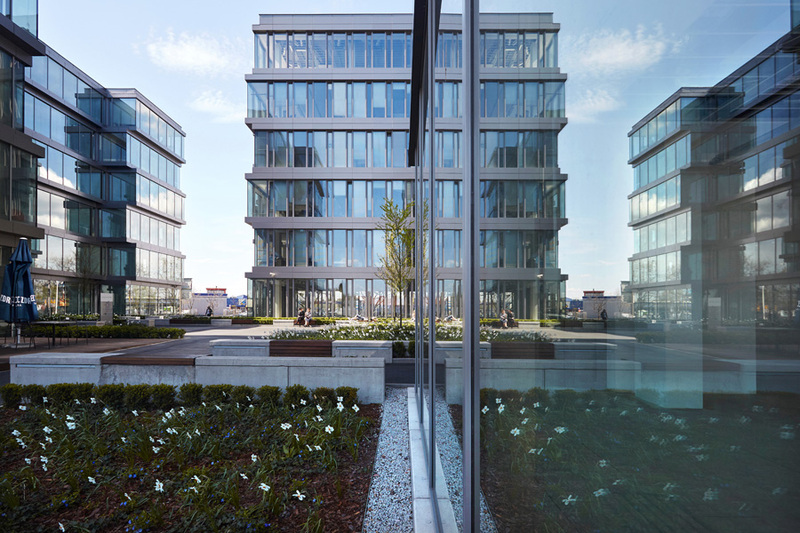 The distinguishing features of its architecture include large surfaces of internal glazing, three-dimensional facades, glazed roofs and natural forms and materials. 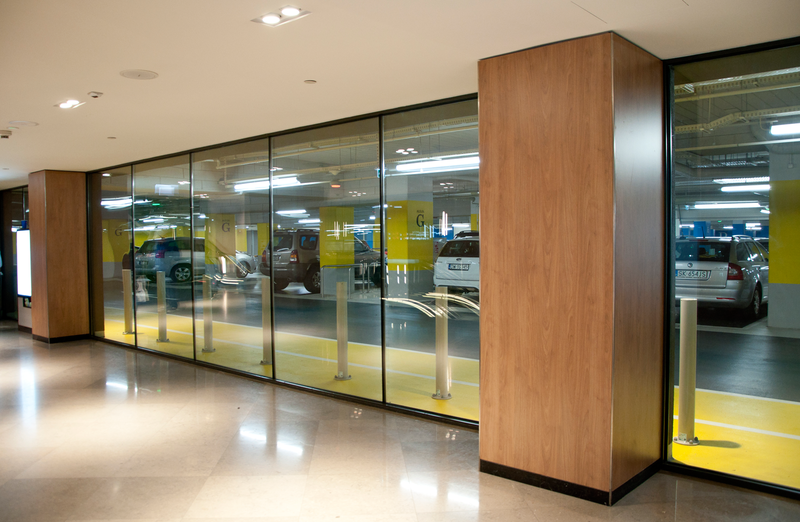 POLFLAM® glass, class EI 60 installed in a frameless system singles out comfortable spaces from the two-storey gallery car park. 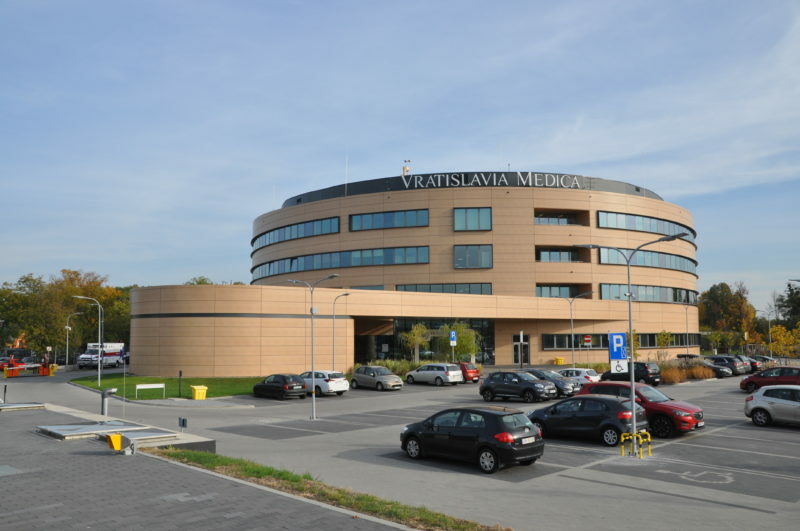 The new building of the Lower Silesian Centre for Laryngology Medicus is the most modern laryngological facility in Lower Silesia. 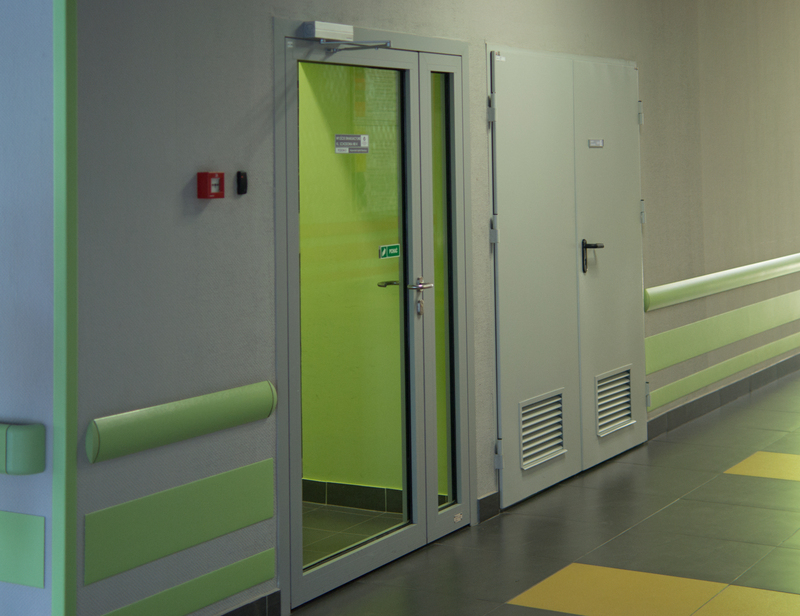 In terms of infrastructure, it meets all the requirements for a hospital facility. 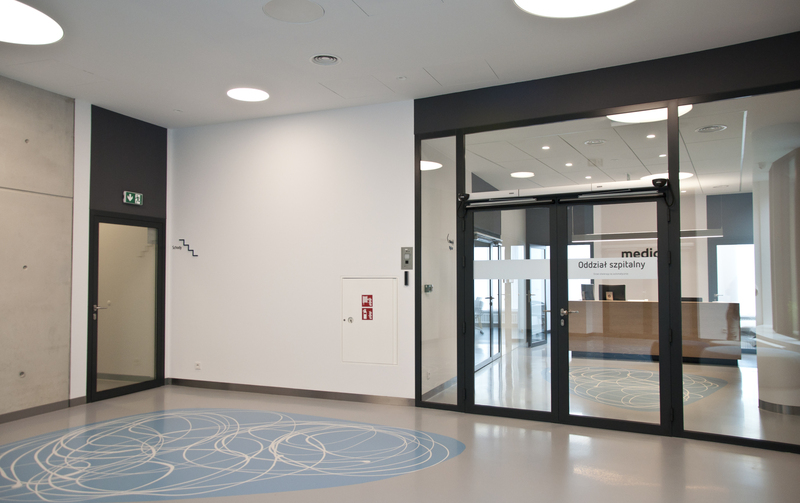 The clinic was designed and built as an intelligent building. 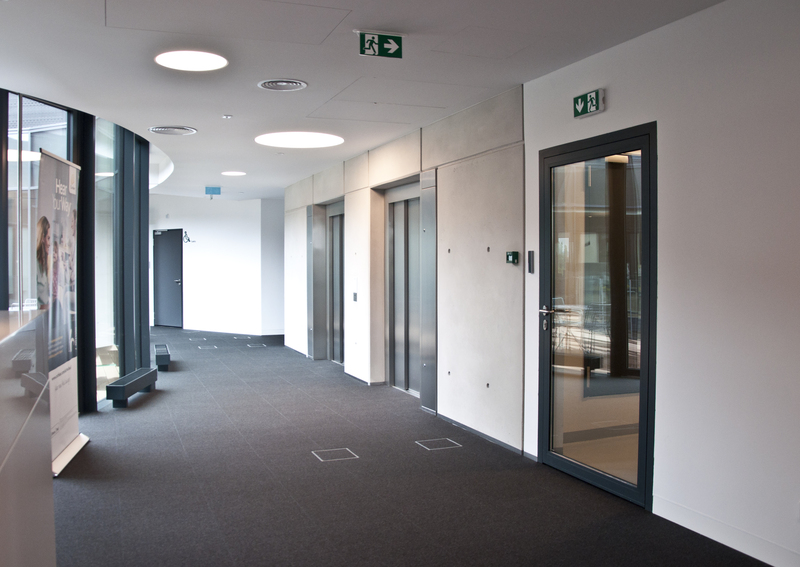 POLFLAM® glass of the EI 30 class was used in fire-resistant doors on all floors of the building. 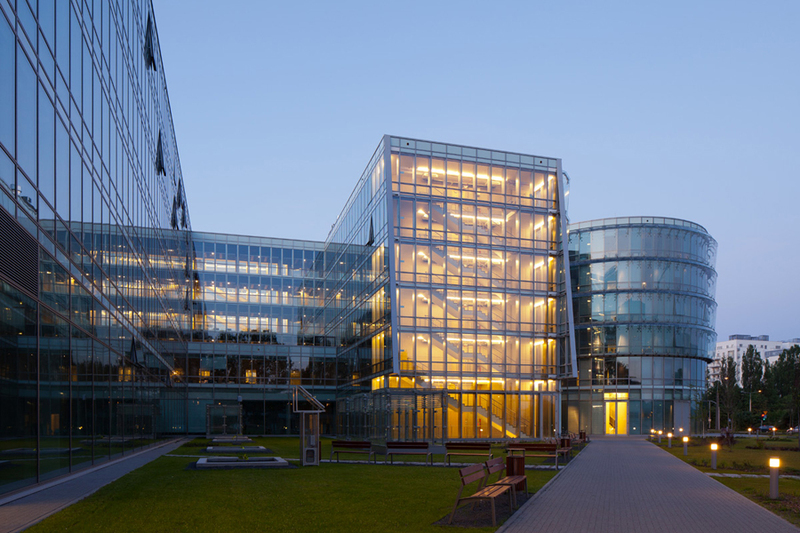 The Business Garden Warsaw is a compact complex of office buildings with a total usable area of 90 thousand sq. 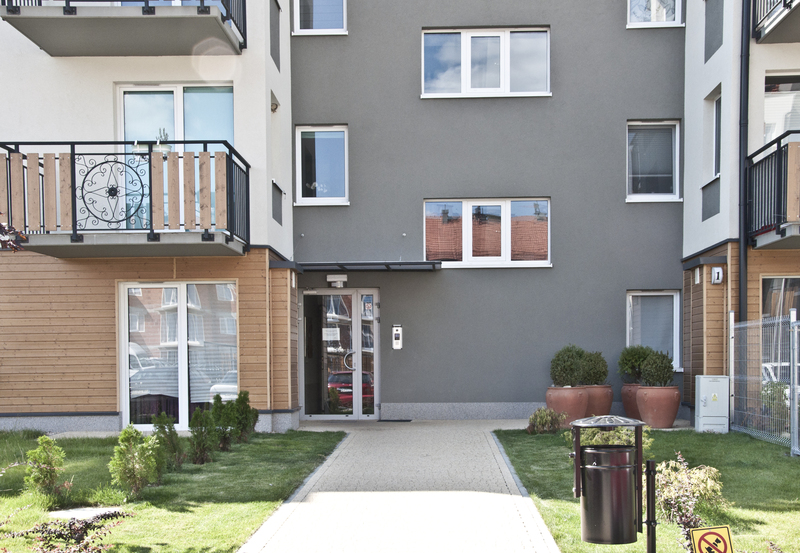 m. It consists of seven medium-height buildings of varied design. The investment was put into use in 2017. The BG complex has come first in the competition "Project: Space", winning the prize of Minister of Environment. 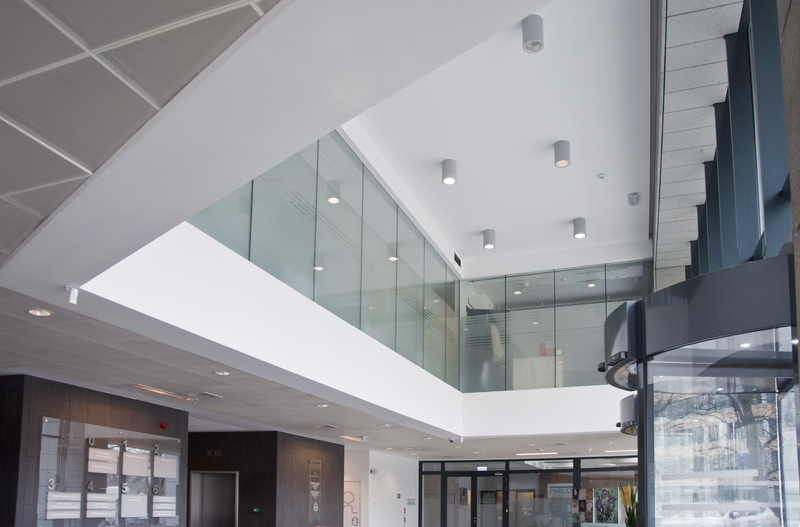 POLFLAM® glass EI 60 was used in one of the buildings in the window separating office space from the main entrance hall. 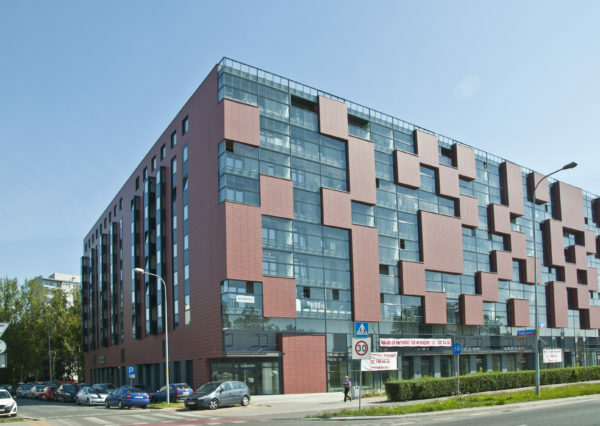 Pixel House is a modern, nine-storey residential building located in one of Wroclaw’s highways. 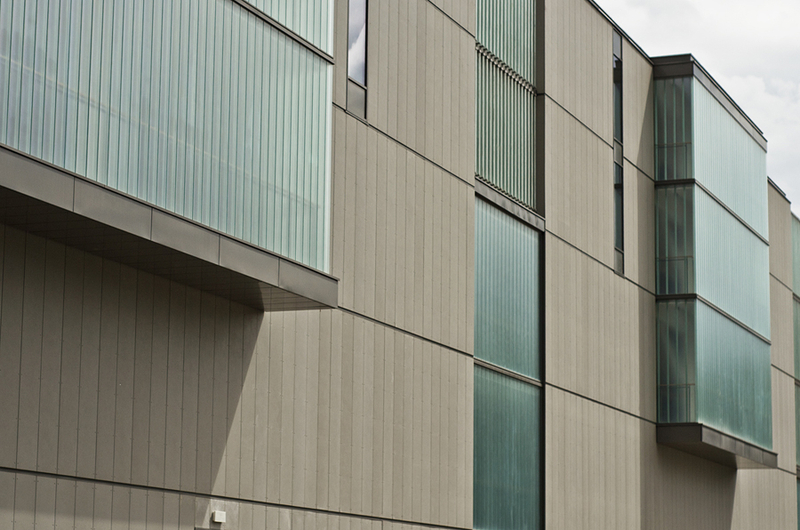 A number of interesting solutions have been applied there using glass, including soundproof windows in the facade. 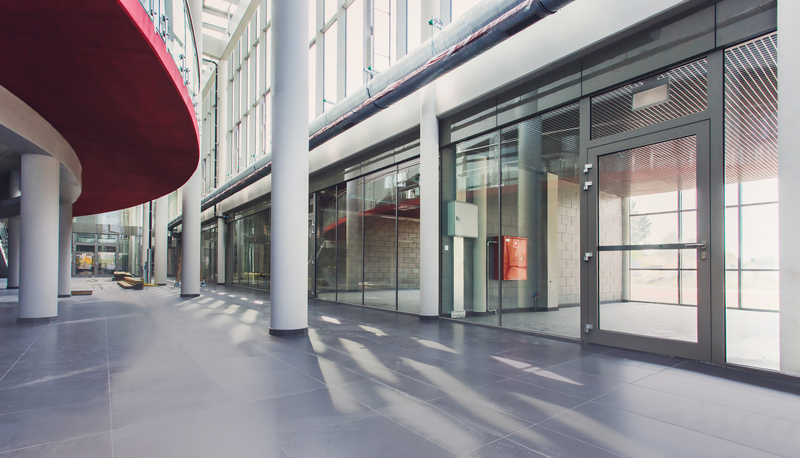 POLFLAM® glass EI 30 was used in the fire-resistant doors and display windows inside the building. 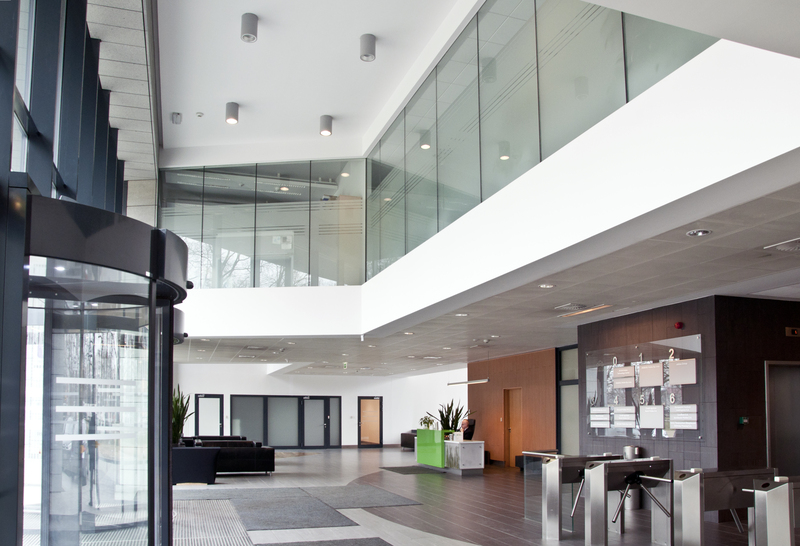 POLFLAM® BR EI 30 fire-rated glass was used in internal glazing separating office rooms and conference halls from passageways. 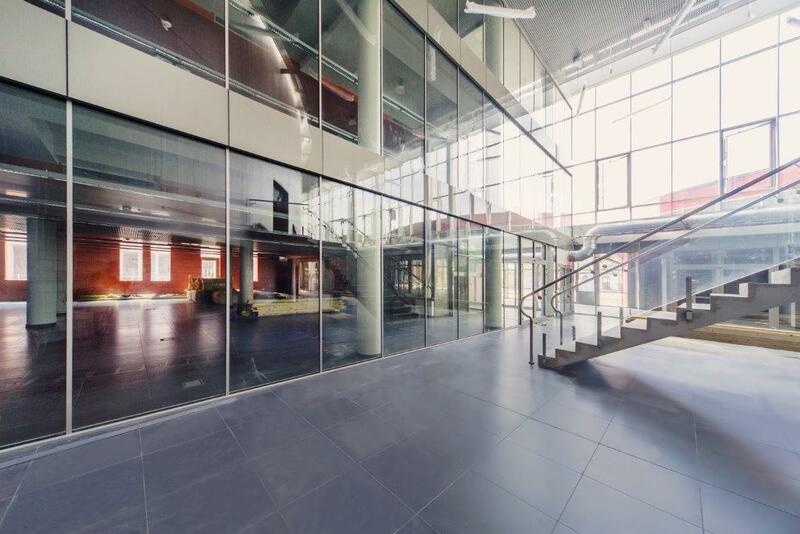 The glass walls not only brightened these rooms from the side of the indoor hall, but also allowed to achieve the effect of lightness of the steel structure of the building. 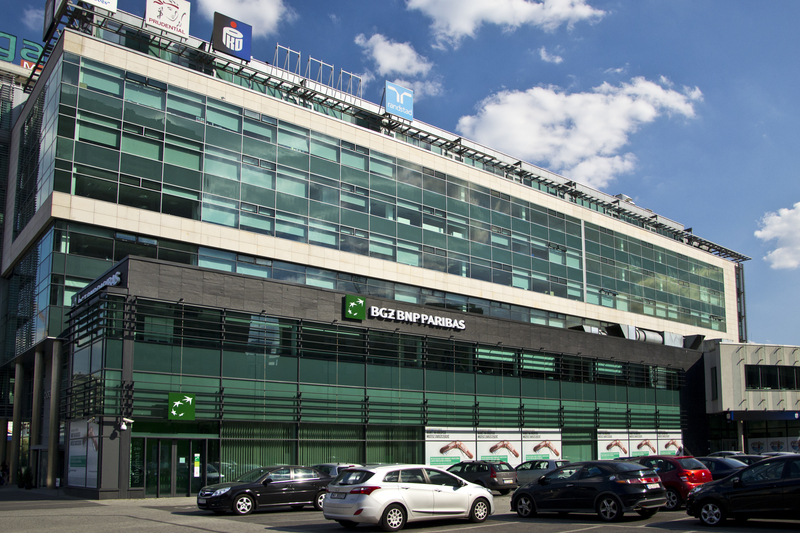 The IBM Innovation Centre is the most modern facility of the Technology Park in Brno, built in accordance with the latest office architectural trends. 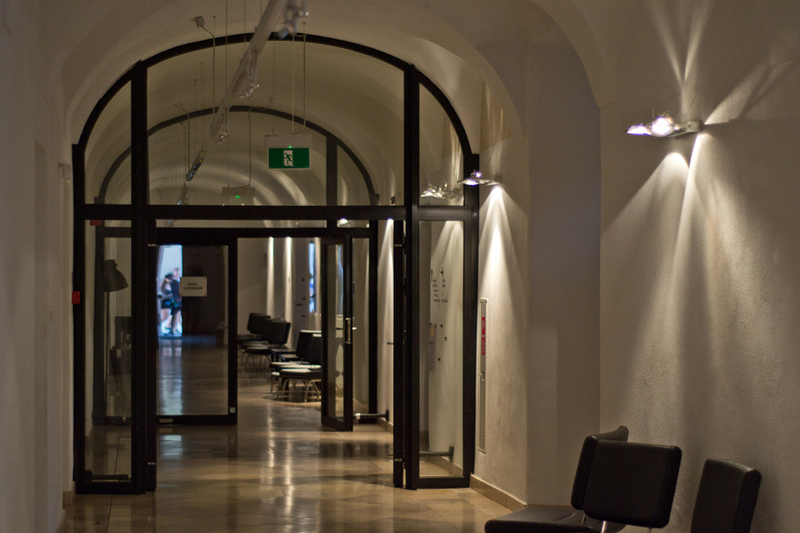 In addition to the rooms associated with research activities, there are also spaces for informal meetings and creative activity. 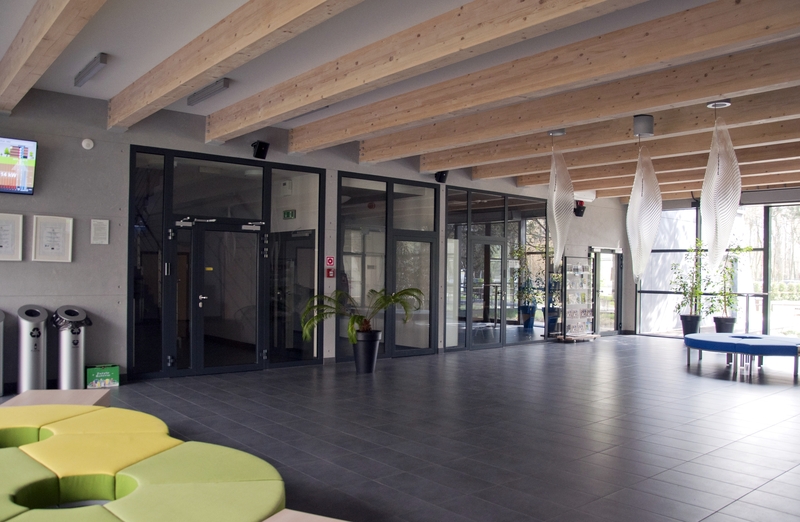 POLIFAM® glass of the EI 30 class was used in the Brno Innovation Centre. 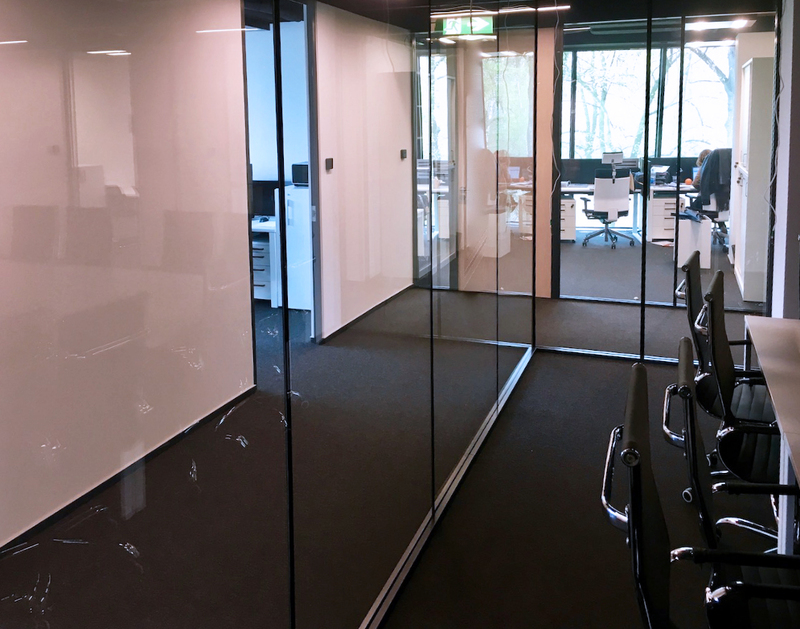 In the new EuroTrafo company office building, POLFLAM® BR EI 30 fire rated glass was used to separate office and conference rooms. 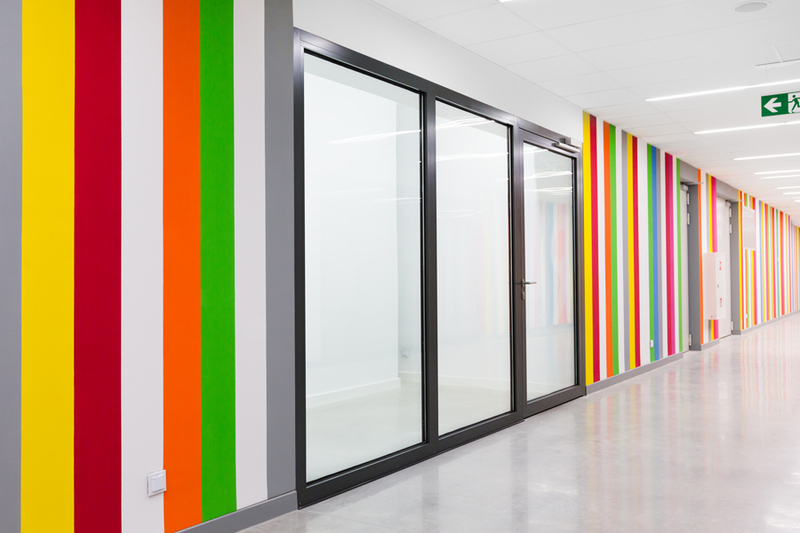 The walls were mounted in a frameless system without mullions. 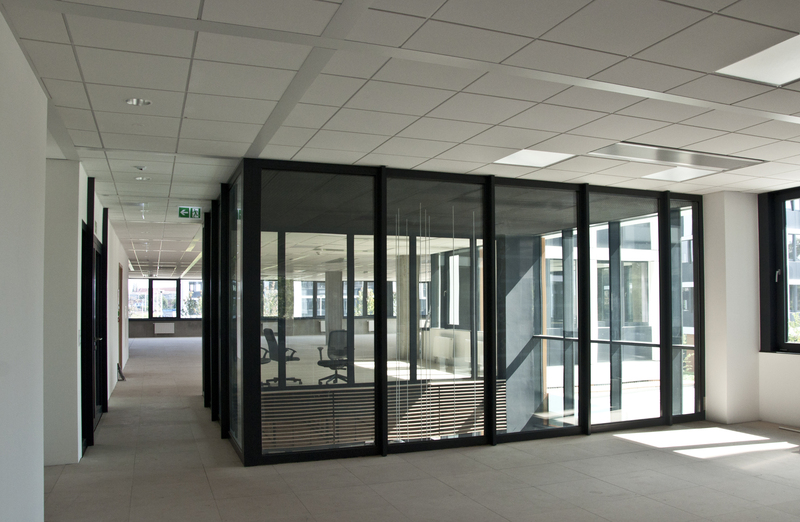 Lightweight glass partitions allowed for maximum use of daylight in the interior of the building. 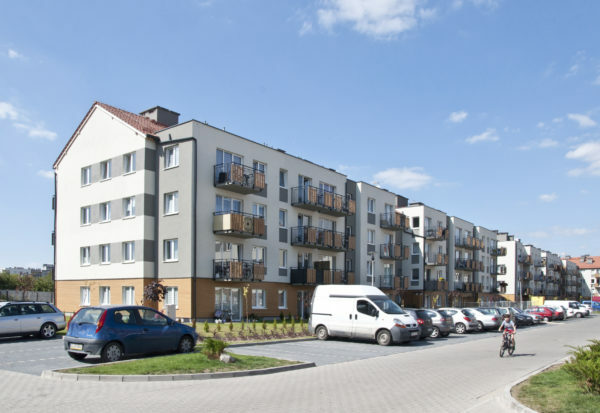 Nowa Toskania is a new, cosy estate of residential houses at the outskirts of Wrocław. 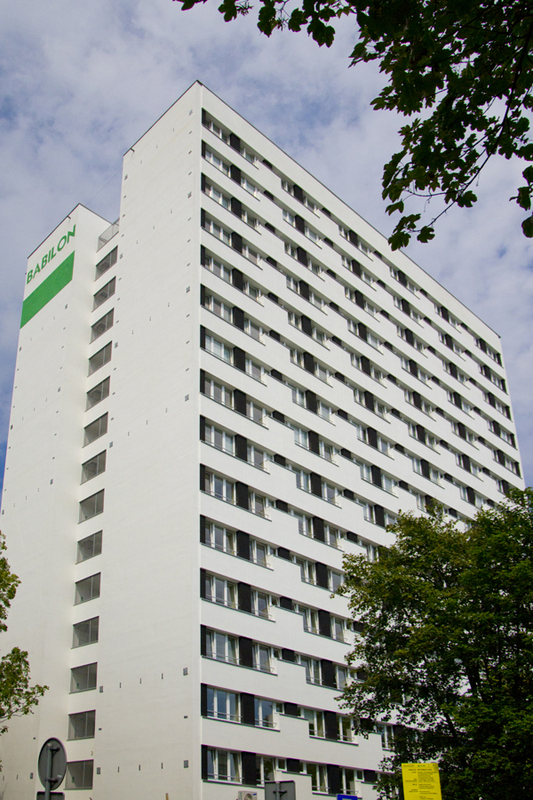 It comprises eight modern buildings with 740 flats. 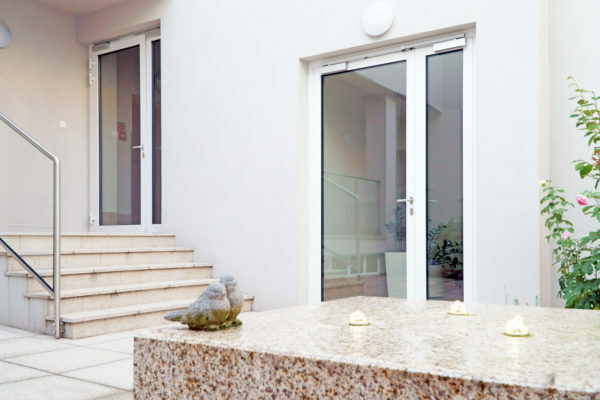 The buildings, phase 1, doors and staircases feature POLFLAM® glass EI 30. 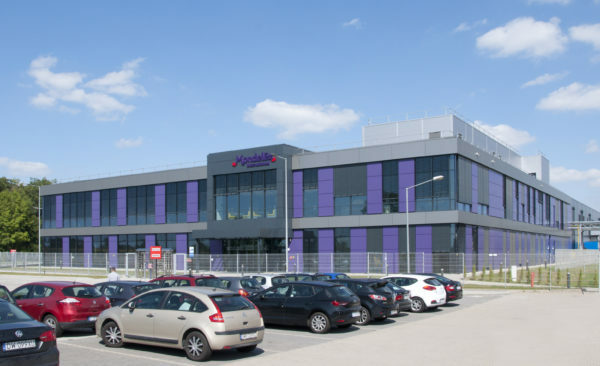 The Wrocław plant of Mondelez has opened a new Research, Development and Quality Centre which is one of the latest-technology R&D facilities globally. 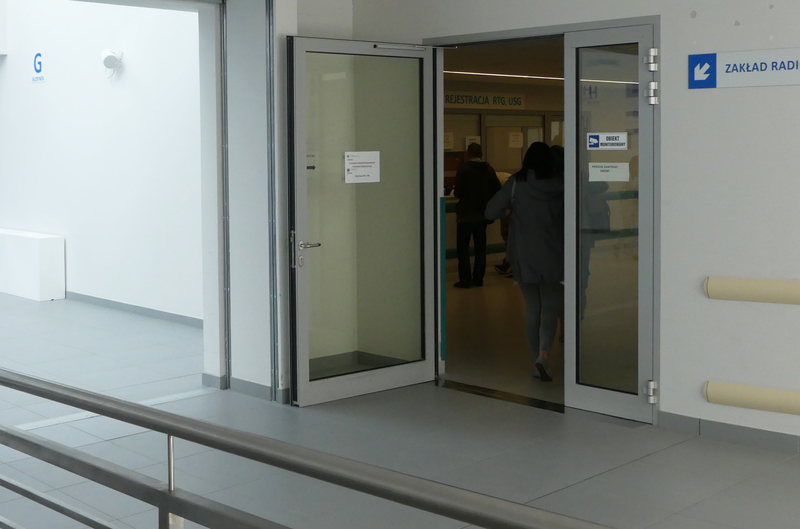 POLFLAM® glass has been used in the indoor glazings of its laboratory spaces. 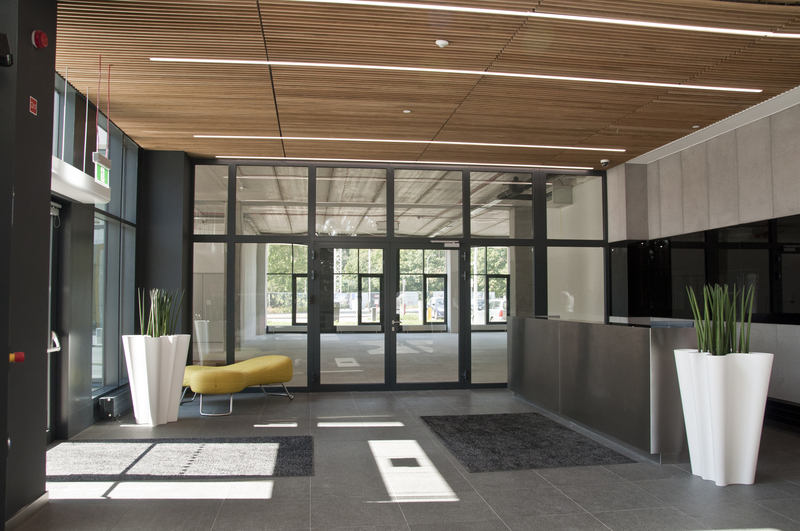 The new building’s typical features are not only its perfect design but also some latest functional solutions, like the glazed ceilings and walls of the inside patio, to name one. 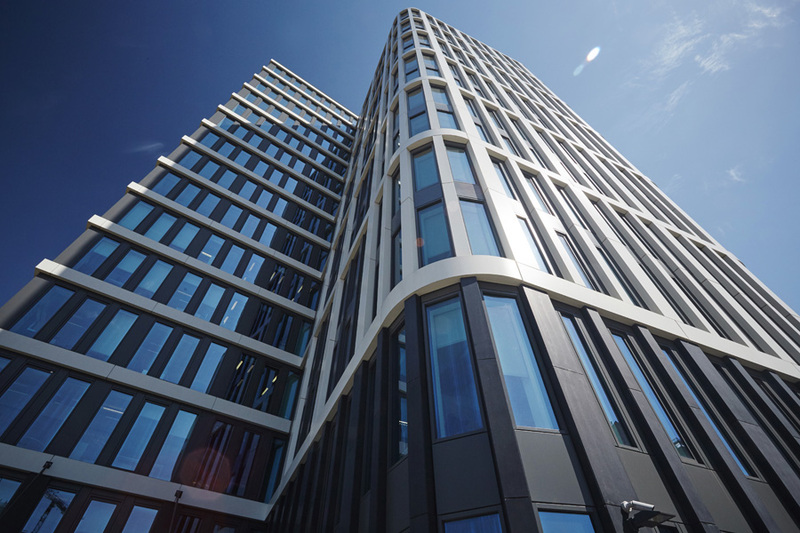 POLFLAM® F glass of the EI 30 class has been applied at each floor. 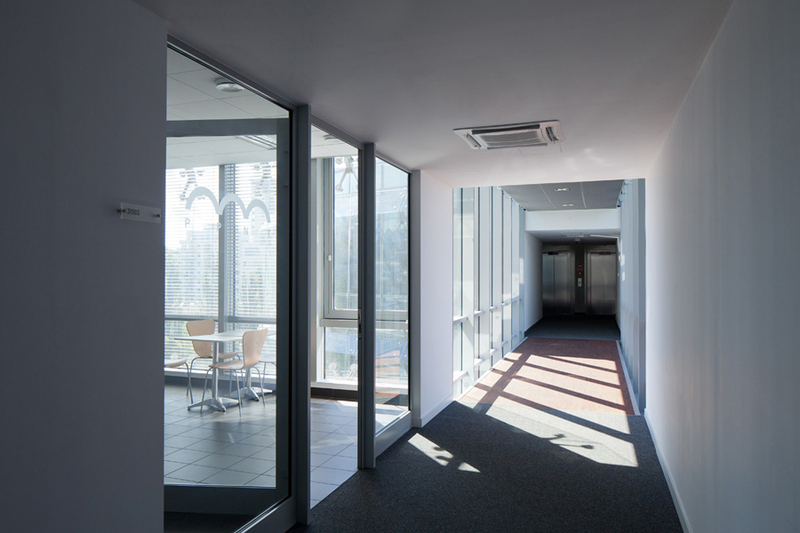 The transparent indoor partition has made the corridors at each floor saturated with daylight. 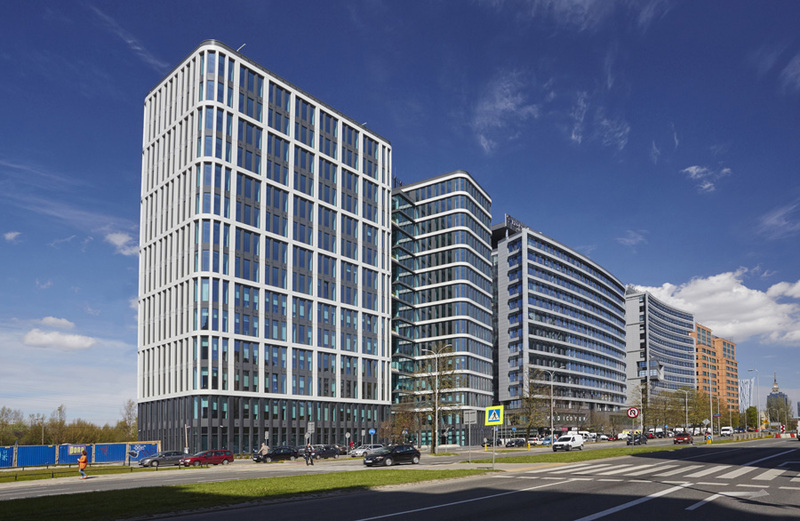 The Nicolas Business Center is one of the most renowned office buildings in Wrocław. 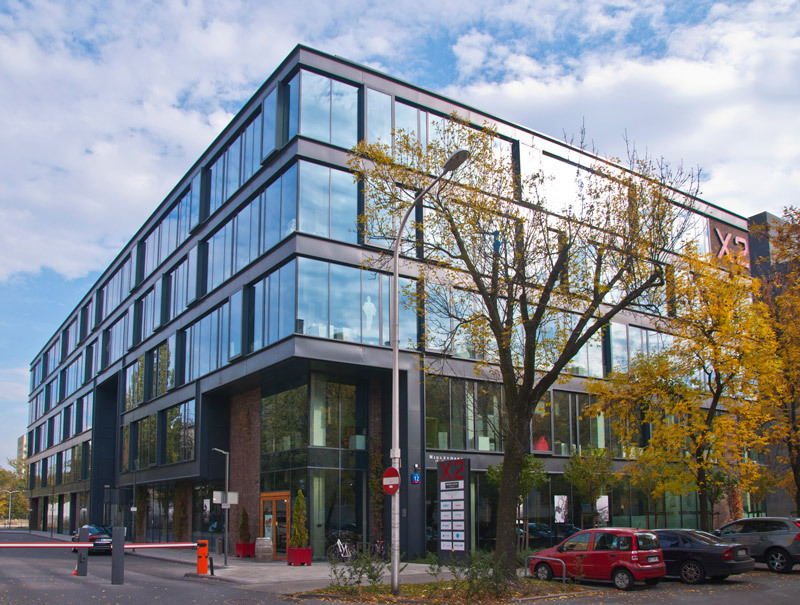 It is a six-floor building featuring creative architectural solutions. 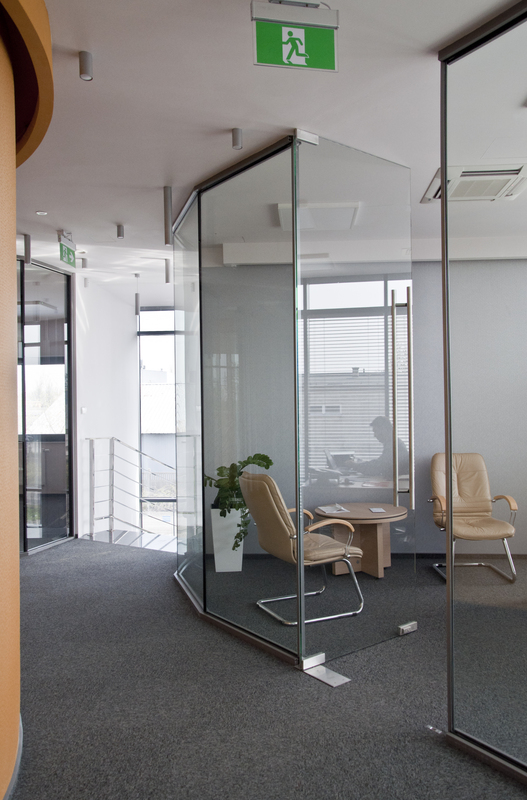 Most of those have been made with a view of having the office spaces saturated with daylight, which means that glazed partitions dominate the space. 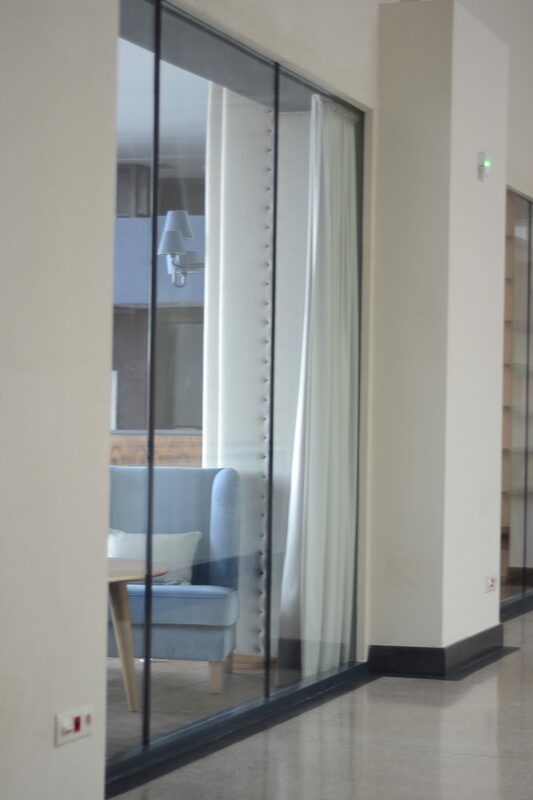 POLFLAM® glass EI 60 has been mounted in glazed indoor windows between the office space and the lobby at each floor, and in fire-resistant doors. 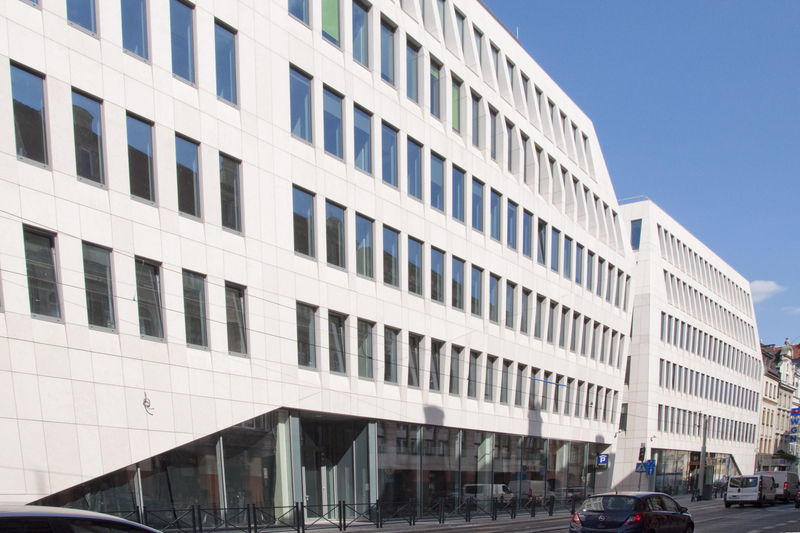 Pegaz is a modern office complex integrated into historic frontage. 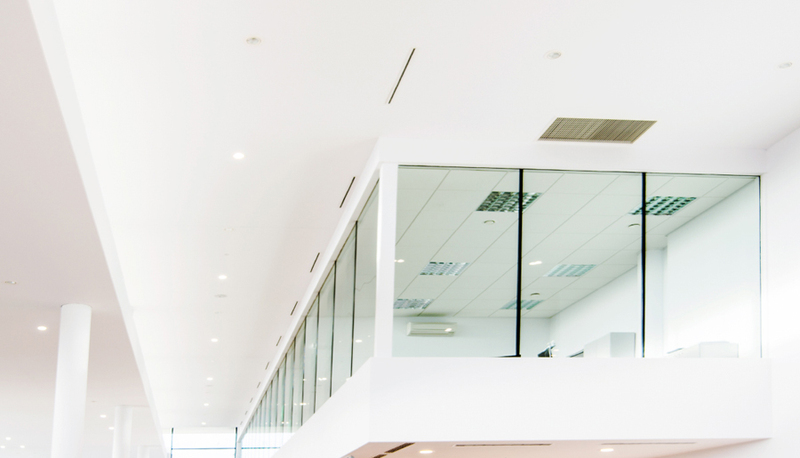 It houses law firms, IT businesses and outsourcing companies. 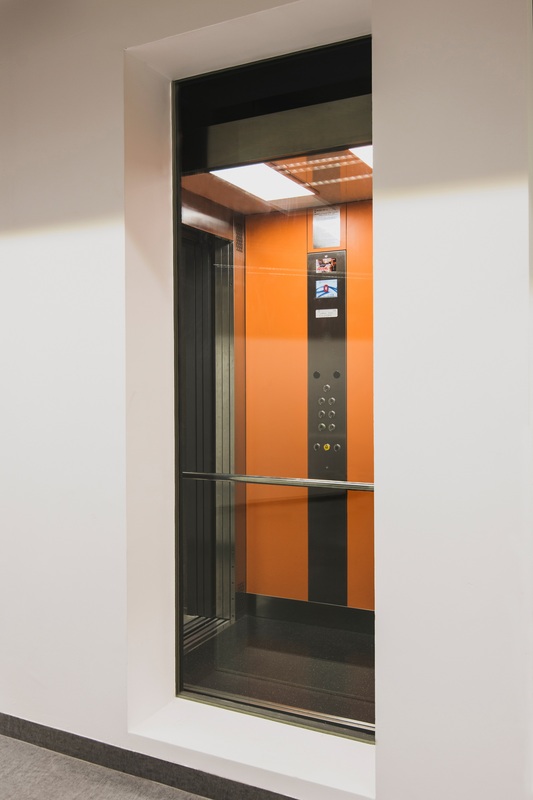 POLFLAM® glass of the EI 60 class has been mounted in fire-resistant doors that separate office space from the lift hall on four storeys of the building. 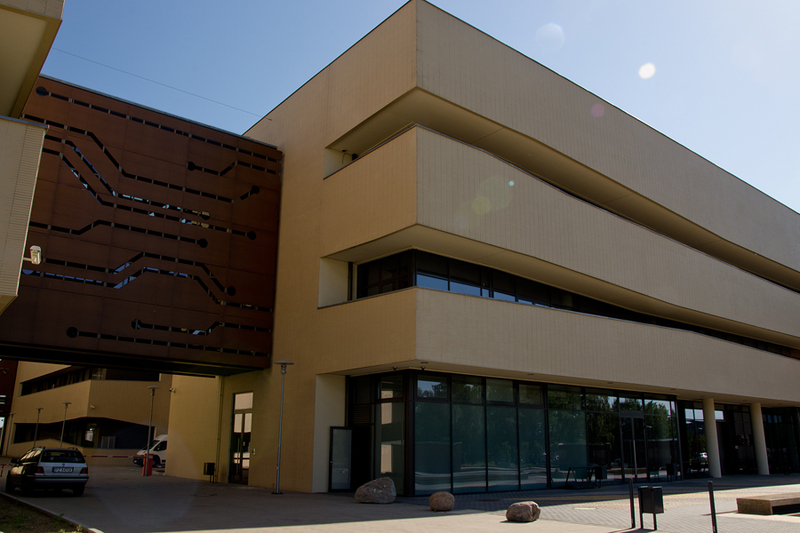 Ślęza is a modern sports centre consisting of a swimming pool, a sauna complex and a training centre. 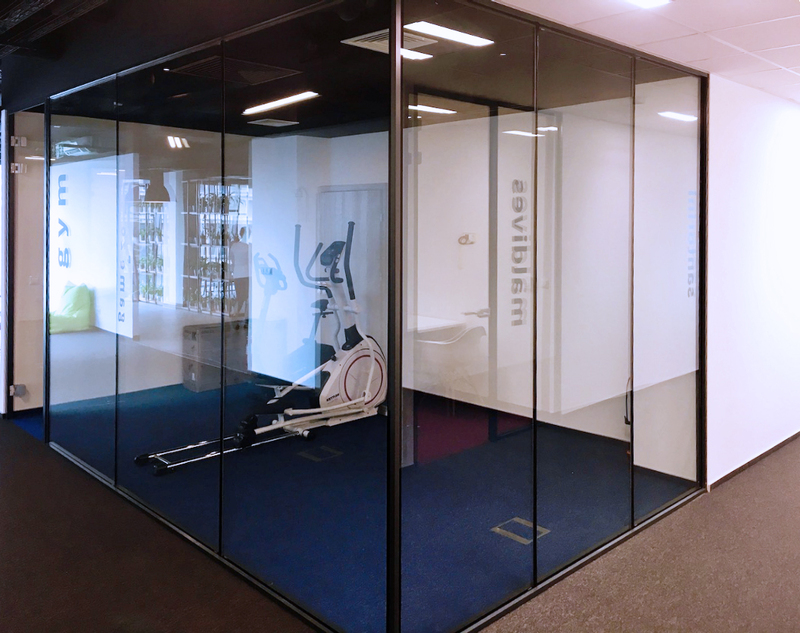 POLFLAM® EI 30 glass has been applied in a glazed partition that separates the spinning room from the reception and the corridor. 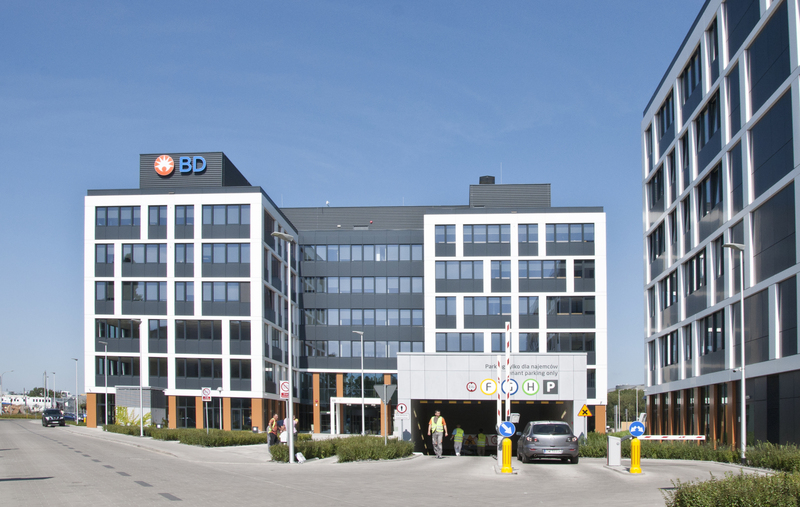 Business Garden is one of Wrocław’s newest office complexes. 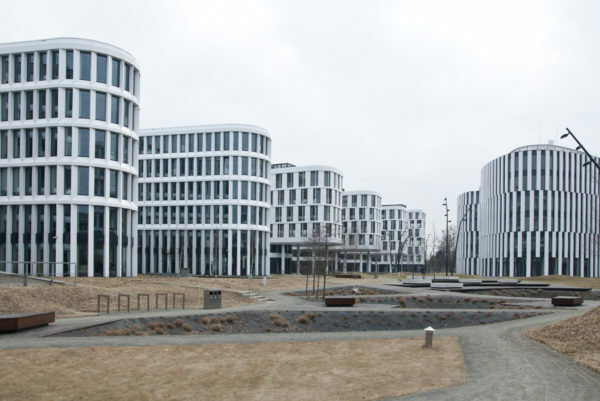 It features 117.000 sqm of modern office and commercial space: nine office buildings, a restaurant and a garden. 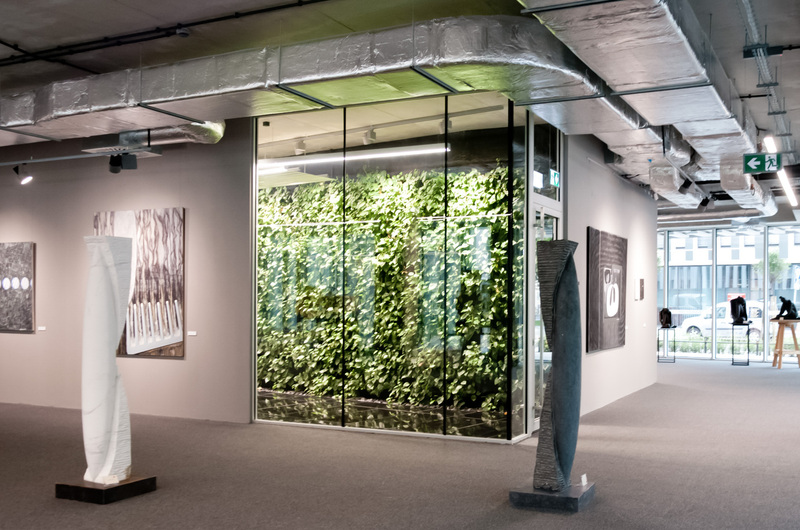 The architects’ purpose was to create environment-friendly solutions with indoor spaces that provide superior light saturation which, in turn, qualifies the investor for obtaining the LEED Platinum certificate. 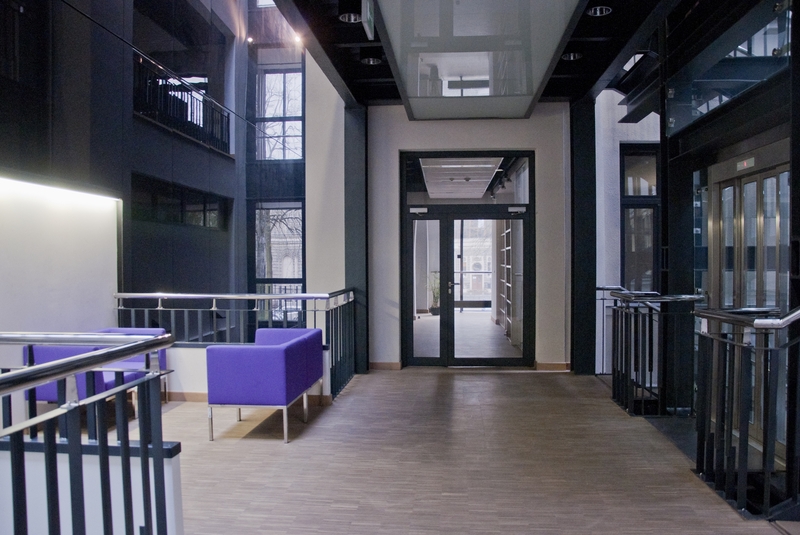 POLFLAM® EI 30 glass has been used in doors and windows above the main hall on six storeys of the G-H building. 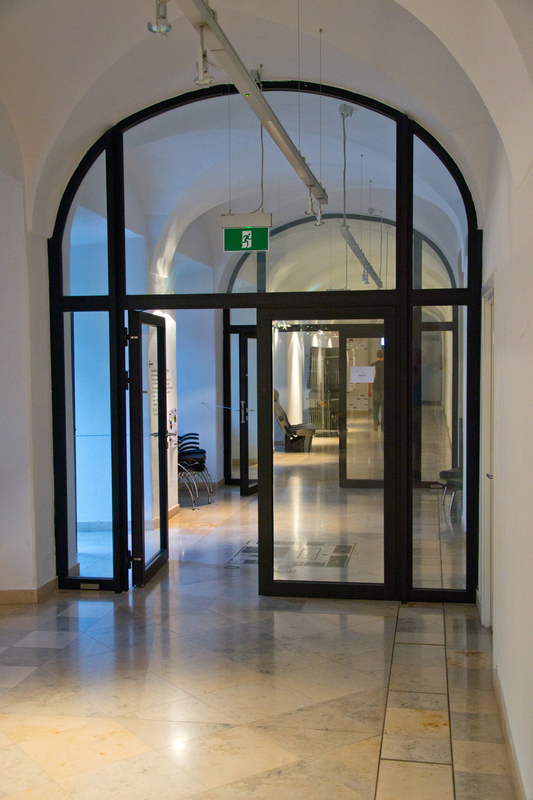 Drn is part of the revitalisation plan of the historic districts of the Czech capital. 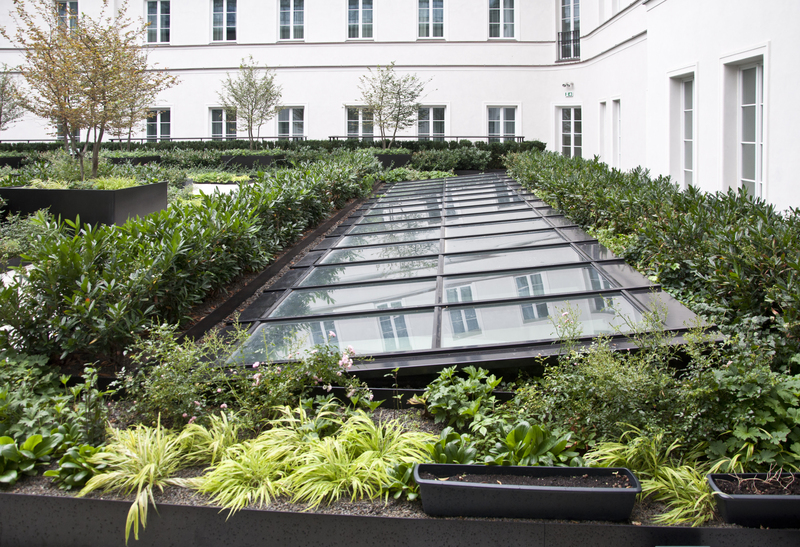 The project features both a newly erected building with a glazed façade in metal structure covered in verdure, and a thoroughly renovated baroque Schönkirch palace. 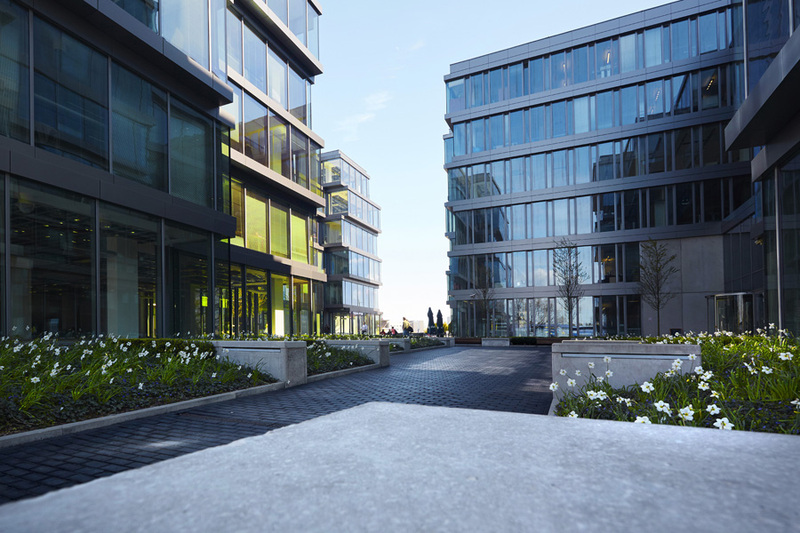 The building combines two functions: office and commercial. 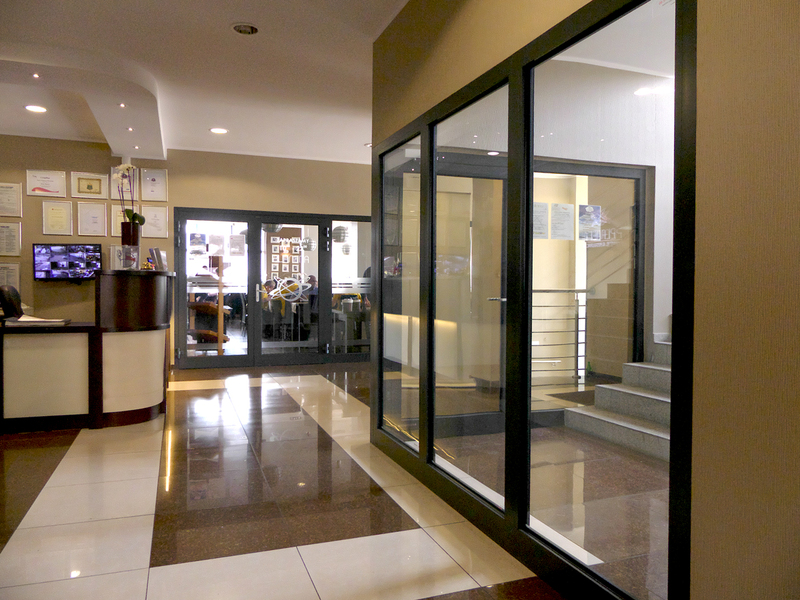 POLFLAM® EI 60 glass has been applied indoors. 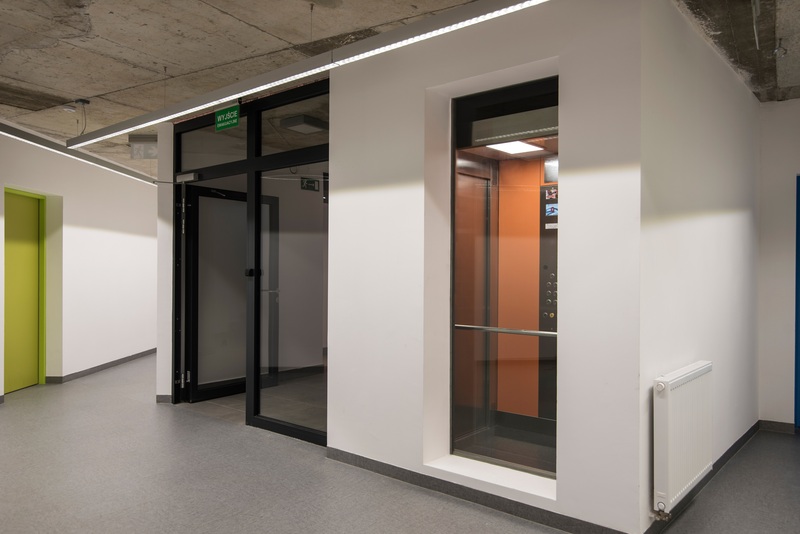 A total of 150 sqm of glass in steel frames has been mounted in the doors giving to the staircase on seven storeys, and in the glazings in concrete walls. 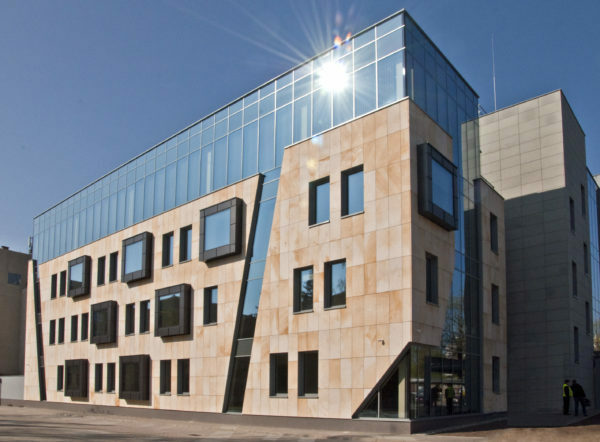 The office complex “Za Bramką” has been built in the Poznań Old Town. 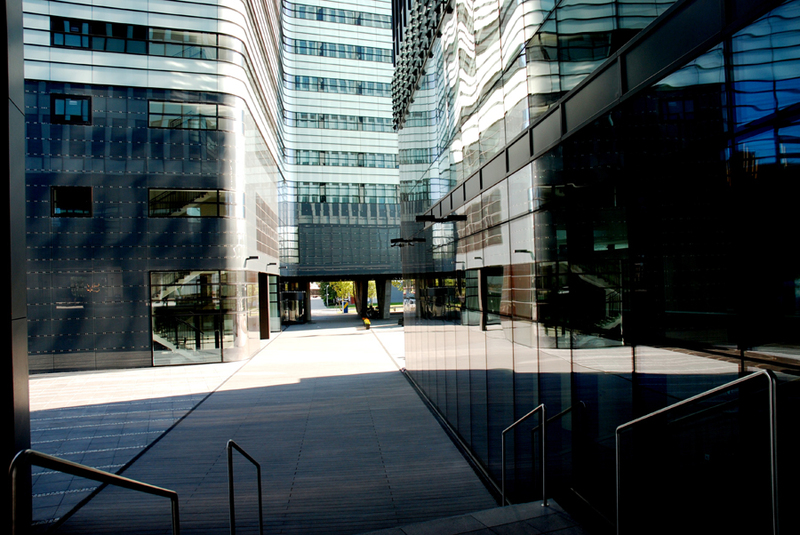 It has four over ground and three underground storeys which provide 18.000 sqm of usable area. 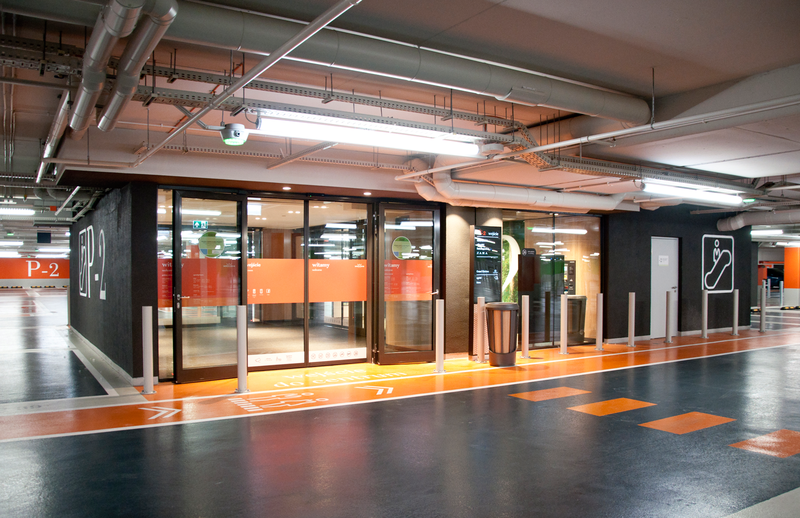 POLFLAM® EI 30 glass has been used for glazed fireproof partitions with doors between the hall and the underground car park. 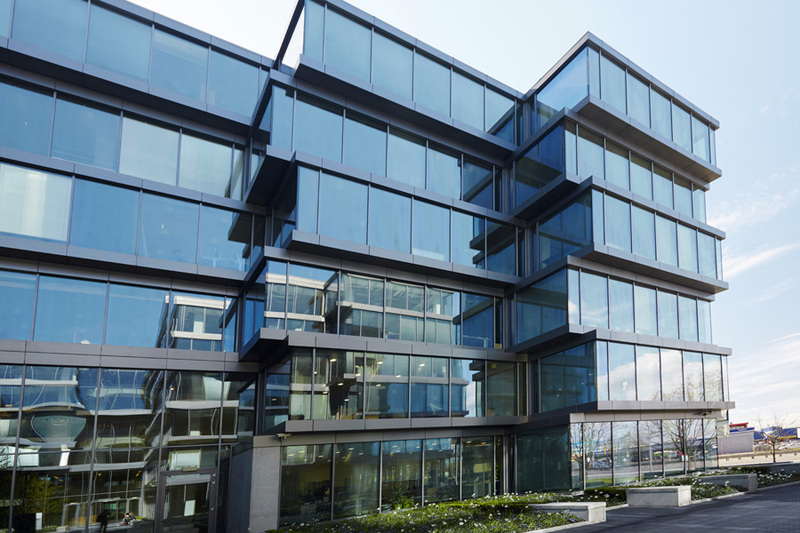 The eight-storey-high building, offering more than 6.000 sqm of office space, has been designed for rent. 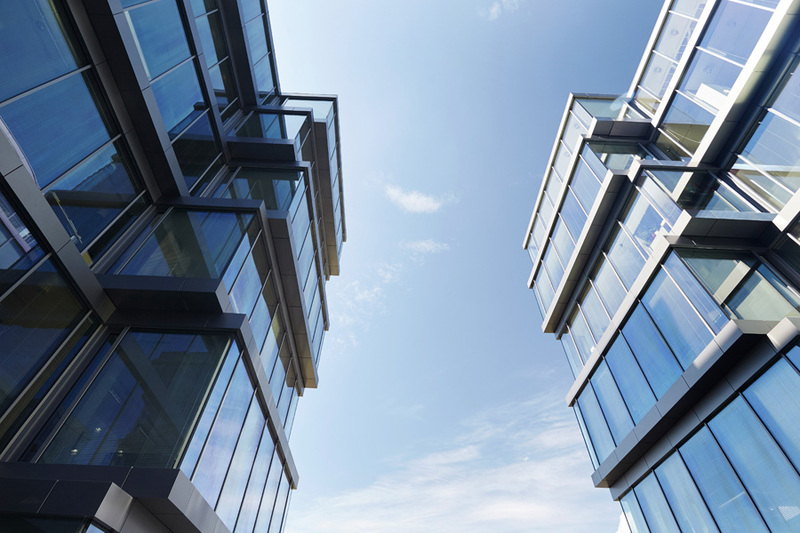 Each storey’s open space has been arranged to meet the needs of the particular company renting it. 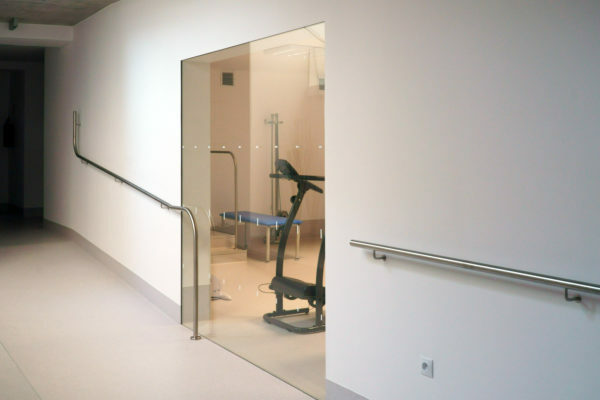 On one of the floors, various functional areas have been singled out with fire-resistant frameless partitions. 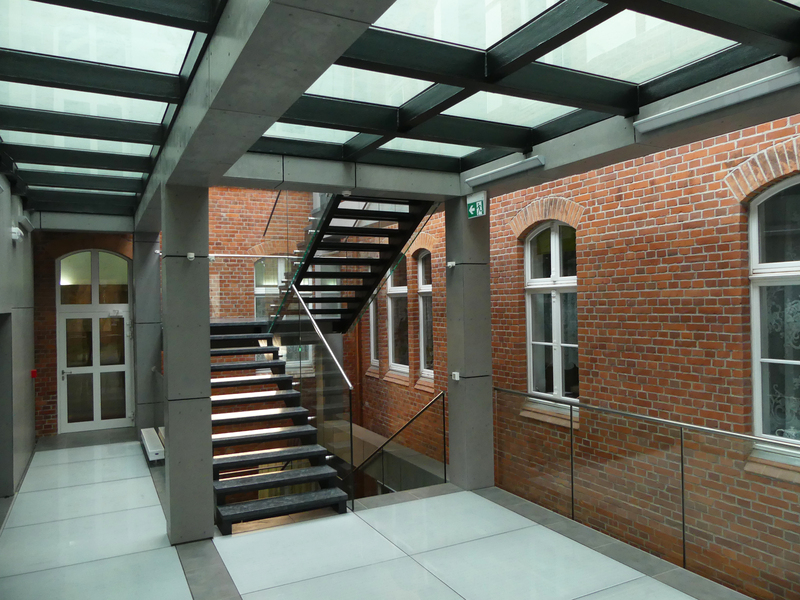 Over 100 sqm of POLFLAM® EI 30 glass was used there. 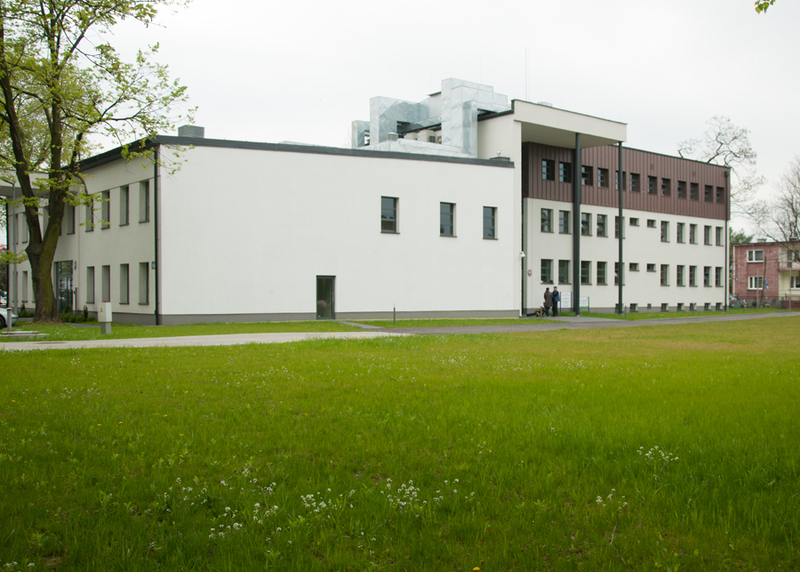 The USK is currently the largest and the most modern hospital in the region of Podlasie. 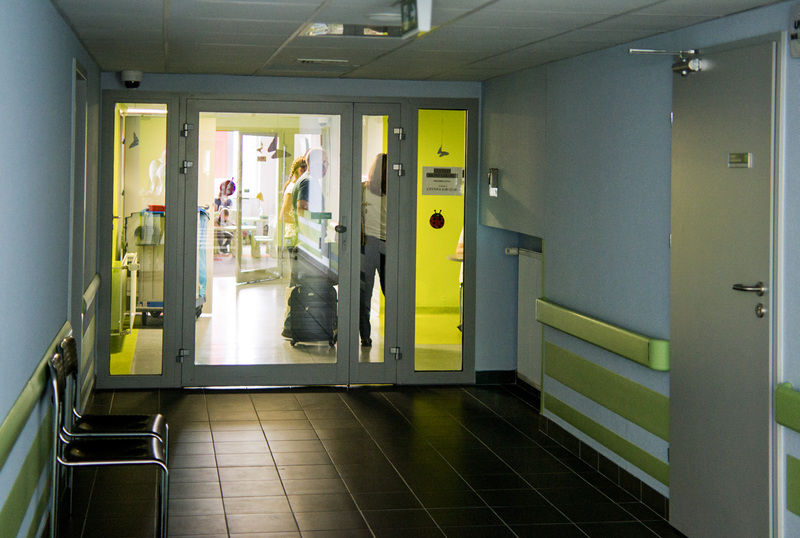 Since 2008, it has been carefully modernised and refurbished, resulting in doubling the hospital’s surface. The cost of the project was as high as PLM 500m, the investment being one of the region’s priorities. 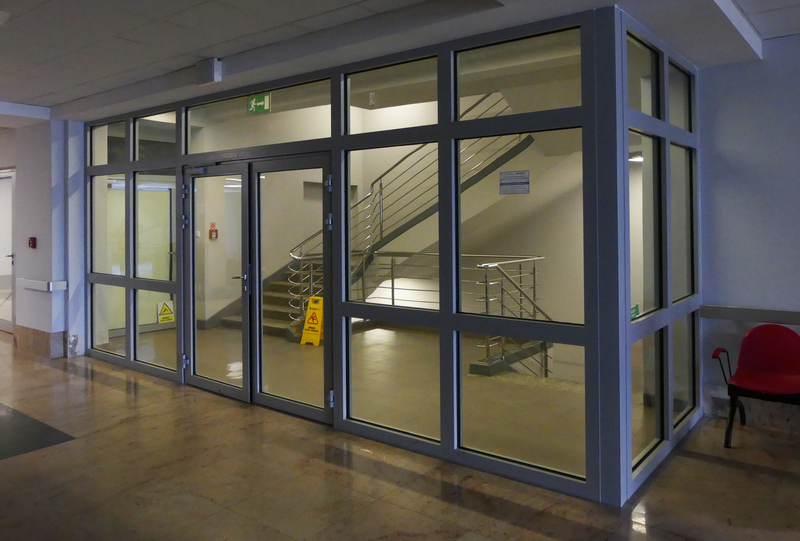 POLFLAM® fire-resistant glass has been fixed in the partitions and doors that close the staircase, which serves as an emergency exit. 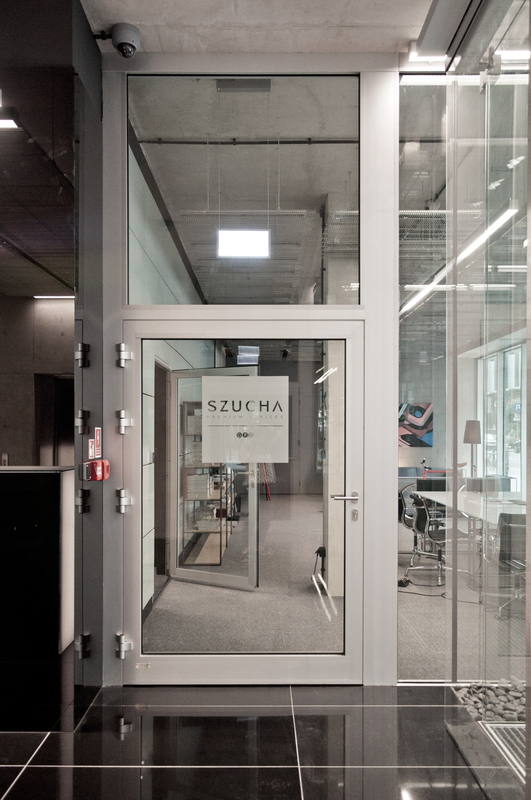 The Szucha Corner is a modern office building erected in one of Warsaw’s most prestigious locations. 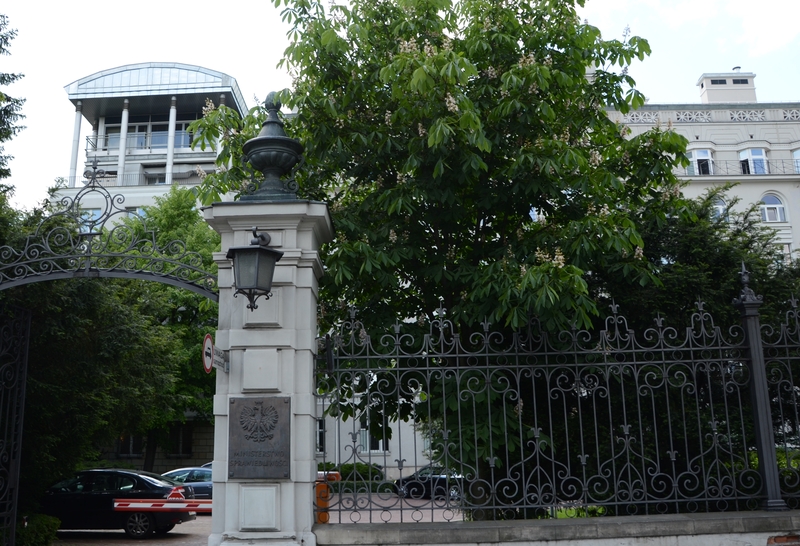 Today, the well-restored pre-war buildings of the Szucha Avenue house the key state administration and diplomatic offices. 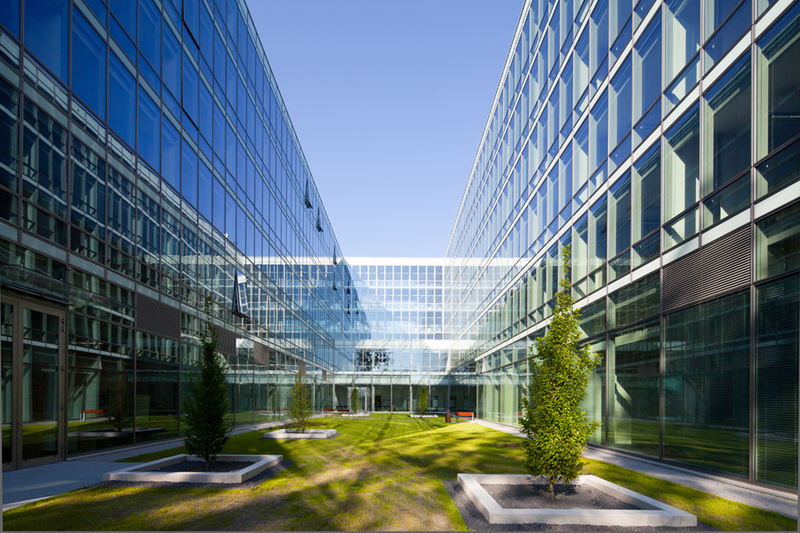 Light, glass and verdure are the dominating factors in the building’s architecture. 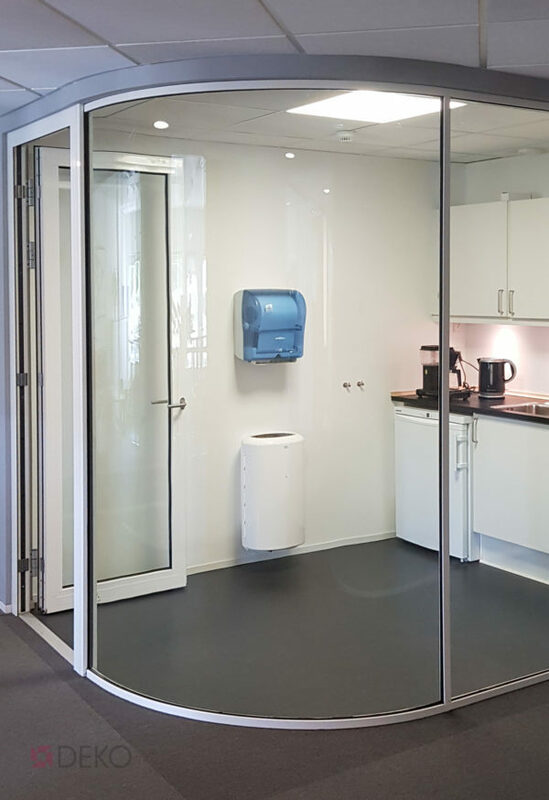 POLFLAM® EI 30 and 60-class glass has been mounted in frameless glazed partitions and fire-resistant doors inside the building. 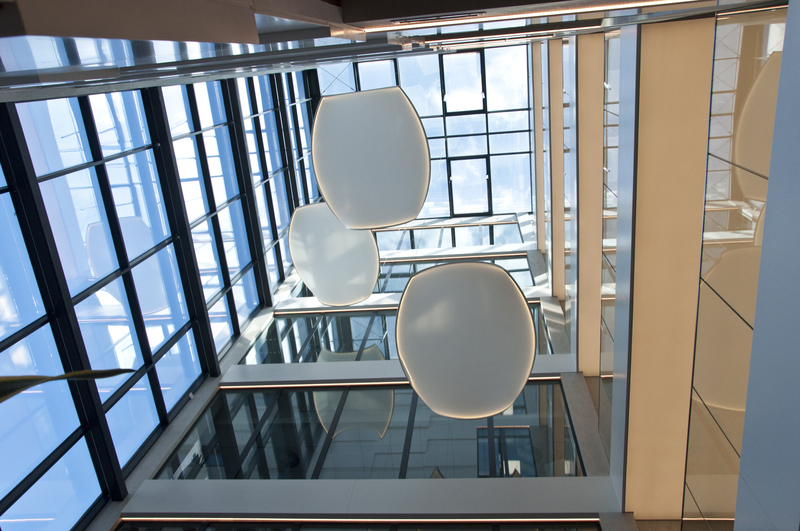 Application of fire-resistant glass made it possible for daylight to saturate the corridors and the staircase on each floor. 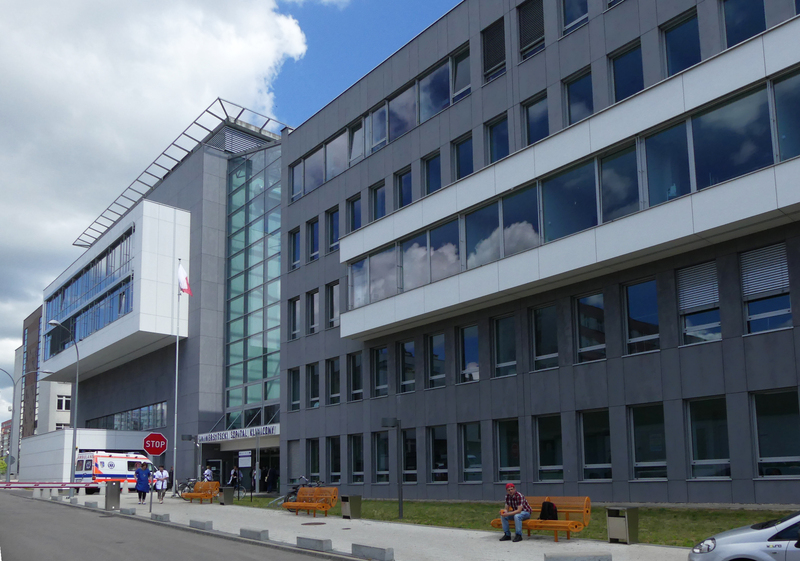 The Bydgoszcz hospital has recently undergone complete reconstruction. 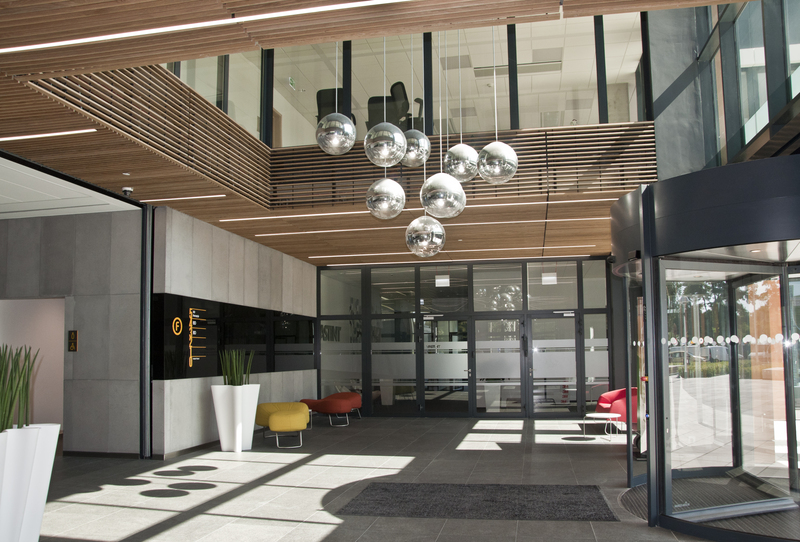 A 19th century historic hospital has been revitalised, the other buildings being demolished and a new medical park being built, meeting the requirements of a modern medical facility. 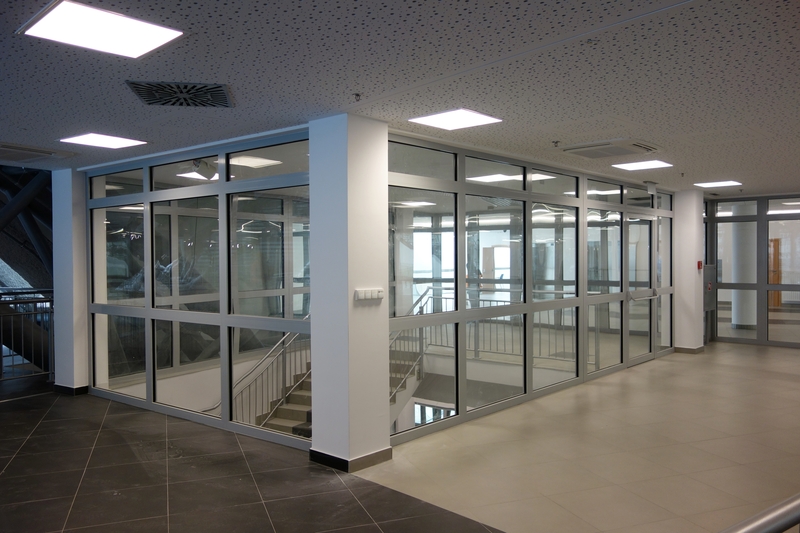 The construction is one of the biggest medical investments in Poland with a value of PLN 155 m.
POLFLAM® glass of the EI 30 class has been used in fire-tight partitions with doors separating each section of the building from the walkways. 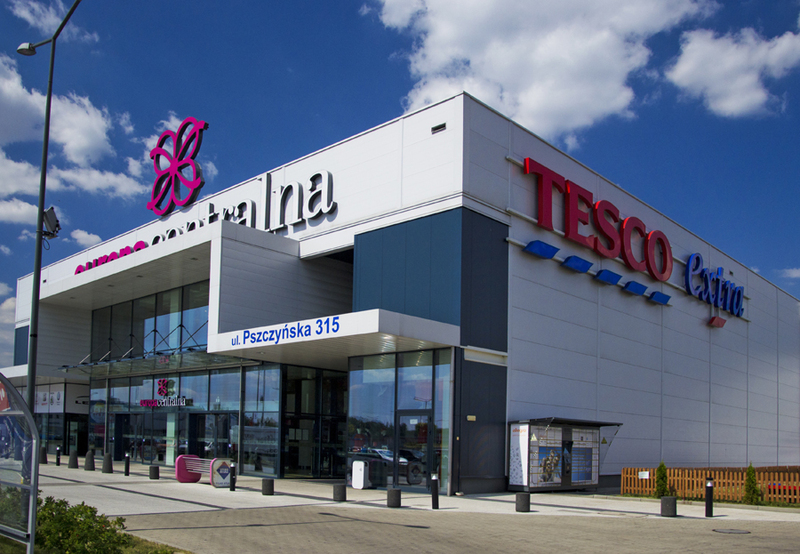 The Garden City is a complex of five modern restaurants created in a revitalised pavilion 15 at the International Poznań Fairs. 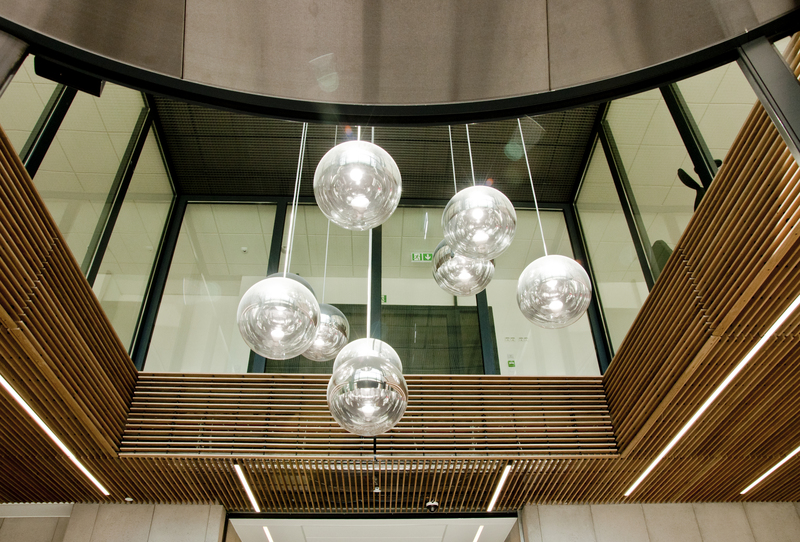 Each hall is on a different floor and each has been designed to represent one natural element: fire, air, sand, water and crystal, where they derive their names from. 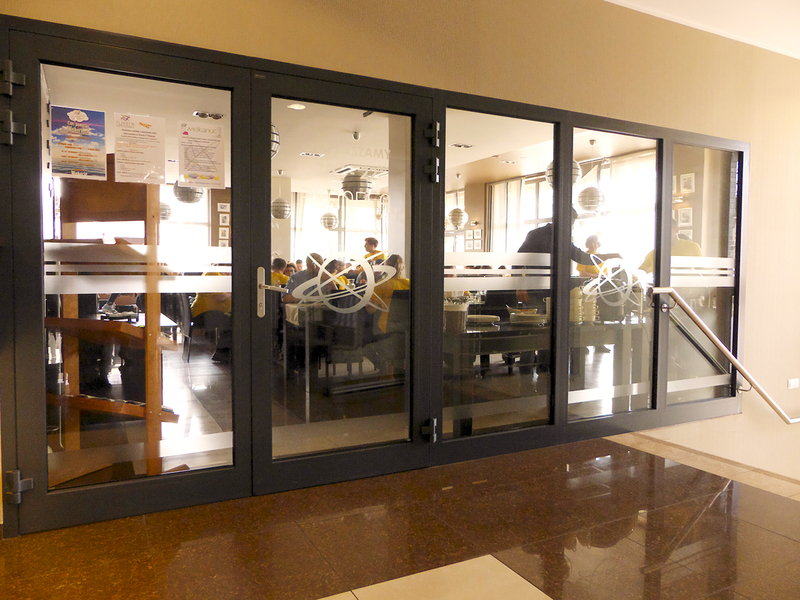 POLFLAM® BR glass of the EI 30 class was used in a frameless system of walls separating the restaurant rooms from the hall. 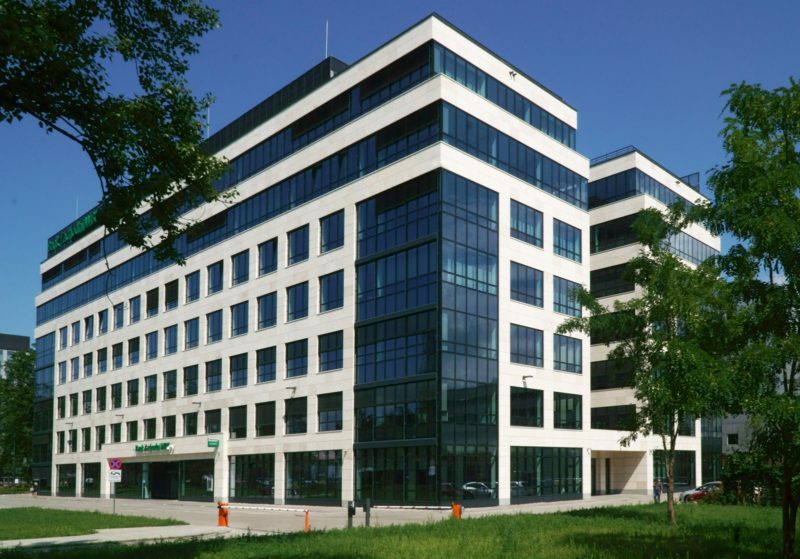 New premises for the Łódź WOŚiGW was built as the most pro-eco building in the region. 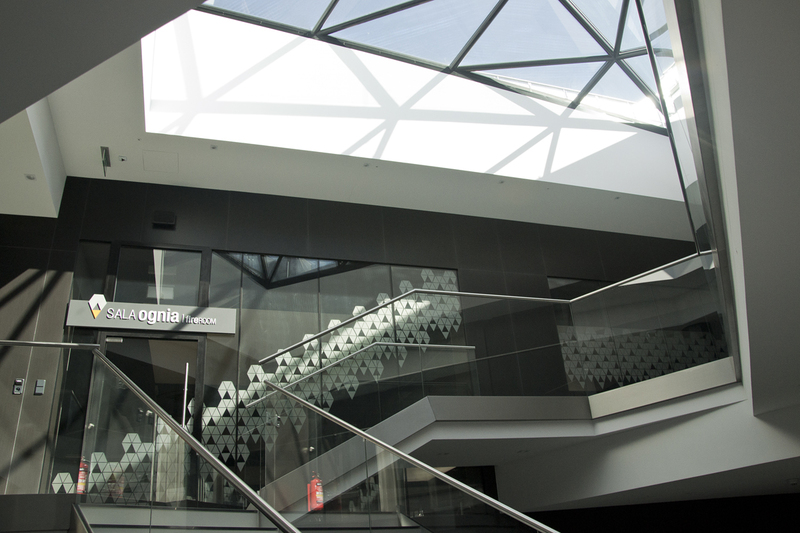 On its four storeys, it houses offices and conference and show rooms. 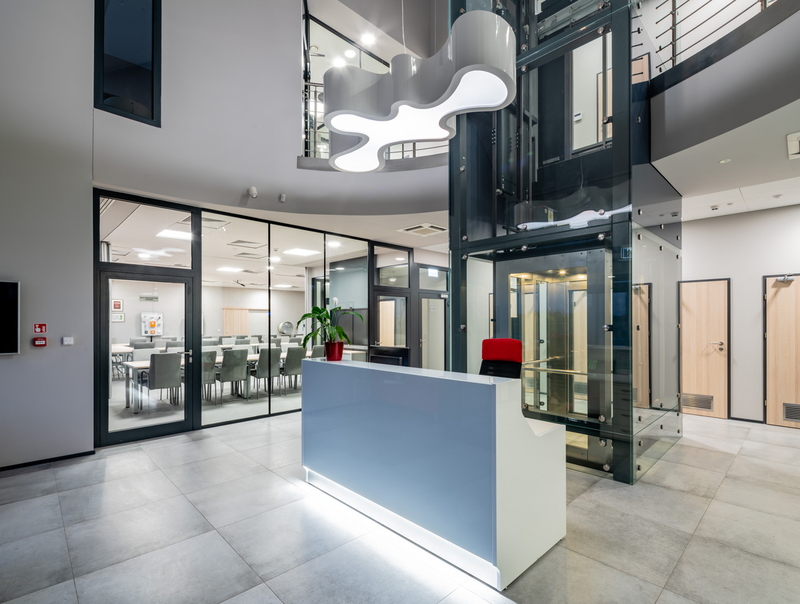 POLFLAM® glass, class EI 30 and EI 60 in aluminium frames was used to make fire-resistant partitions separating the reception hall from the conference room and the staircase on the ground floor, as well as the staircase from corridors on the other floors. 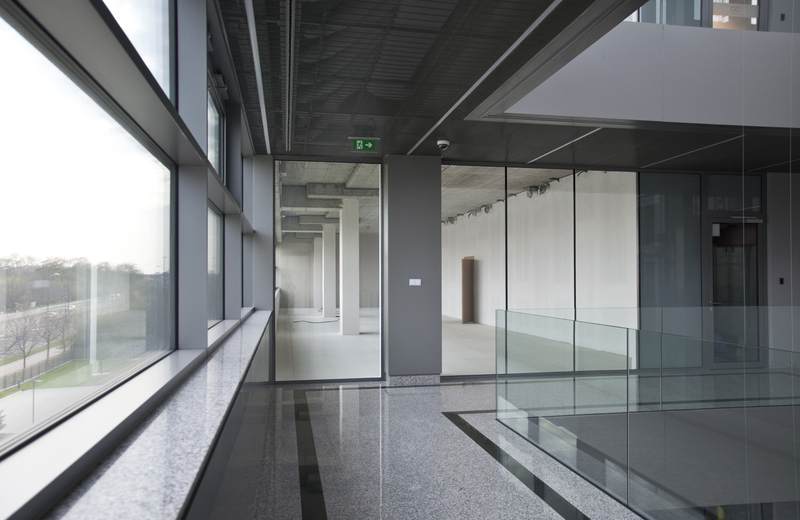 Total surface of the POLFLAM® glass-glazed walls is 270 m2. 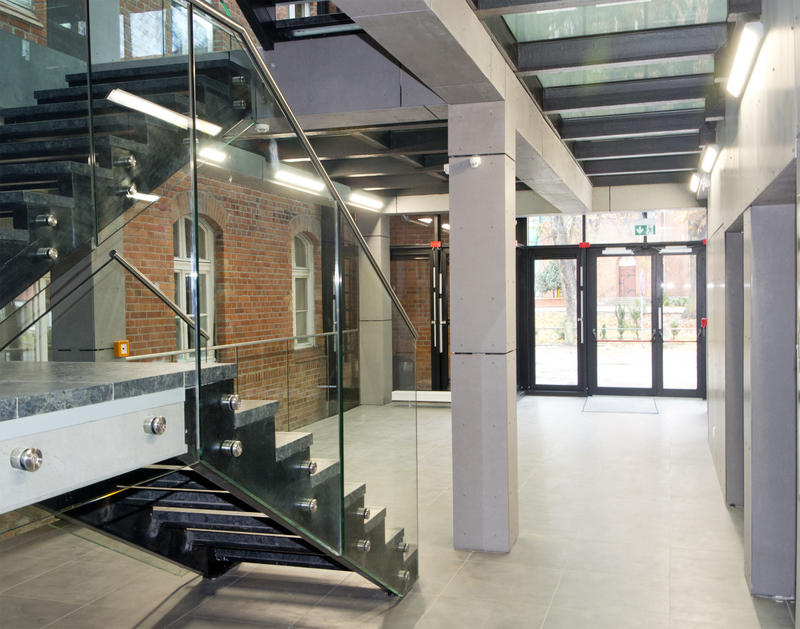 The new premises of the Academy of Music have been made of a revitalised tenant house and a brand-new modern building, both joined with glazed roof. 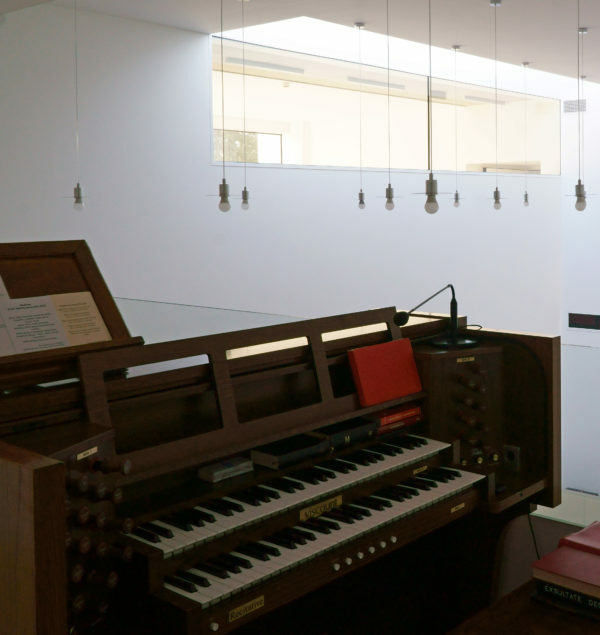 On its four storeys, there are, among other things, a library and a record library, archives, a chamber-music room seating 180, a recording studio, a sound lab and a number of workrooms. 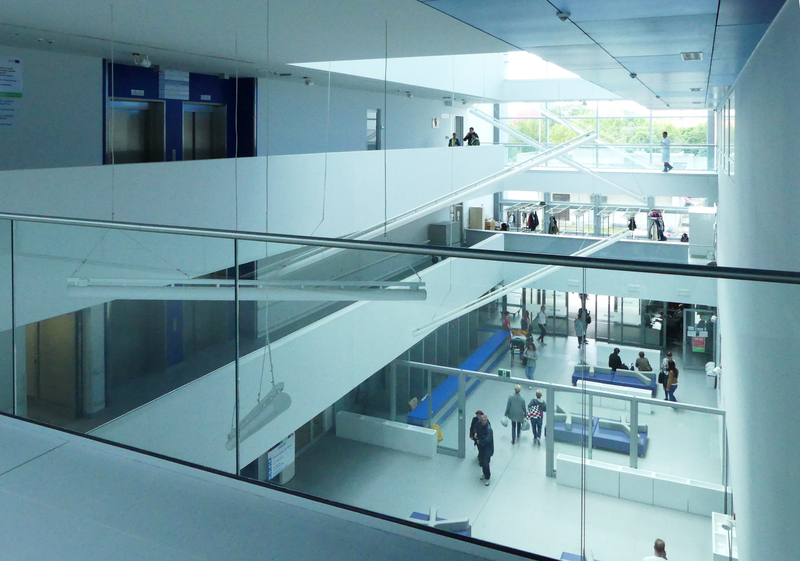 POLFLAM® glass, class EI 30, in aluminium frames was installed in fire-resistant partitions and doors separating the staircase from the patio and the corridors at all the floors. 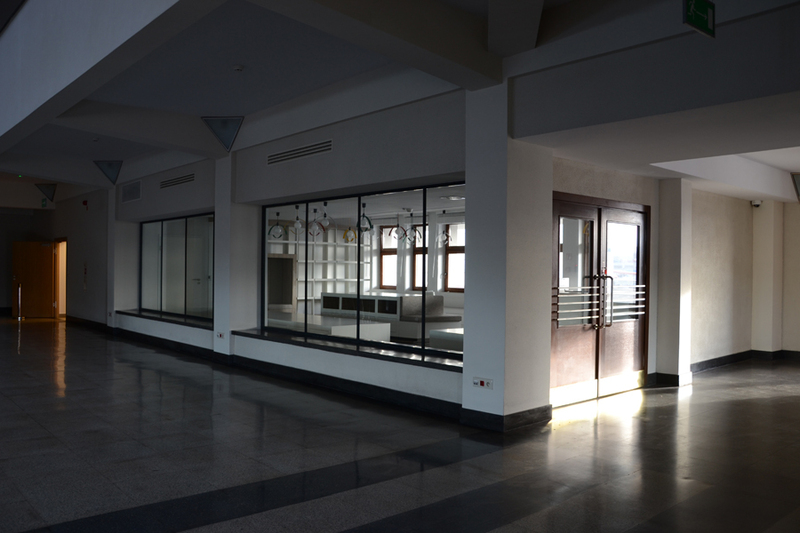 The glass has also been applied in stained glass windows at the landings in the revitalised part of the building. Planeta is a small and cosy seaside resort, located near the beach. 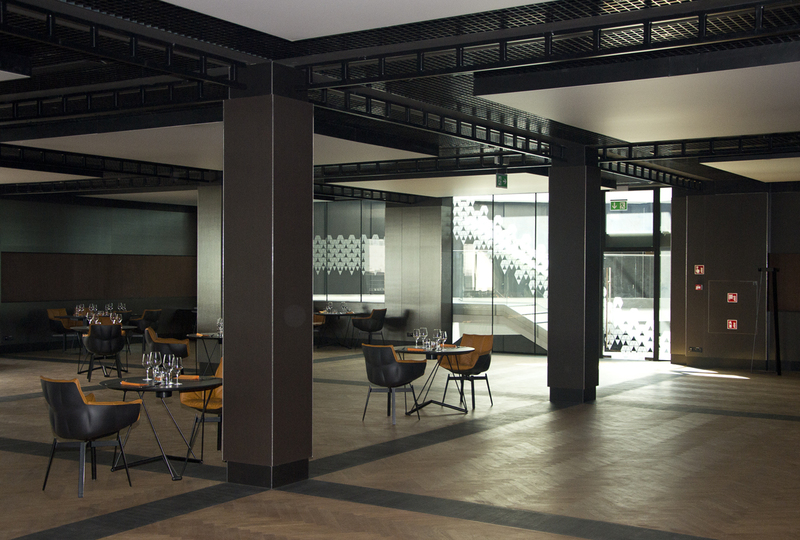 Apart from the hotel rooms on three storeys, it features a restaurant and a conference room. 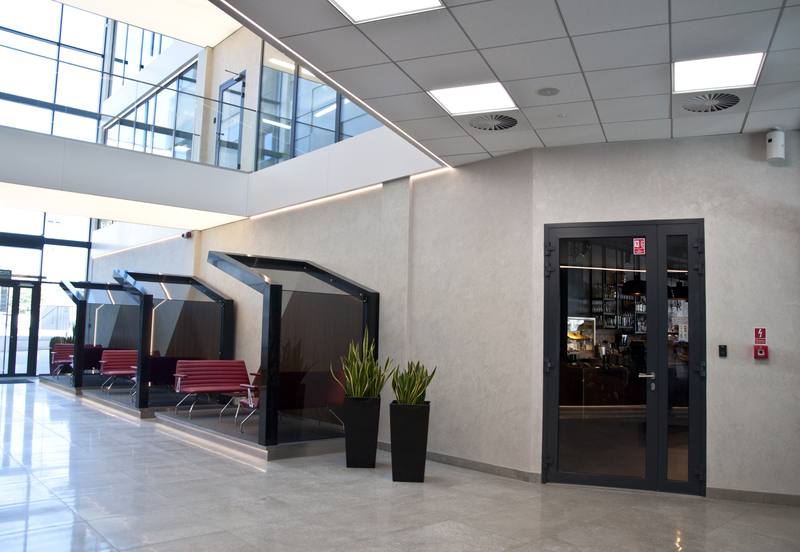 POLFLAM® glass of the EI 60 class in aluminium frames has been applied in its fire-resistant partitions and doors separating the lobby from the staircase, the conference room and the restaurant. 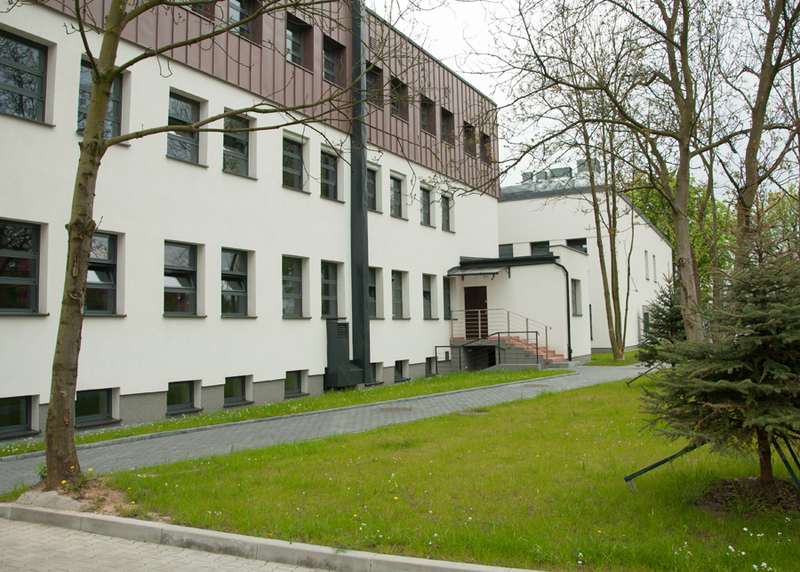 The Warsaw Technical University’s dormitory at Waryńskiego Street is, inter alia, home of a gym hall. 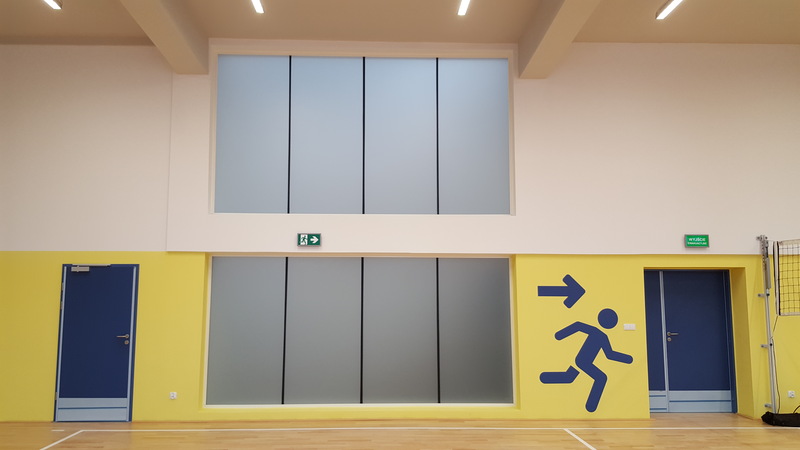 One of the gym’s walls neighbouring the staircase has been made of fire-resistant glass, which has saturated the staircase with daylight. 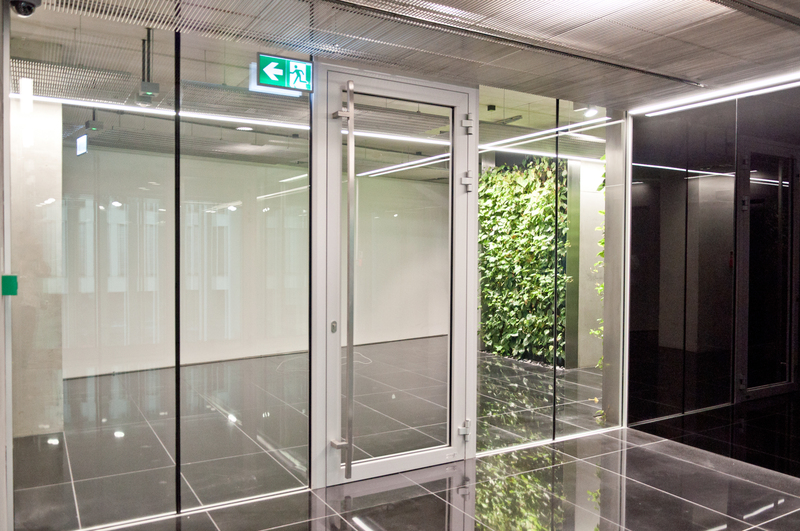 The wall was made of POLFLAM® fire-resistant glass, class EI 30 in the BR frameless system. 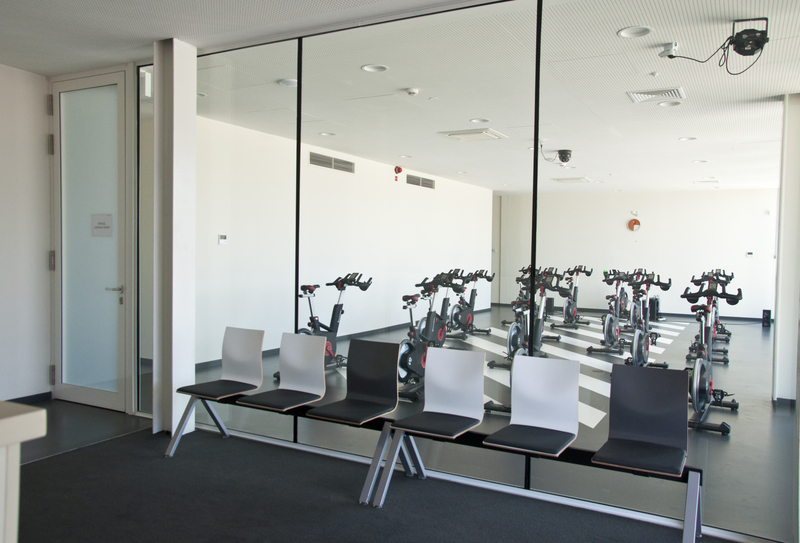 A gym is a demanding location for glazed walls. 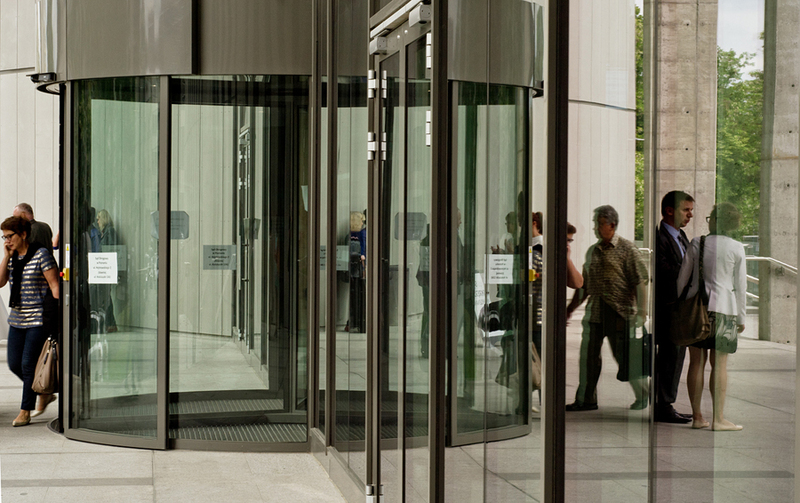 POLFLAM® fire-resistant glass is made of hardened glass, therefore, it is highly resistant to mechanical damage. 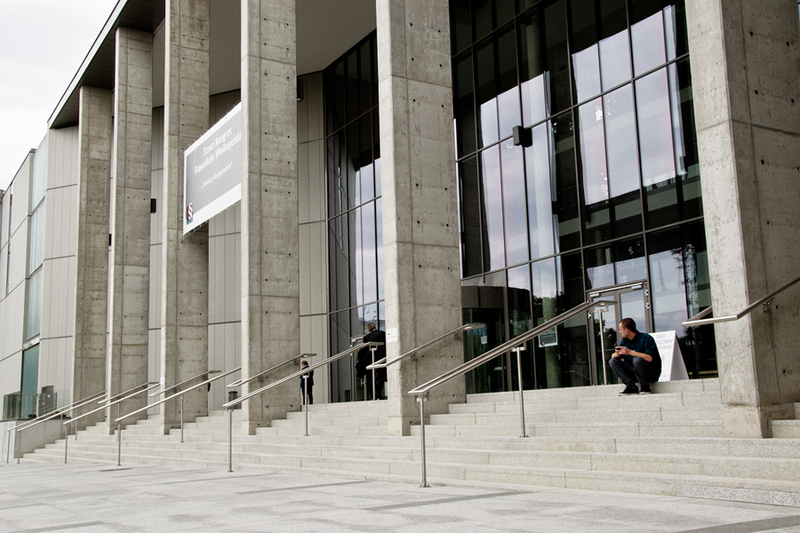 The building of the Ministry of Justice is of modernist architecture, going back to the 1930s. 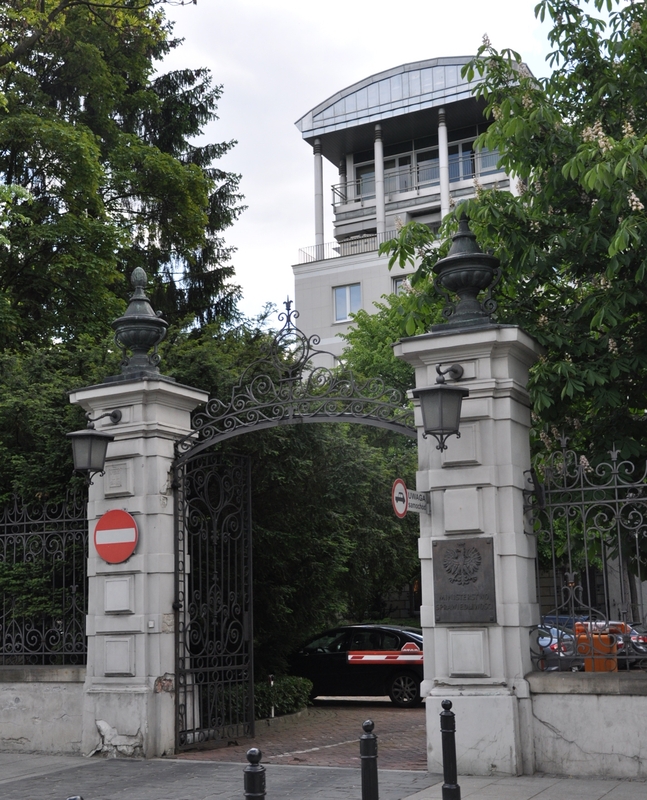 Built for foreign diplomats, it is today one of the best known historic sights of Warsaw’s Royal Road. 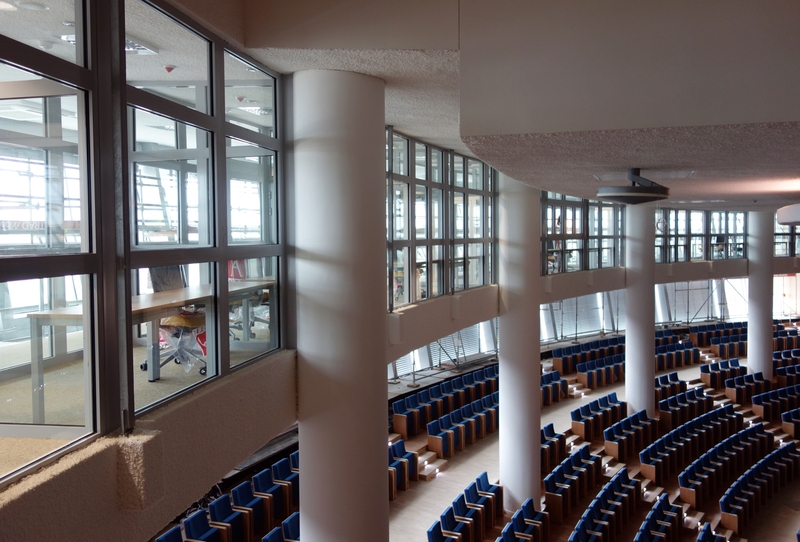 When modernised and extended for the needs of the Ministry, modern fire-resistant glazed walls were installed inside the building. 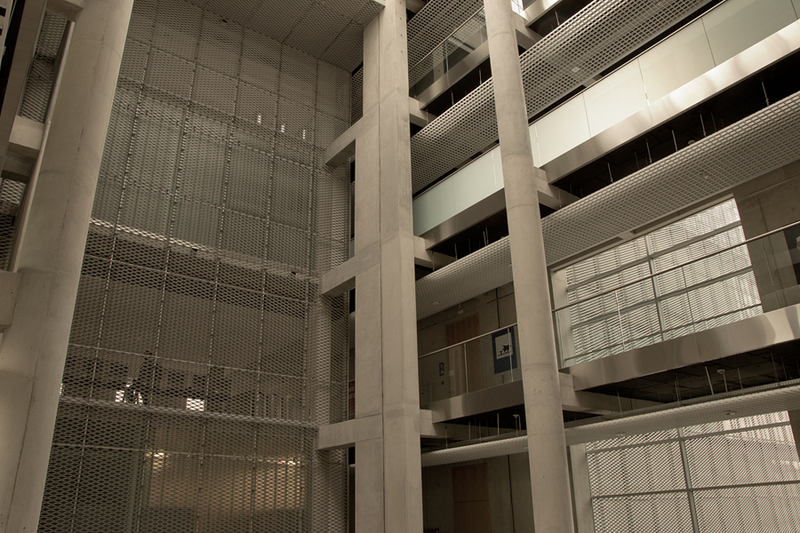 POLFLAM® glass EI 30 and EI 60 (220 m2 in total) was used for fire walls in staircases along the emergency routes. 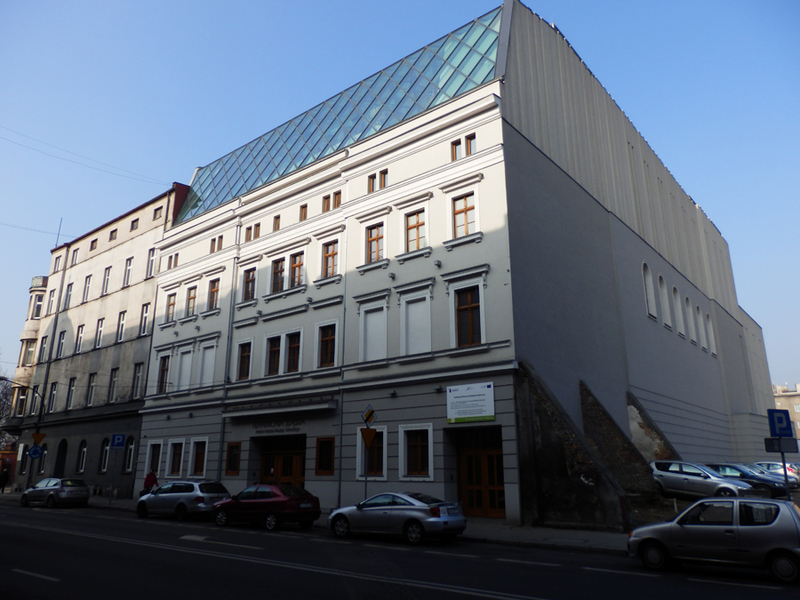 The building where the music school is located is among the most precious architectural sights of the city. 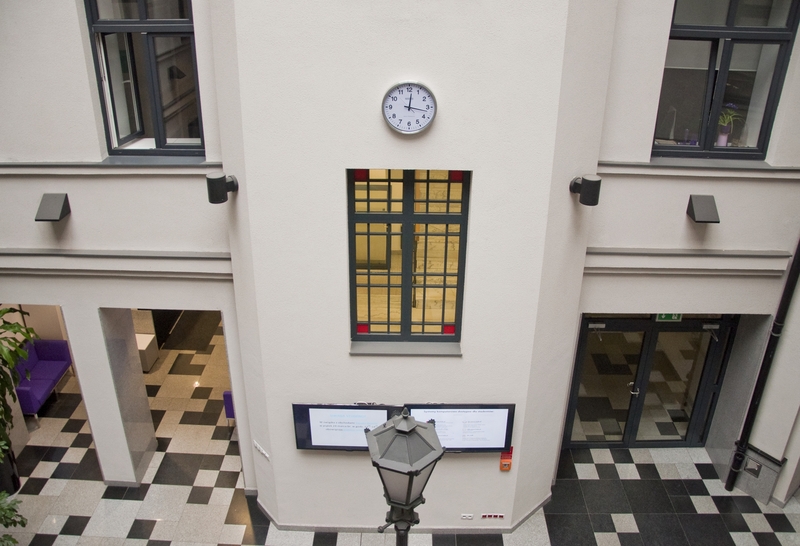 It goes back to the early 20th century and has recently been revitalised. 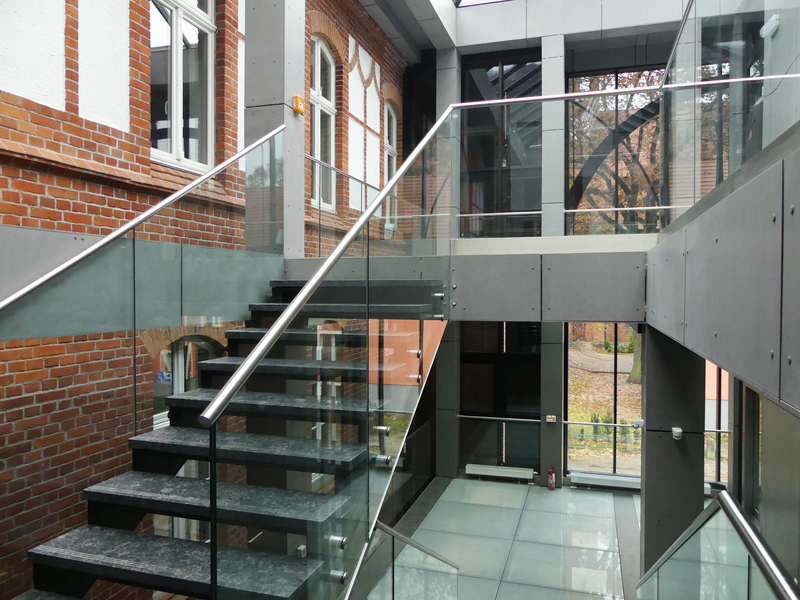 The floor between two storeys in a modern staircase has been made of 65 m2 of POLFLAM® F REI 60 floor glass. 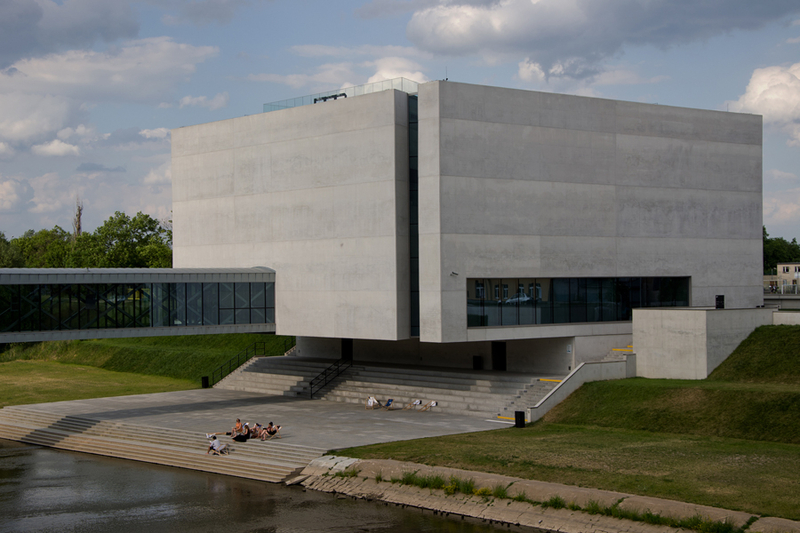 The CWK in Jasionka is the biggest exhibition and congress centre in the Podkarpackie province, with very interesting architecture and modern functional solutions. The exhibition zone and the congress zone can be independent or they can be combined into one space. 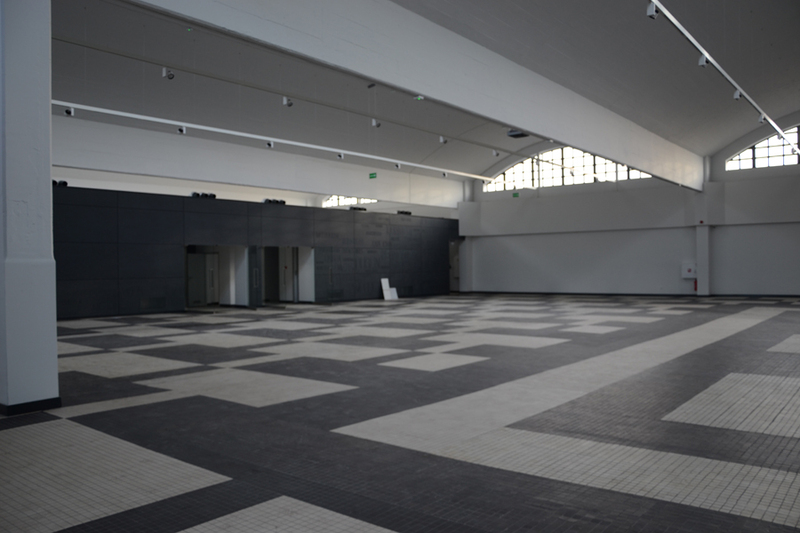 The facility’s total area is over 27 000 m2, the exhibition area takes 16 000 m2. 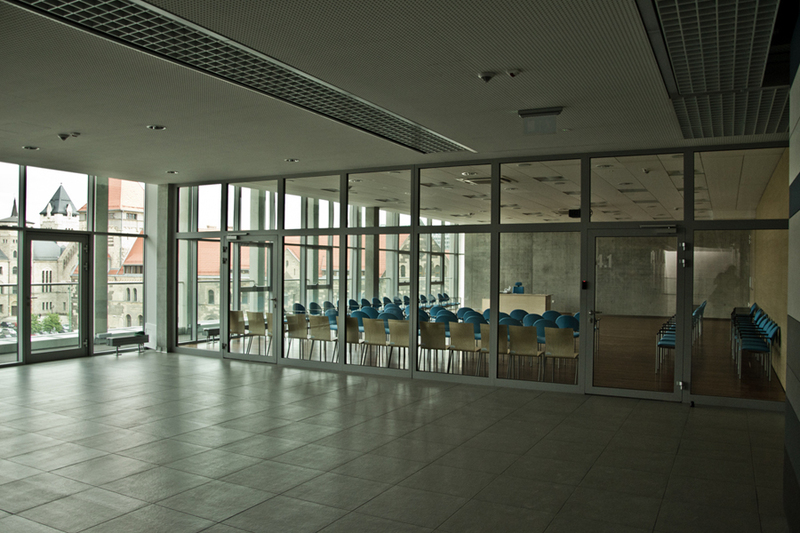 The fire-resistant glazed walls provide partition for, among other things, a large conference room for an audience of 860 people. 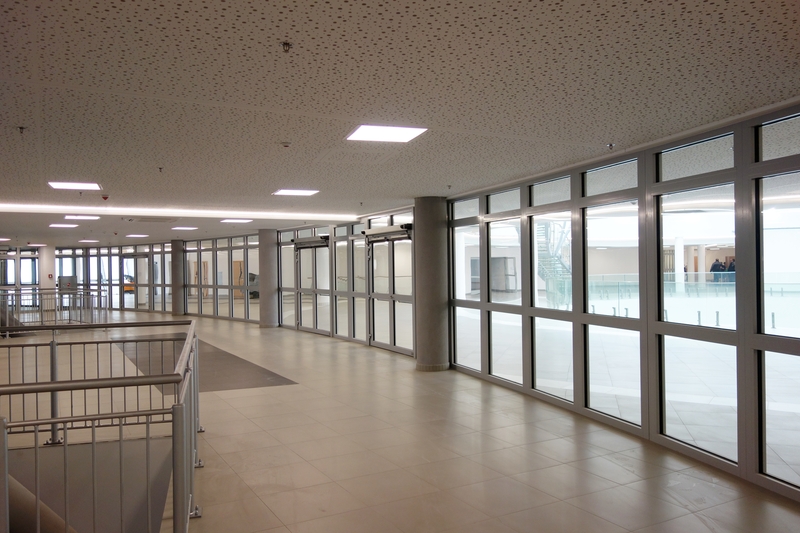 In total, the Centre has more than 3500 m2 of POLFLAM® glass of the classes EI 30 and EI 60, and also of the rare on the market class EI 120. 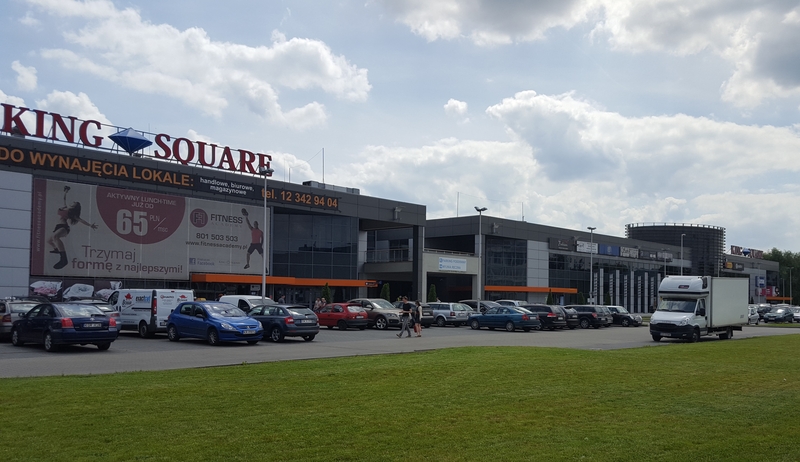 The Lublin CUBE is one of the biggest sports clubs in eastern Poland. 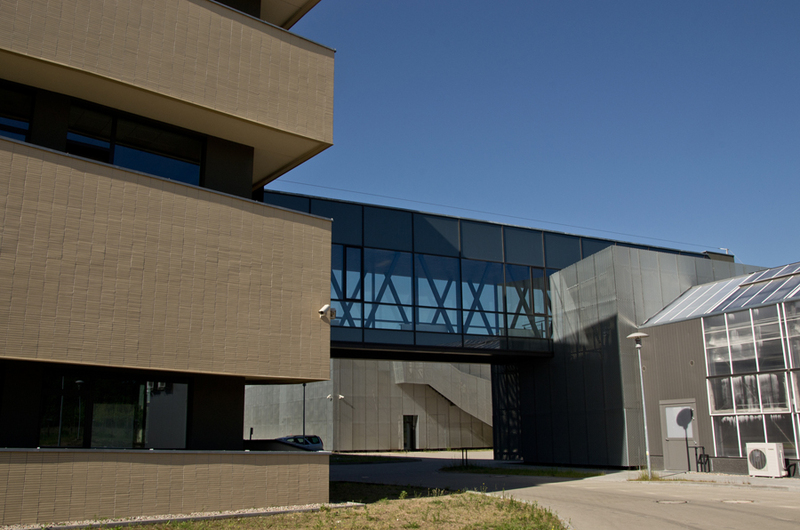 The&bbsp;facility was built from scratch for sporting purposes. 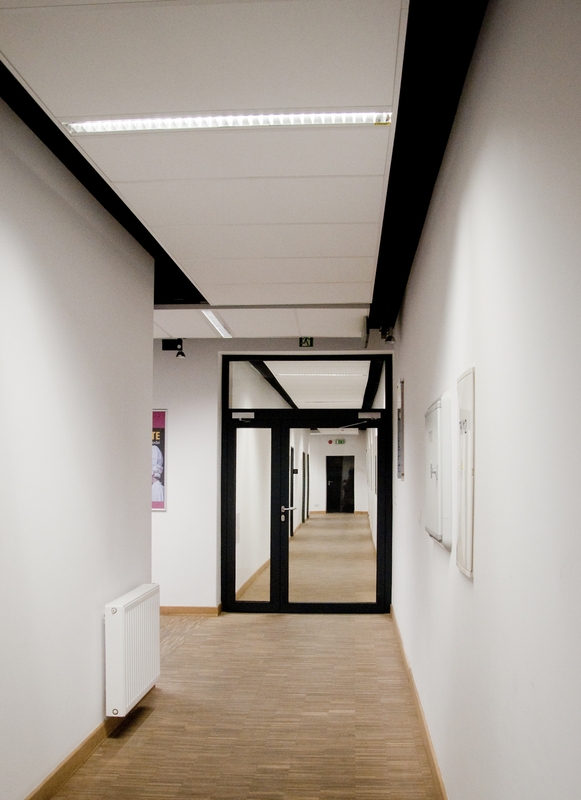 In the building applied was POLFLAM® glass of the EI 60 class, mounted in the frameless system. 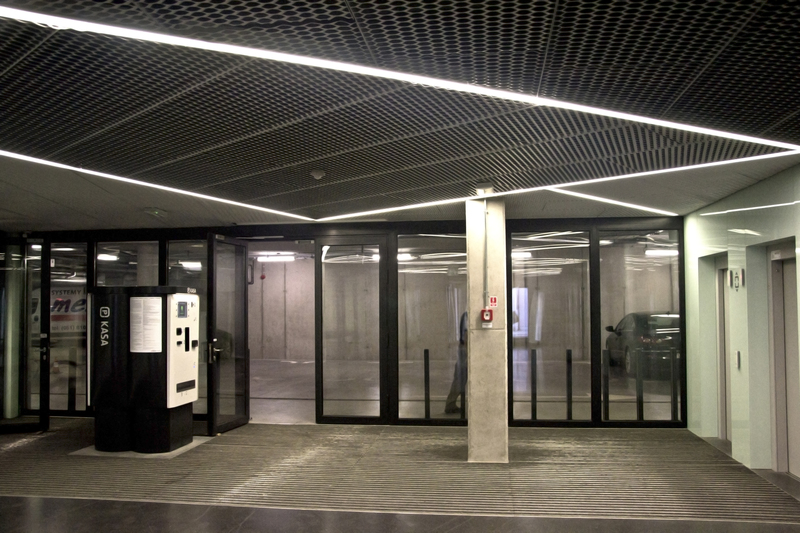 The interior walls made of POLFLAM® glass play the role of fire-protection partitions of the elevator duct. 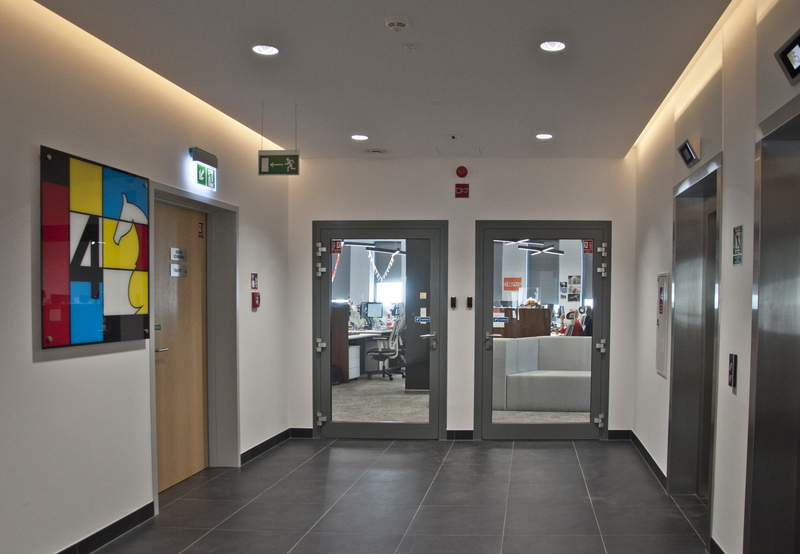 The frameless mounting solution allows for better light saturation of the interiors. 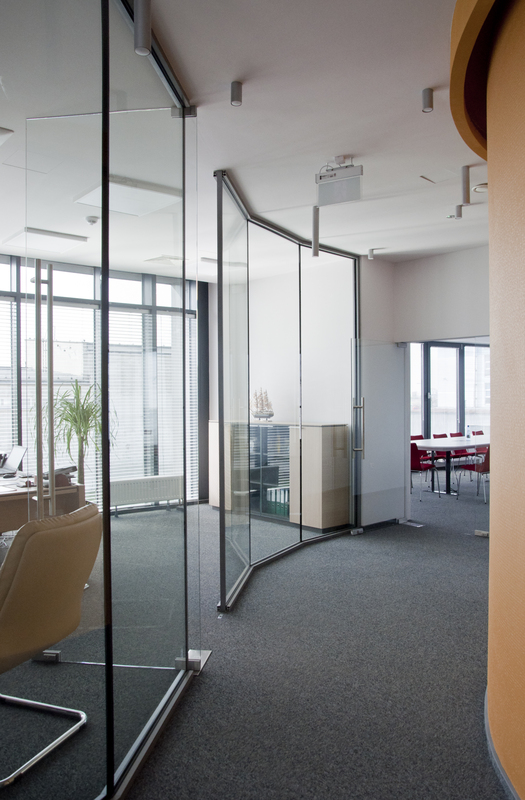 Apart from the latter, the partition also has perfect acoustic insulation. 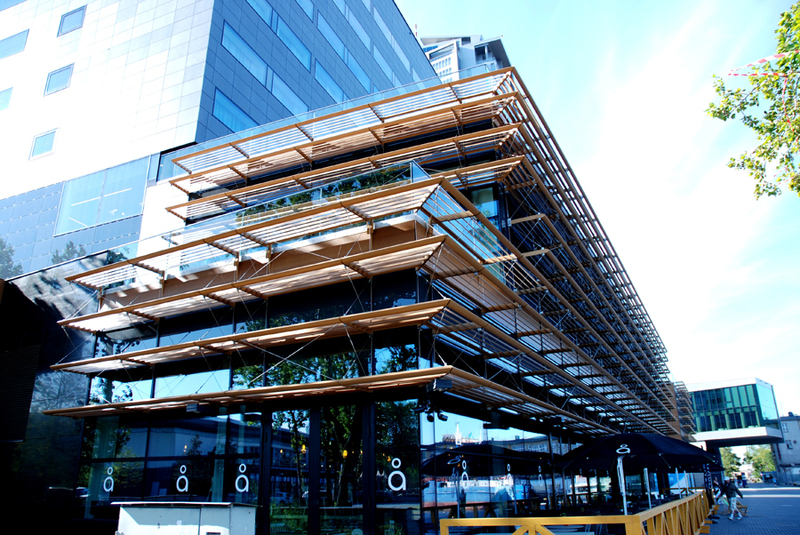 The KING SQUARE Centre opened in 2012. 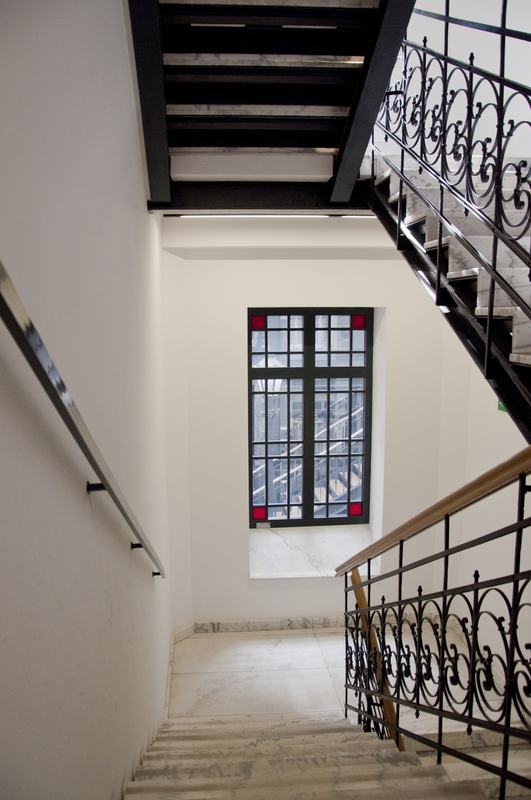 It features three two-storey buildings linked with glazed passages. One of them has been arranged as commercial space for local producers and importers; mostly family firms. 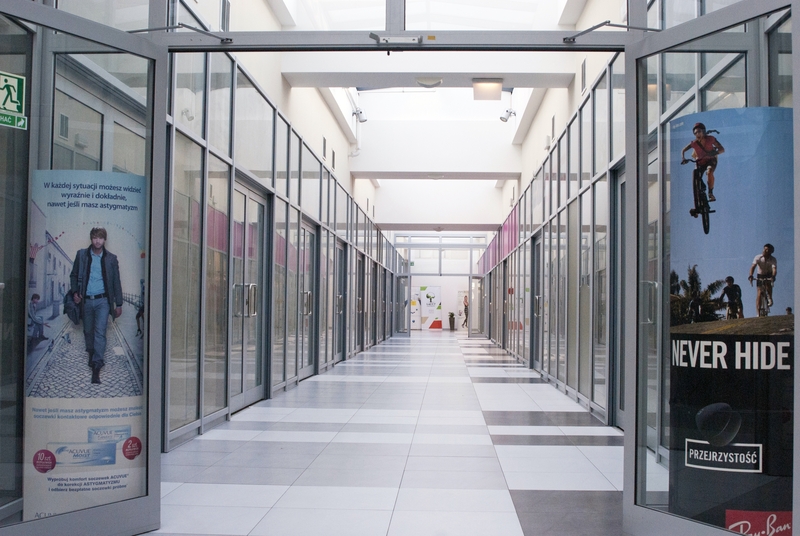 POLFLAM® glass, class EI 15 and EI 30, has been used to single out commercial stalls; for this purpose internal walls of about 3,500 sqm were installed. 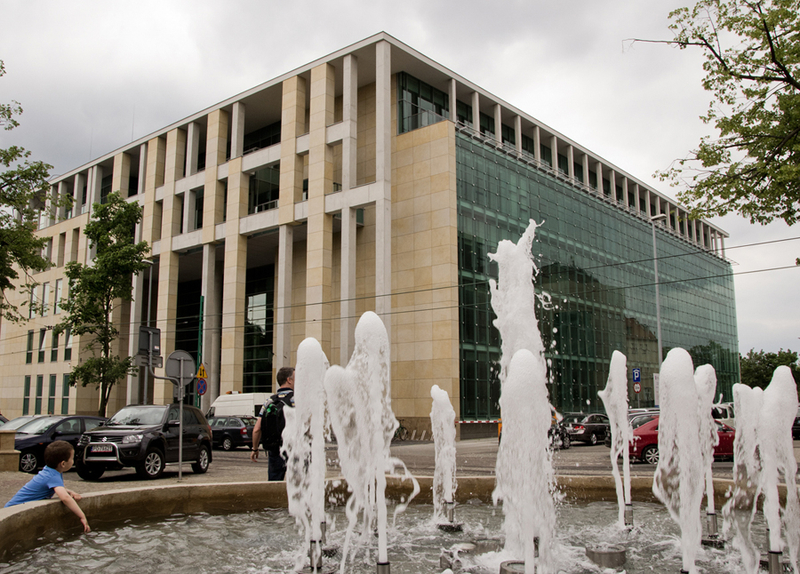 The new Deputies' Hotel is part of the Polish Parliament Park at Wiejska Street in Warsaw. It is the north-west end of the area of the Parliamentary facilities. 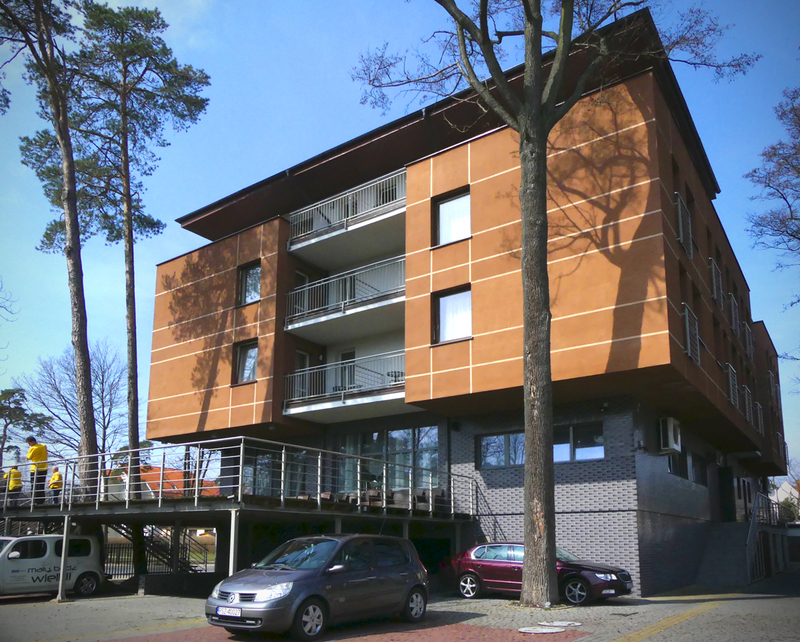 From the side of the Vistula escarpment, the building has three storeys of residential area, six from the other side. 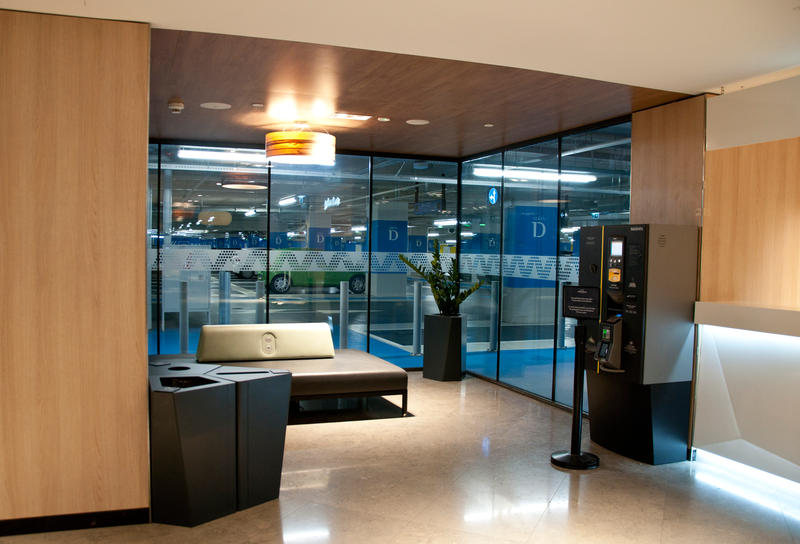 The lobby extends over two levels of the ground floor and houses the reception desk and some commercial services, a bookshop and other shops, a swimming pool, a sauna, a conference room and a restaurant. 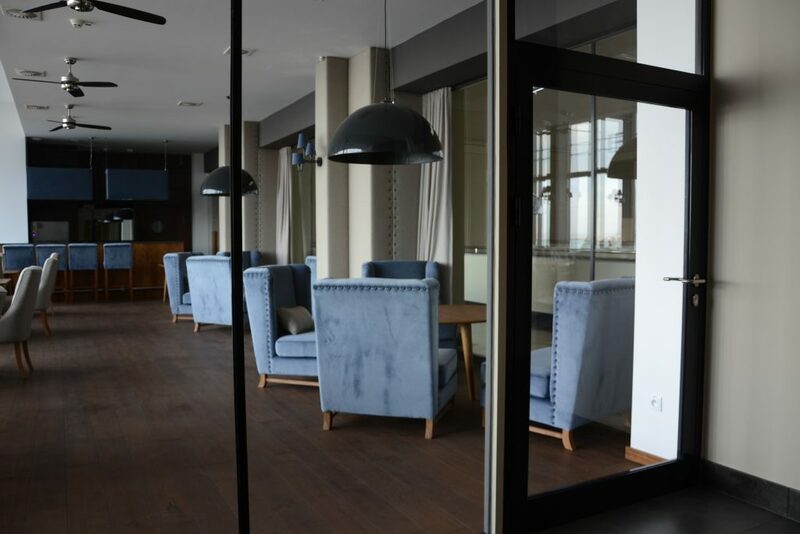 More than 100 sqm of POLFLAM® glass was used in the new Deputies' Hotel to build internal partitions, class EI 30, EI 60 and EI 120, while the outside doors were made of the glass of the EI 60 class. 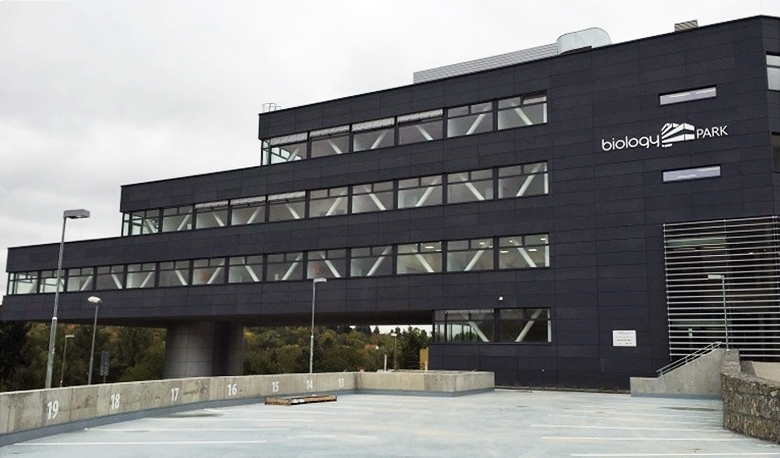 The Biology Park is a brand new science and technology park specialising in biotechnology and biomedicine. 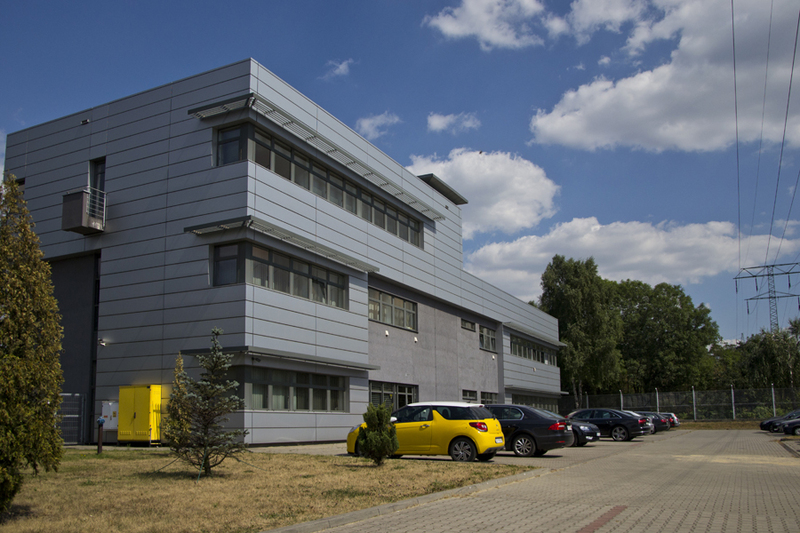 It is home to workshops, laboratories and seminar spaces. 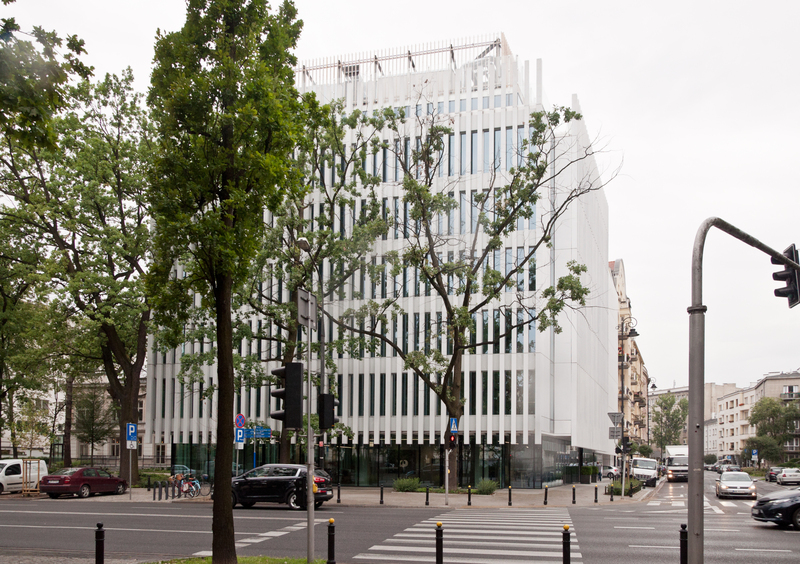 The building has been constructed using the latest technology. 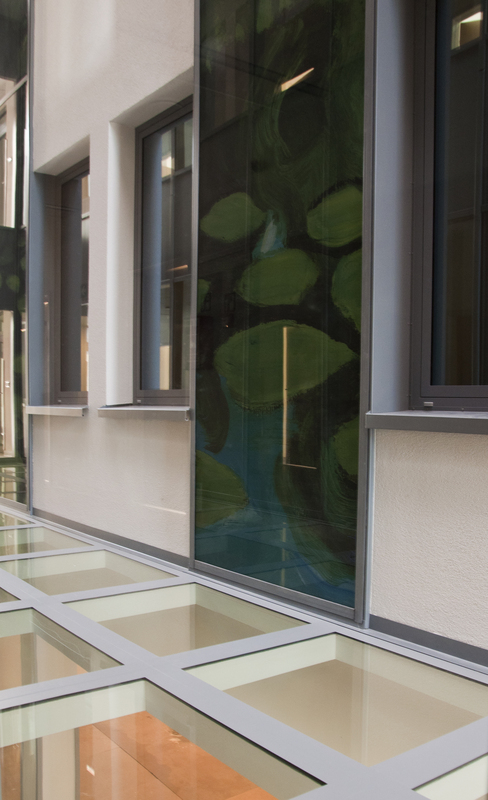 An area of nearly 100 sqm contains indoor glazings made of POLFLAM® glass EI 30. 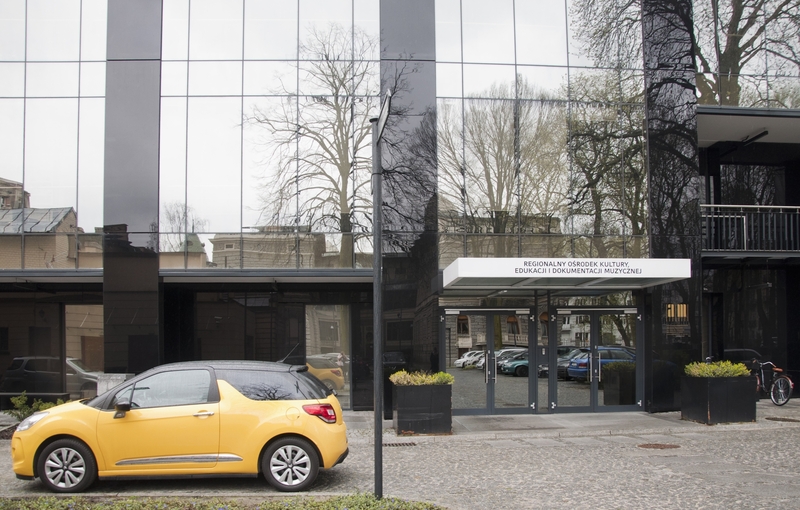 The project’s main purpose is to support competitiveness and know-how and technology transfer between businesses and higher education institutions. 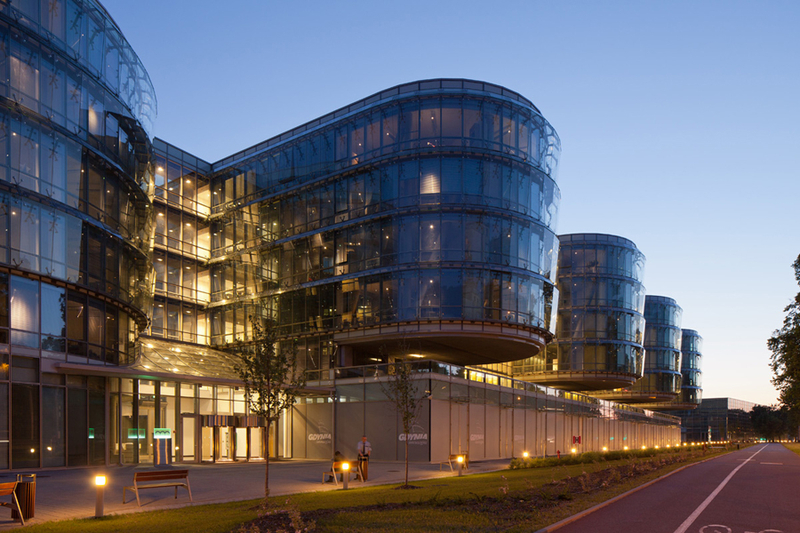 In 2015, the Biology Park Brno has been recognised the most interesting project among Czech industrial buildings. 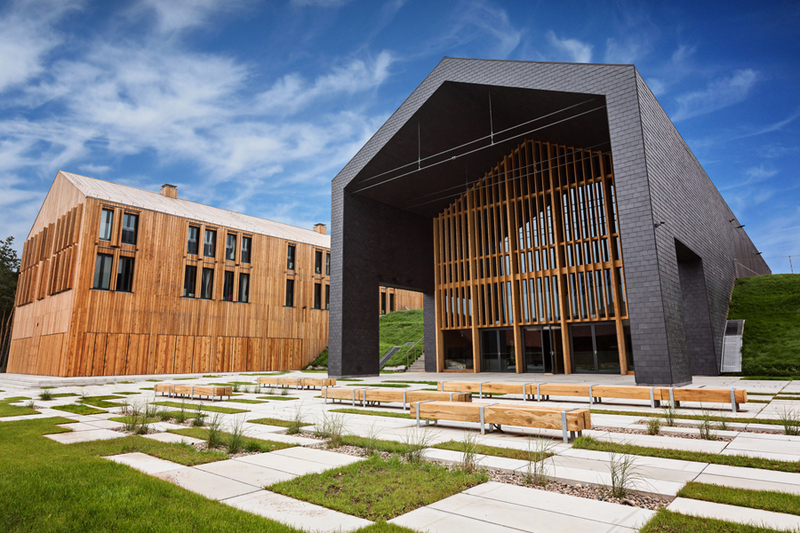 The Culture and Leisure Centre in the Mazowsze Countryside Museum in Sierpc is a complex of three simple structures linked with green escarpments which fit the buildings well into the character and landscape of that open-air museum. 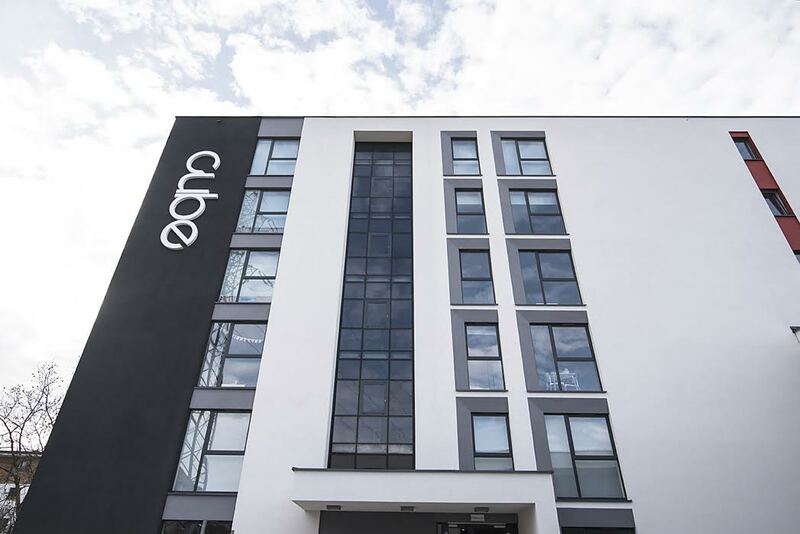 The site is a multi-function centre housing a hotel, a swimming pool complex with a spa zone, restaurants, bars, conference rooms, sports facilities, offices and a concert hall. 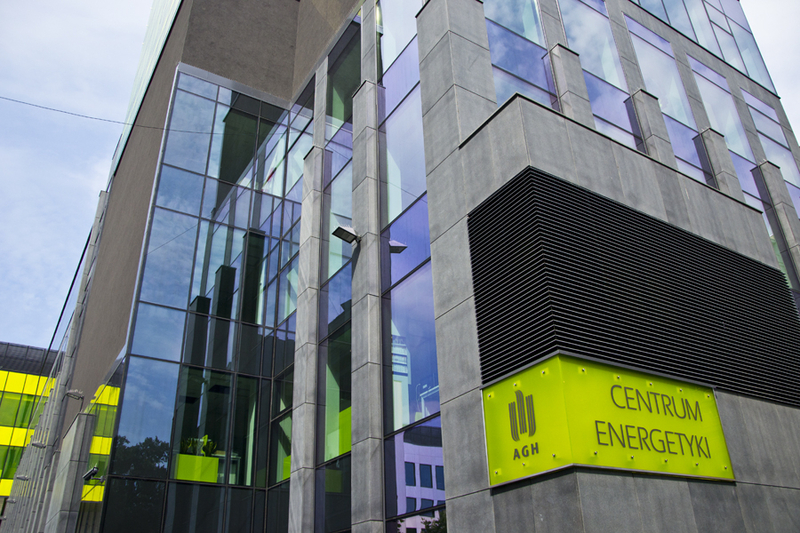 The construction of the centre was completed earlier in 2015. 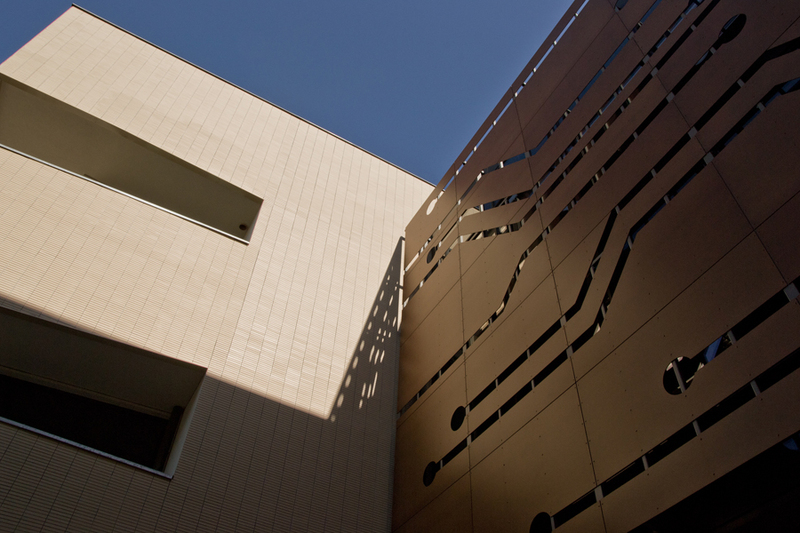 The building is home for the General Library, an auditorium/conference hall and commercial space. 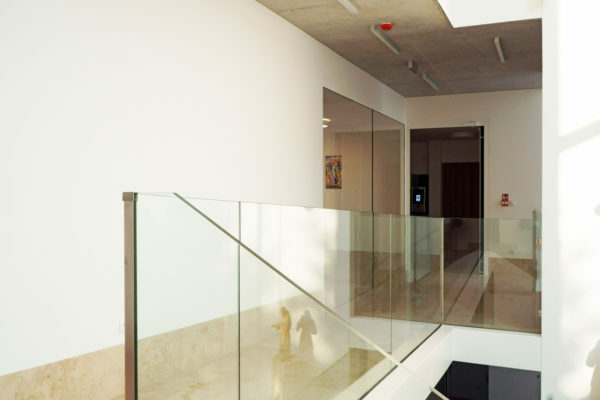 A modern multi-function complex designed for residential, commercial and cultural purposes. 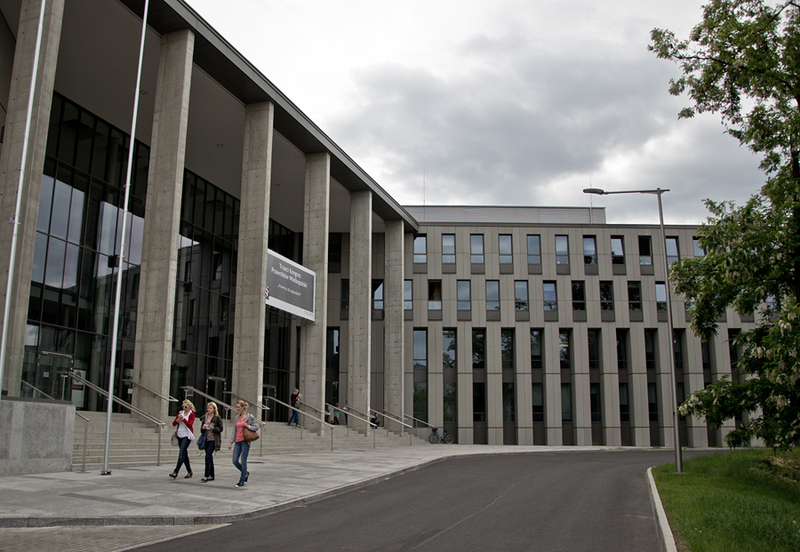 It was completed earlier this year (2015). 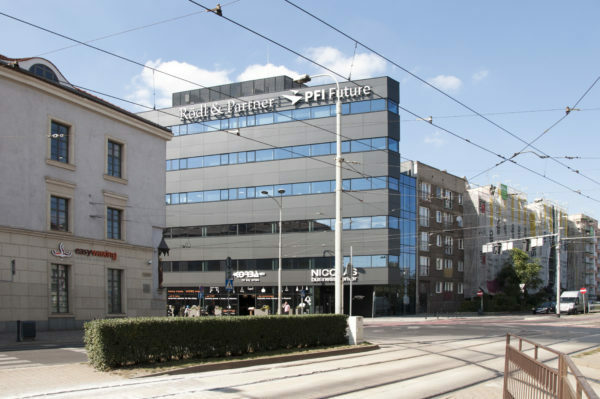 Phase one of the investment includes a complex of two buildings; an office building intended for the bank PKO BP and a four-star hotel, part of the Marriott Courtyard chain. 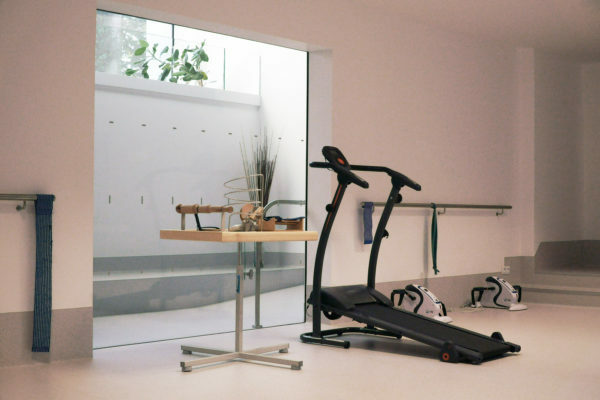 They are an example of functionality and ergonomy. 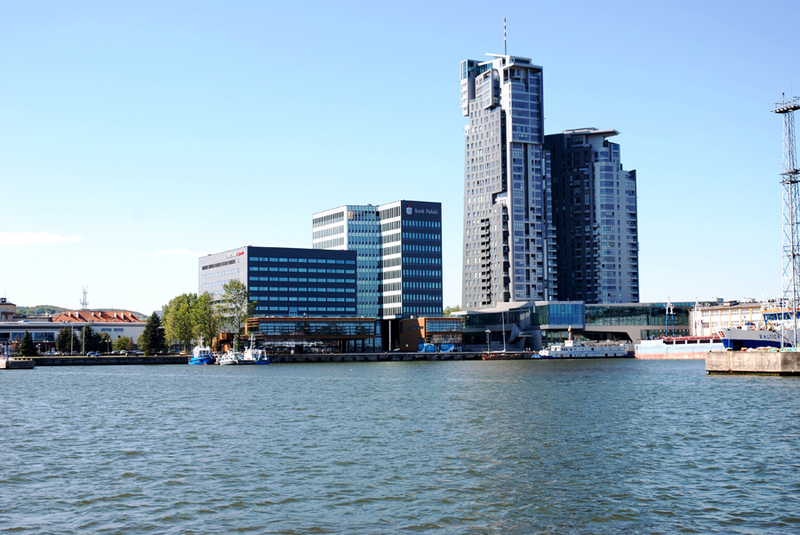 The buildings have been placed at the sea-side, neighbouring the skyscrapers Sea Towers with a view of the sea and the yacht port. 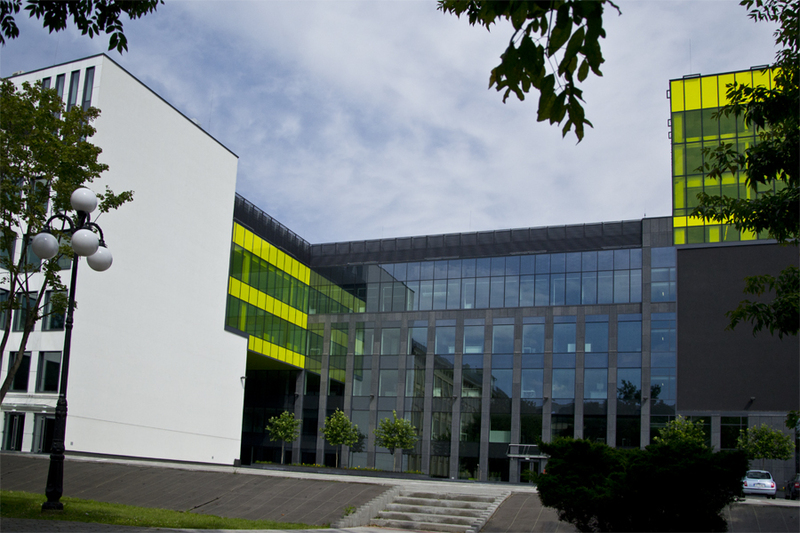 The Rzeszow University Science and Medical Centre for Innovative Research is located in twin buildings. 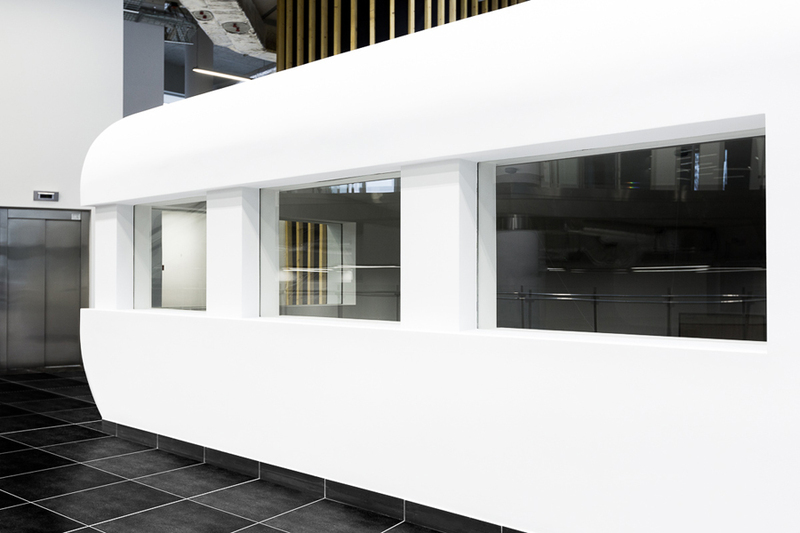 The interior of the Centre is made of POLFLAM® fire-resistant glass EI 60 in the innovative frameless system FR. 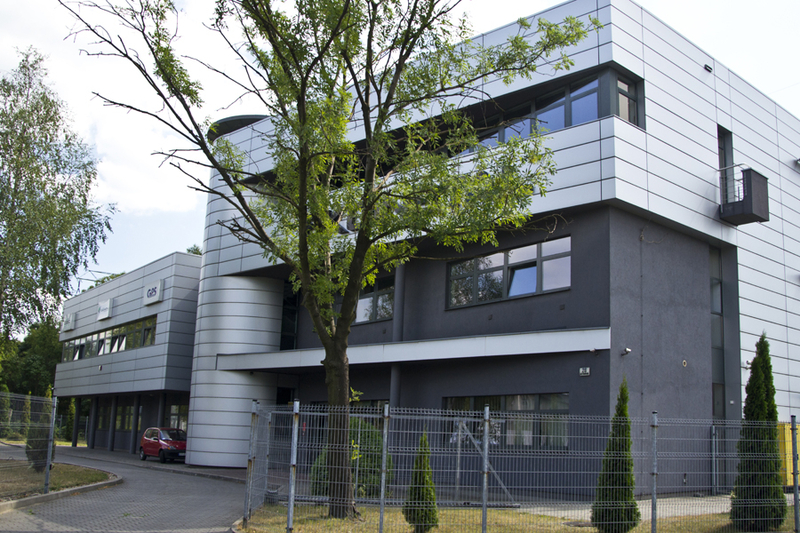 The solution has been developed in co-operation with FR Solutions (www.frsolutions.pl). 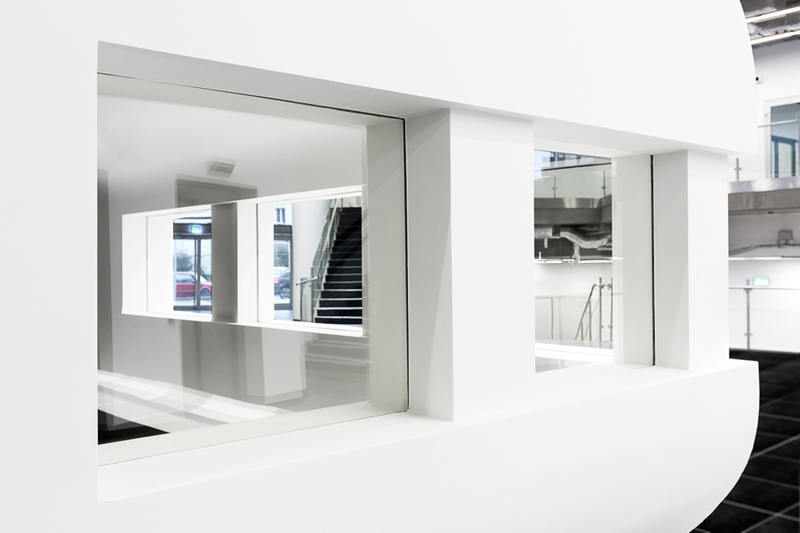 The fire-resistant partitions using POLFLAM® glass, made in the BR system, add to the spectacular interior design of a leading car-make showroom. 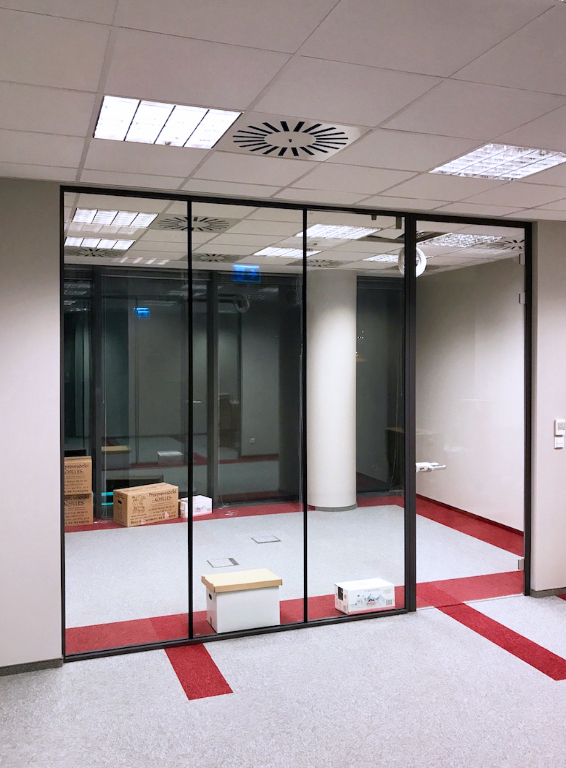 The partition’s light weight (no frames or other structures), provided the space with more light, while ensuring any safety requirement. 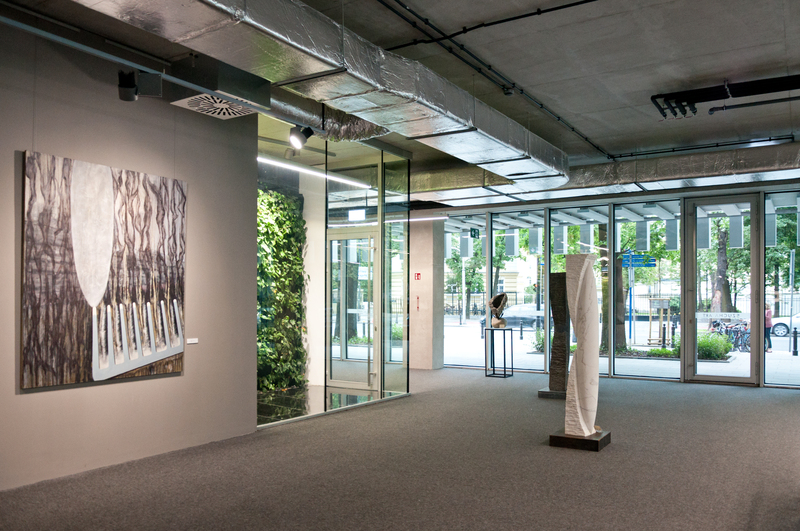 Following the restoration of one of the oldest buildings of the former Bata factory in Zlin, a modern multifunction public site has been created. 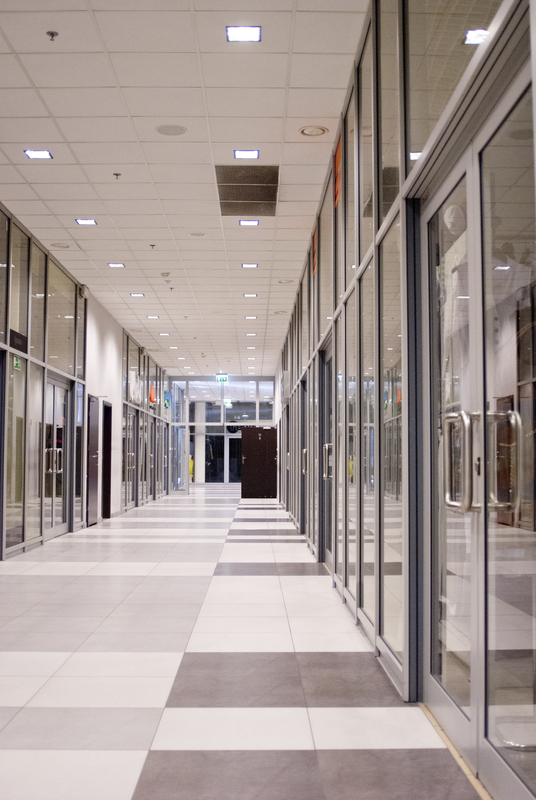 Its commercial part comprises 5 000 sqm of shopping area and 1 500 sqm of leisure space. 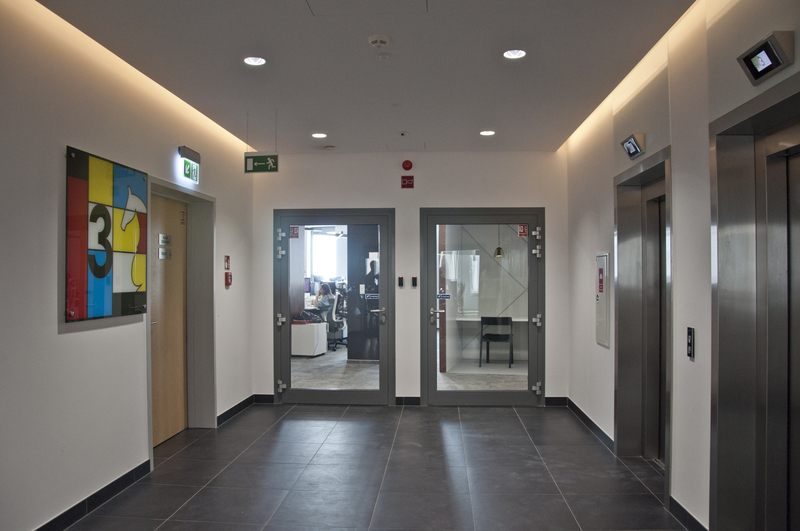 The upper floors provide 1 500 sqm of office space and 1 500 sqm of lofts. 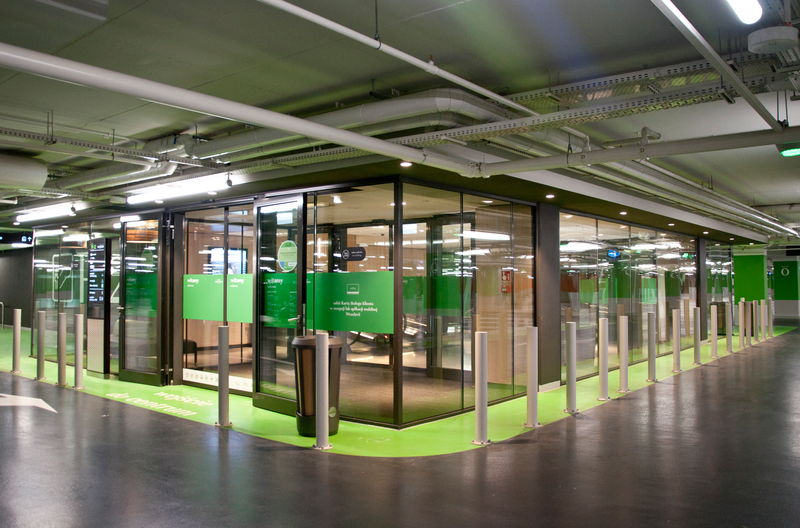 The Werk Arena is a sports site that follows the state-of-the-art functionality trends. 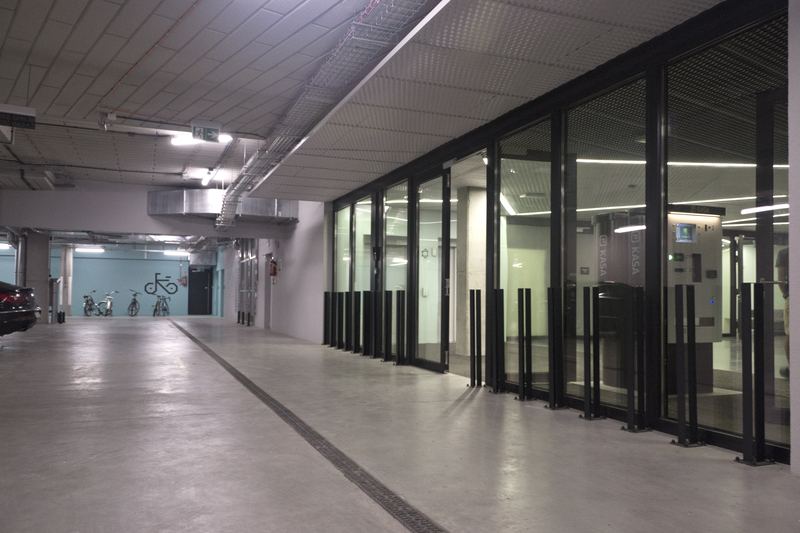 Its main function is to serve as a hockey facility, yet, thanks to the most modern solutions applied by its architects, it is well suited for other indoor sports or social and culture events. 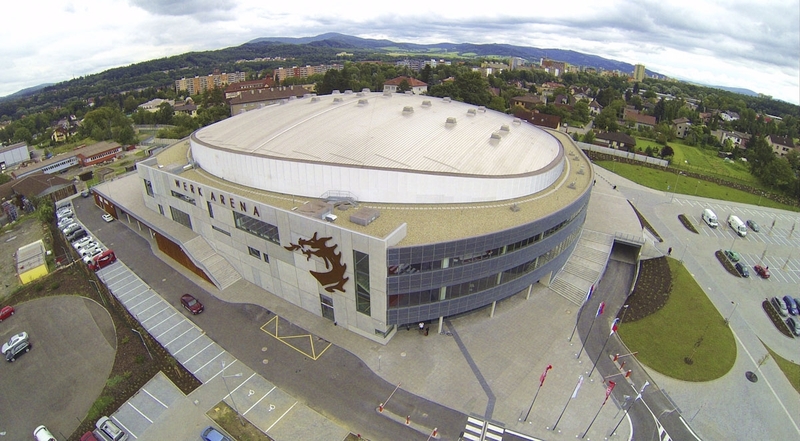 The arena can seat 5 200 spectators. 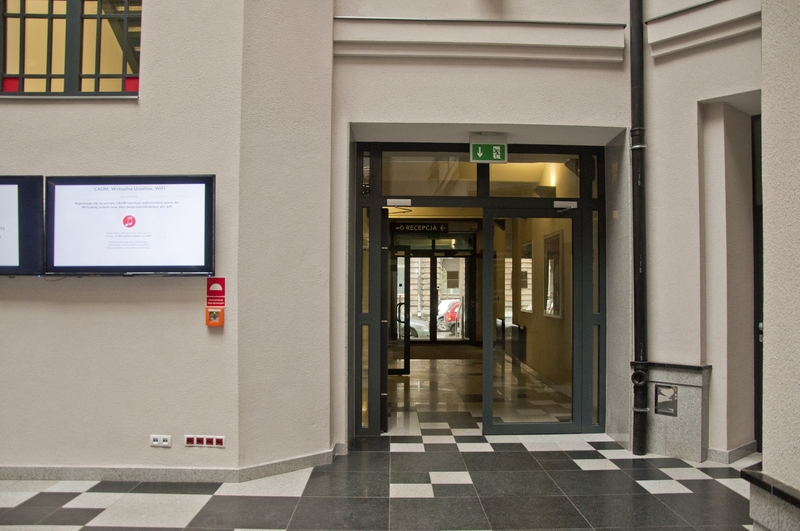 The hall enjoys well-equipped technical and multimedia facilities. 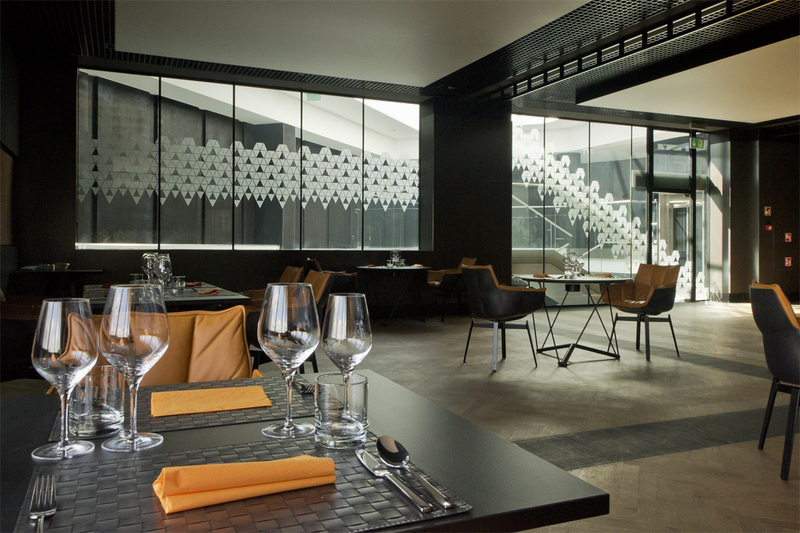 It is home for a club restaurant which overlooks the ice-rink through a glazed wall. 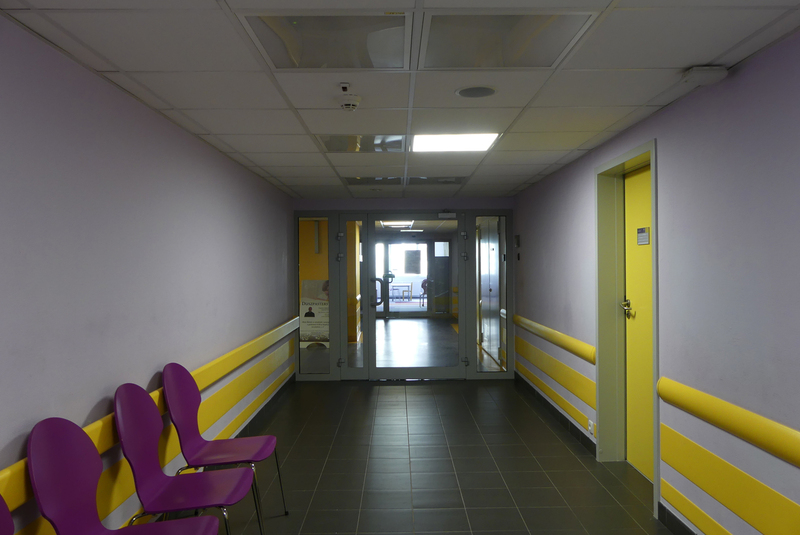 The facility is fully adapter to the needs of people with disabilities. 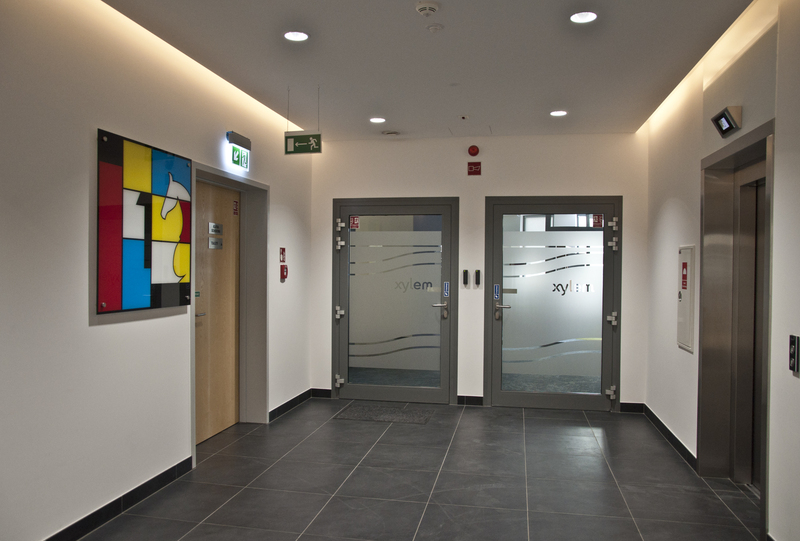 POLFLAM® glass of the class EI 30 and EI 60 has been used in fire walls and doors. 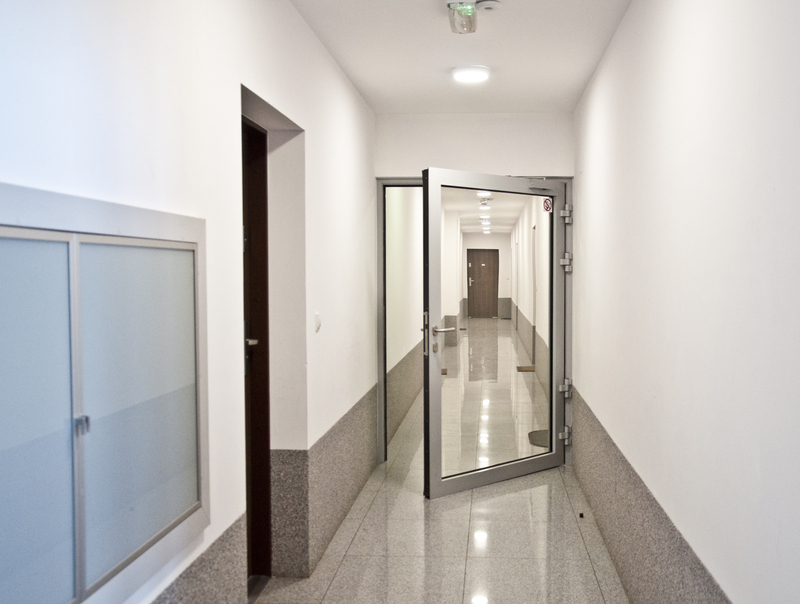 Its total surface is 250 sqm. 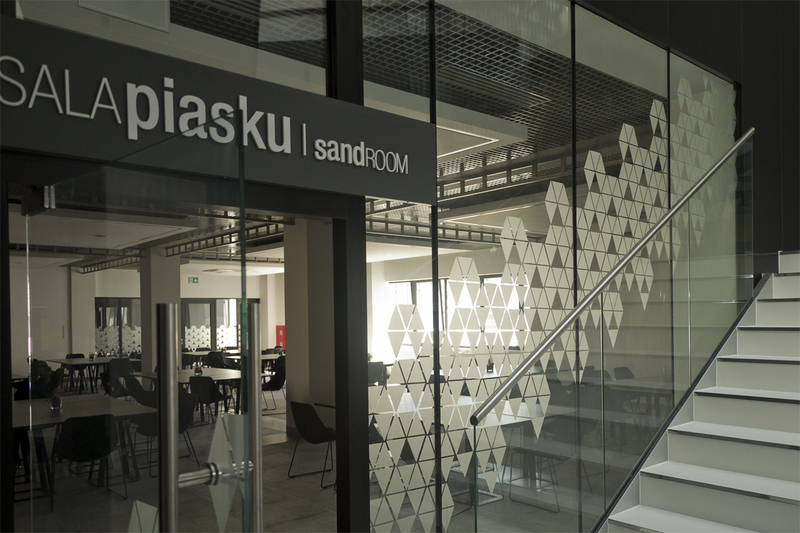 A surface of 1200 m2 of POLFLAM® glass was used in the buildings of the Pomorski Science and Technology Park (PPNT), in Redłowo near Gdynia. 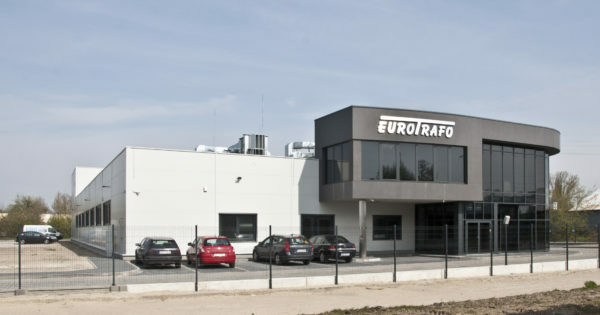 The project was initiated in 2001 with a view to supporting innovative enterprises. 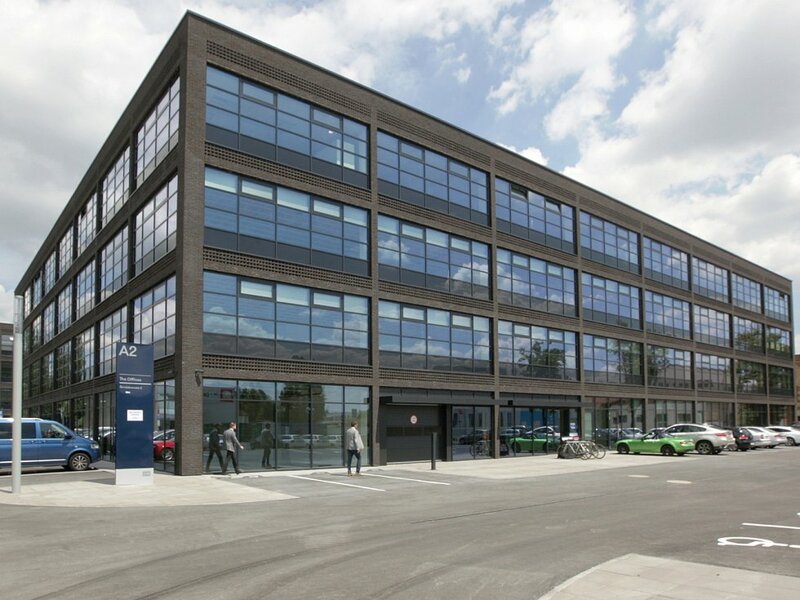 It is home for modern offices, research laboratories, conference and exhibition rooms, prototype labs, leisure space and catering facilities. 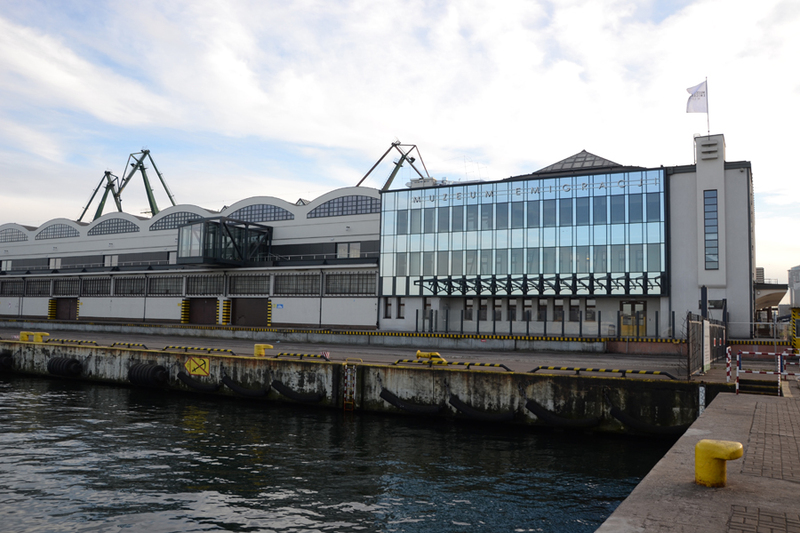 The Gdynia Museum of Emigration is in the building of the former Marine Station. 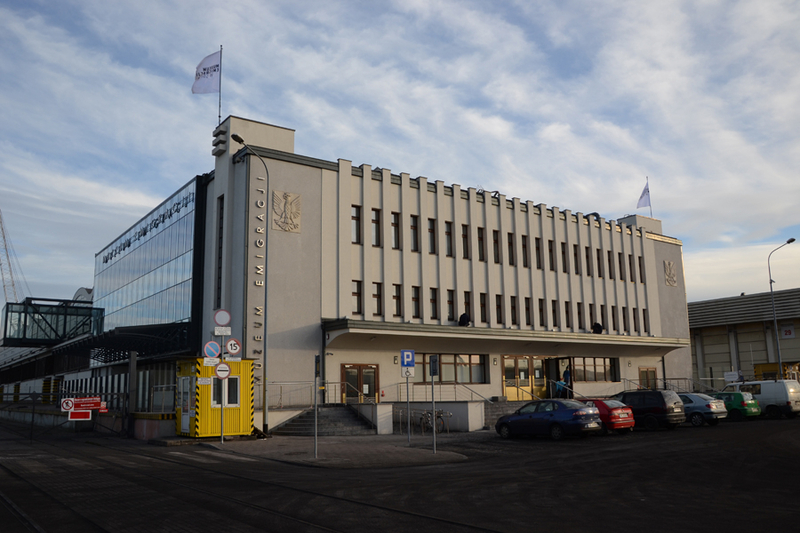 The building was built in 1933 and was revitalised in the years 2013-2015. 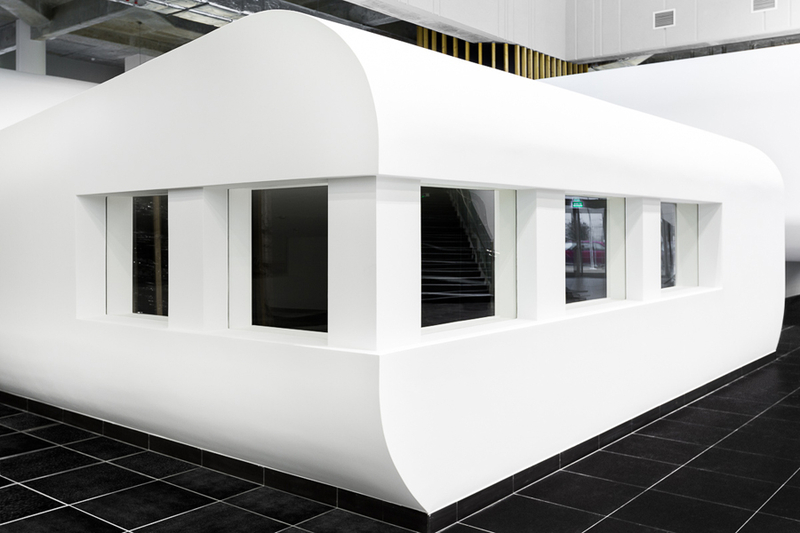 The objective was to adapt the historic building for the needs of museum and a multi-media centre. 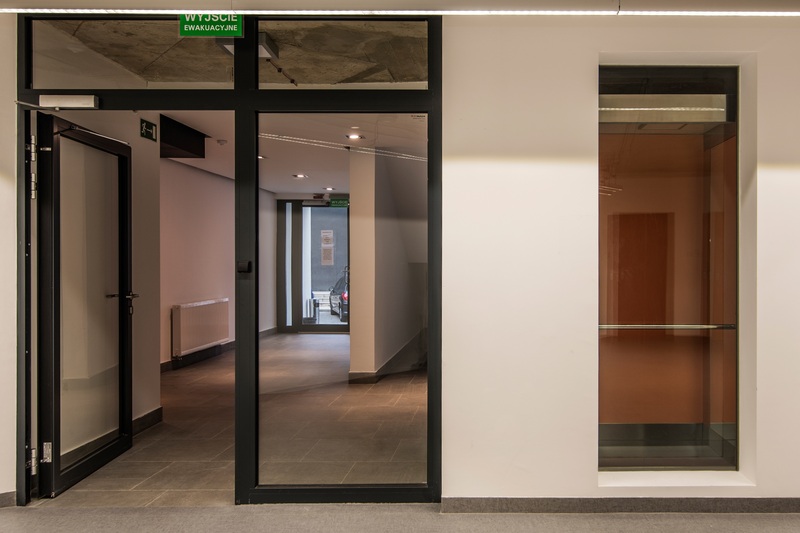 POLFLAM® fire-resistant glass in the frameless system BR has been applied in the interior design to single out autonomous spaces and fire zones at the ground and first floor. 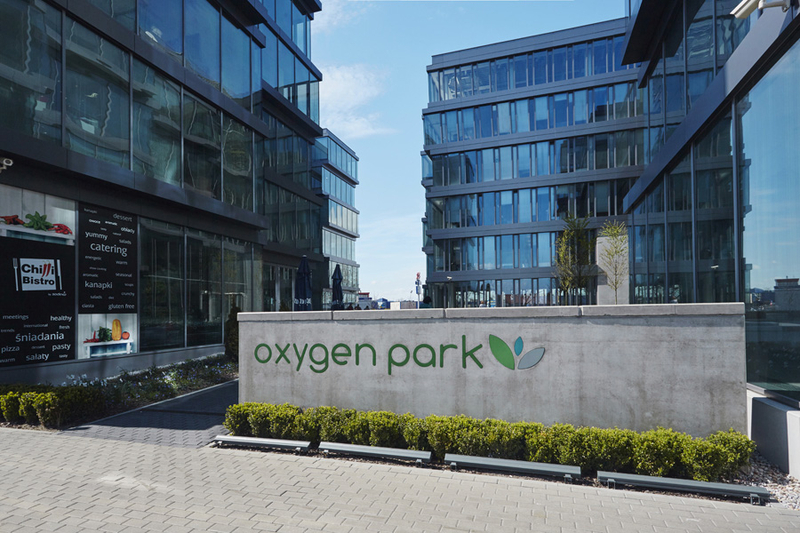 Oxygen Park is a modern office facility located in Aleje Jerozolimskie, the very centre and business area of the city. 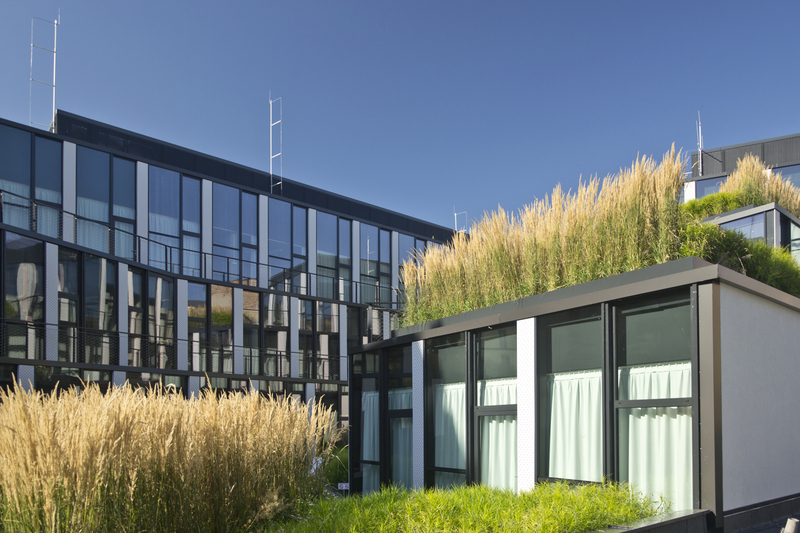 The facility is made of two six-storey buildings joined with a green inner courtyard. 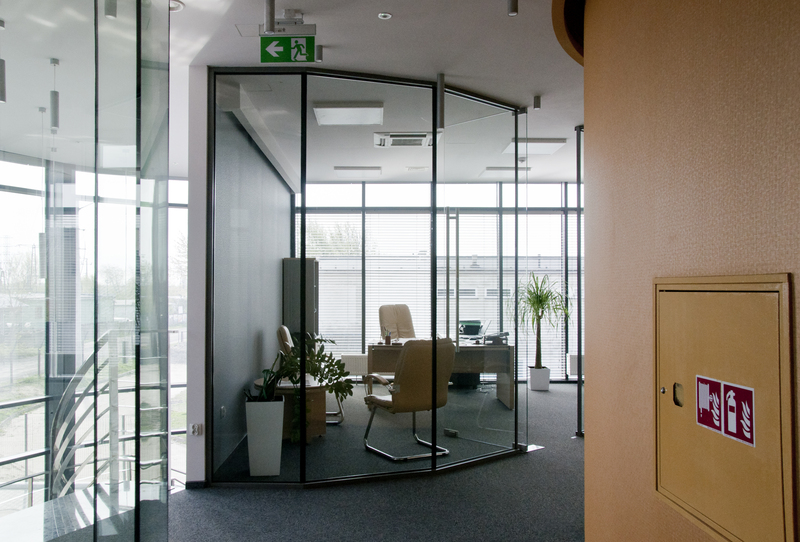 NIMBUS Office is a spacious building located in the Warsaw district of Ochota, the interior of which uses POLFLAM® fire-resistant glass – EI 30 and EI 60. 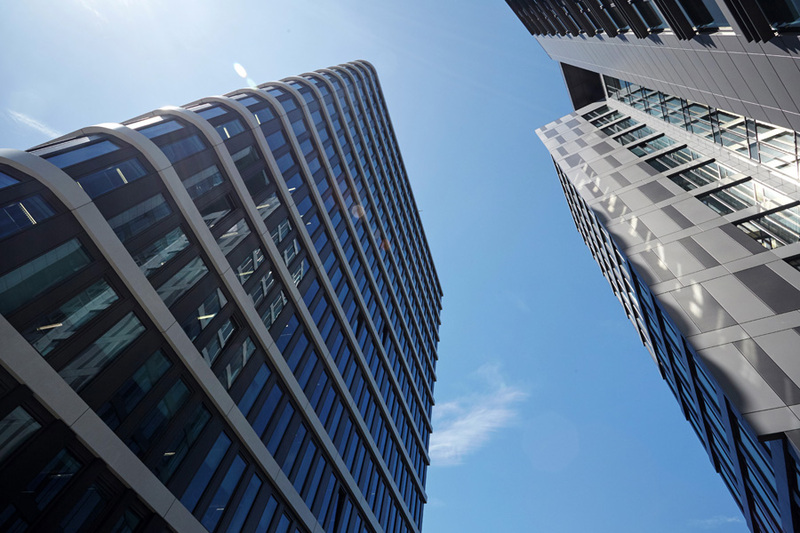 The building is 65 metres high and is designed for offices only. 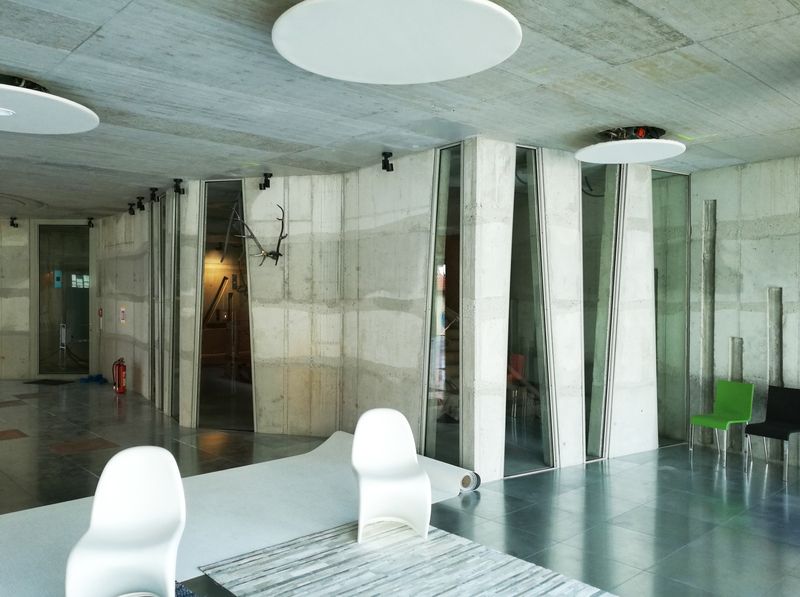 The spacious interiors are full of light and are linked to verdant terraces and balconies at the front side of the building. 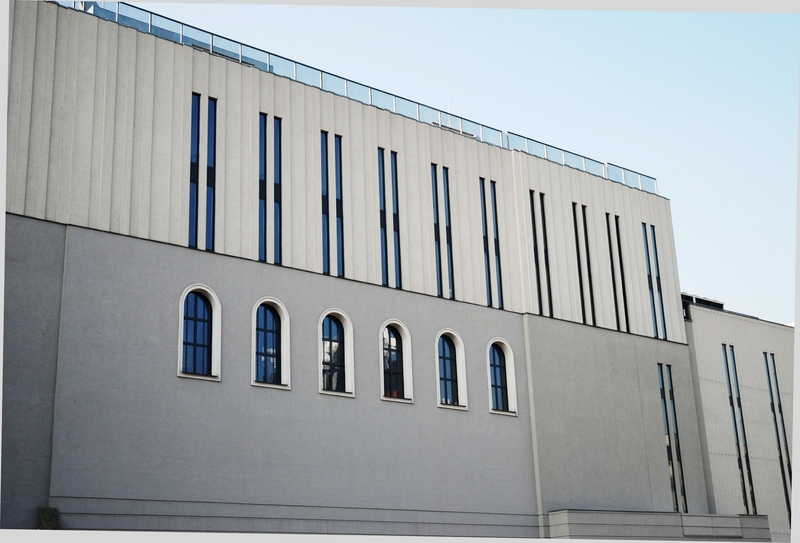 The new building of the Circuit Court is the first building, for the past hundred years, dedicated to the judiciary of Poznań. 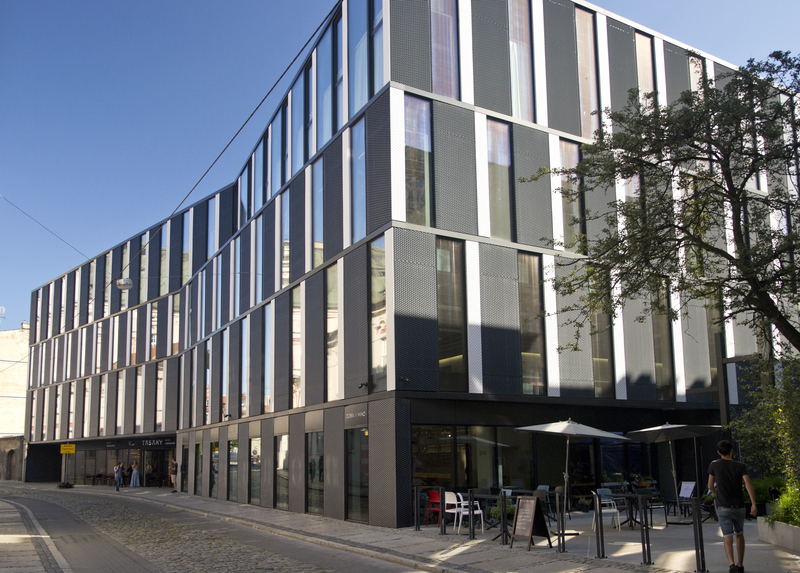 It contains 50 courtrooms, 270 offices, conference rooms, archives rooms, an underground car park - all located in the city centre and well integrated into the historic surroundings of the city. 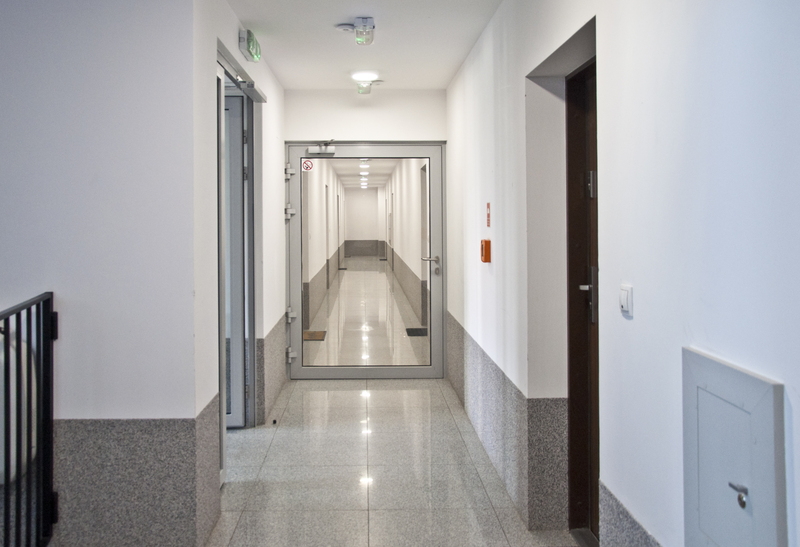 The building is comprised of two parts with a connecting passageway. Its total area is over 37 thousand sqm. 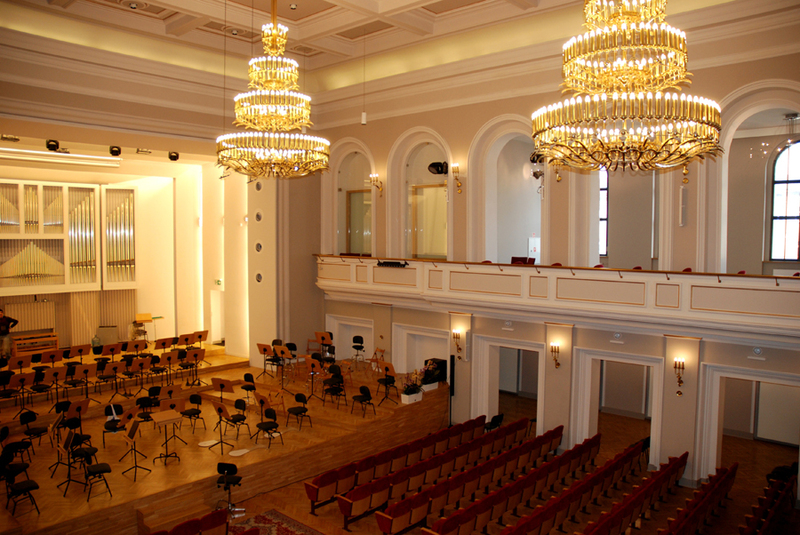 The concert hall of the Silesian Philharmonic is the oldest concert hall in Katowice. 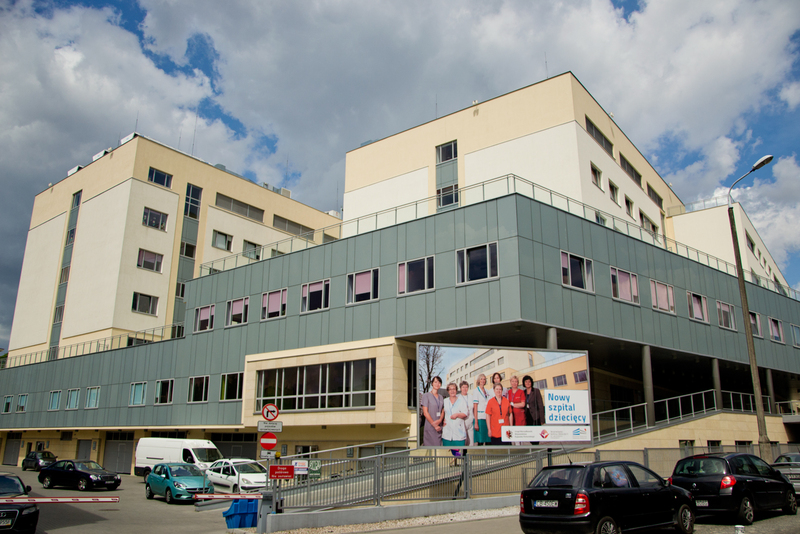 The building was renovated and expanded between 2010 and 2014. 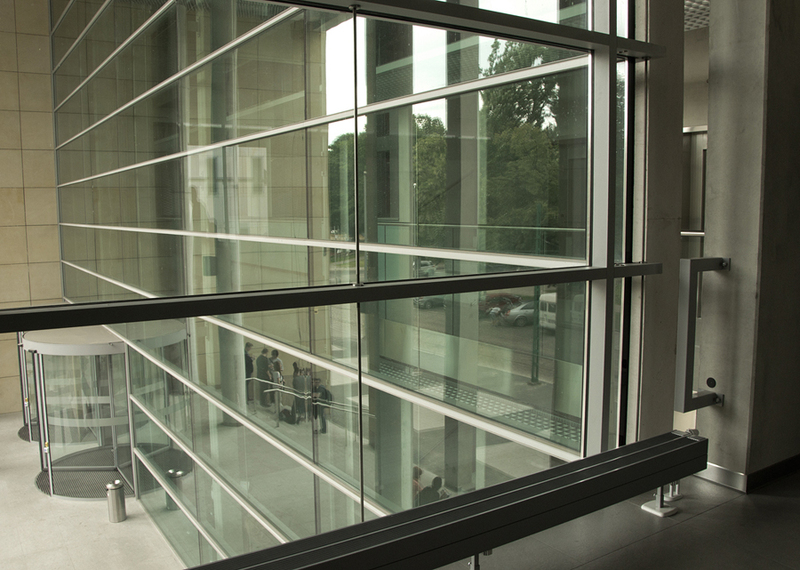 The window arches in a side facade of the building have been filled with POLFLAM® fire-resistant glass. 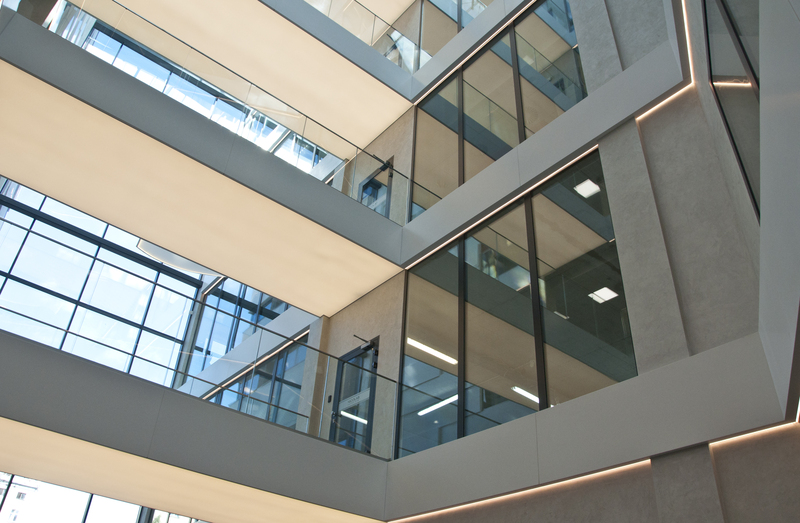 As well as protecting against fire, for this facility an important feature of the glass was its perfect acoustic insulation. 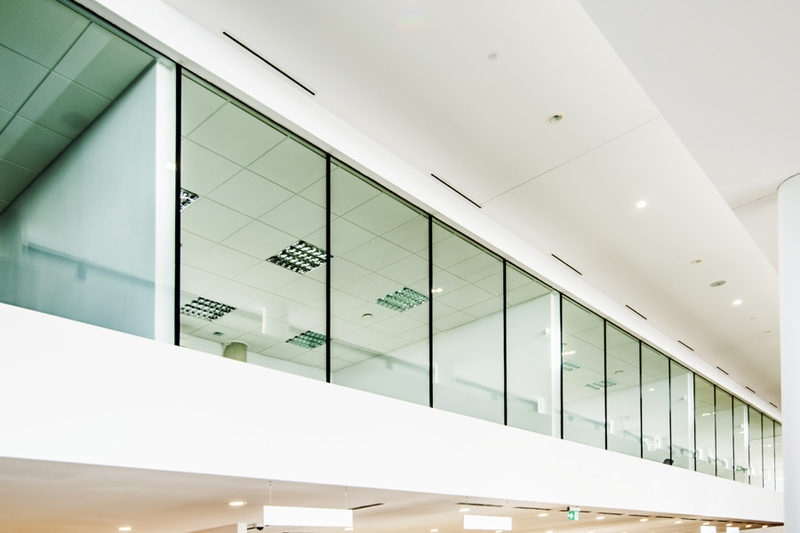 POLFLAM® standard fire-resistant glass can reach noise control levels of up to 45 dB, subject to the fire-resistance class. 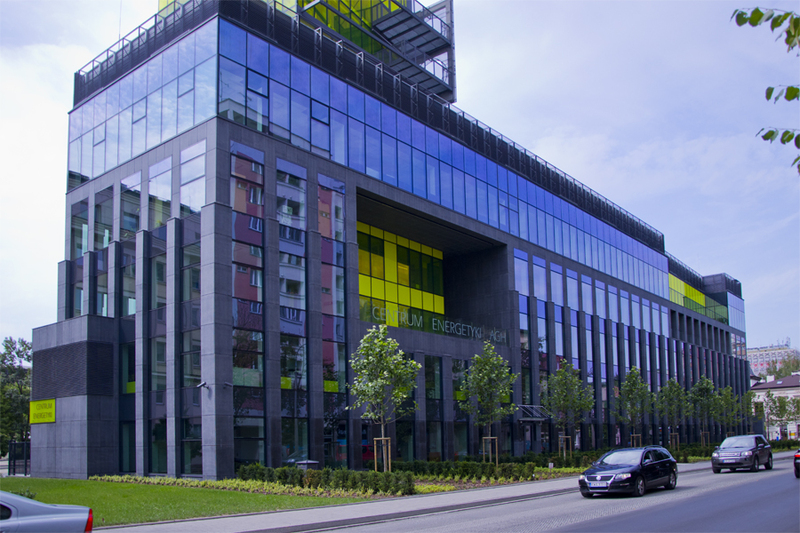 The POLFLAM® fire-resistant glass of fire-resistance classes EI 30, EI 60 and EI 120 has been used in the buildings of the Wielkopolskie Centre of Advanced Technologies in Poznań. 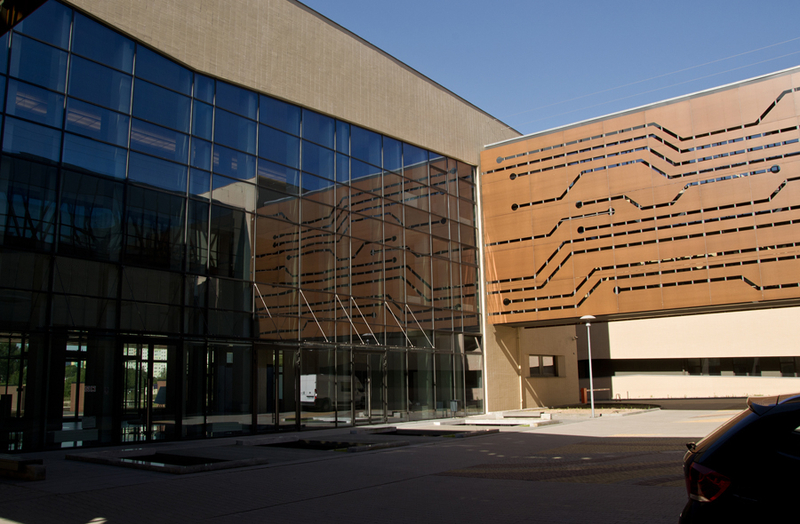 This is a multi-disciplinary research centre located in the Morasko campus, which is part of the Adam Mickiewicz University. 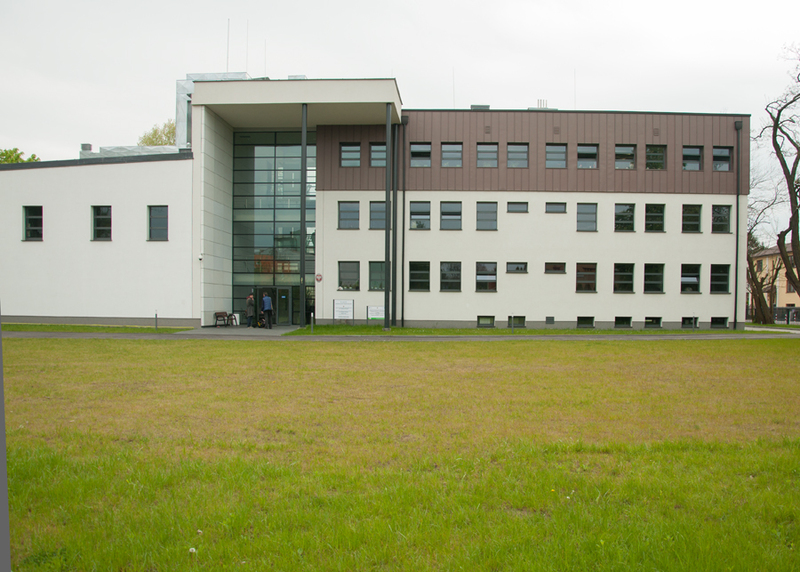 The centre consists of three buildings; the first houses the Centre of Biomedical Technology, the second – The Animal Research Unit, while the last one is used as a greenhouse. 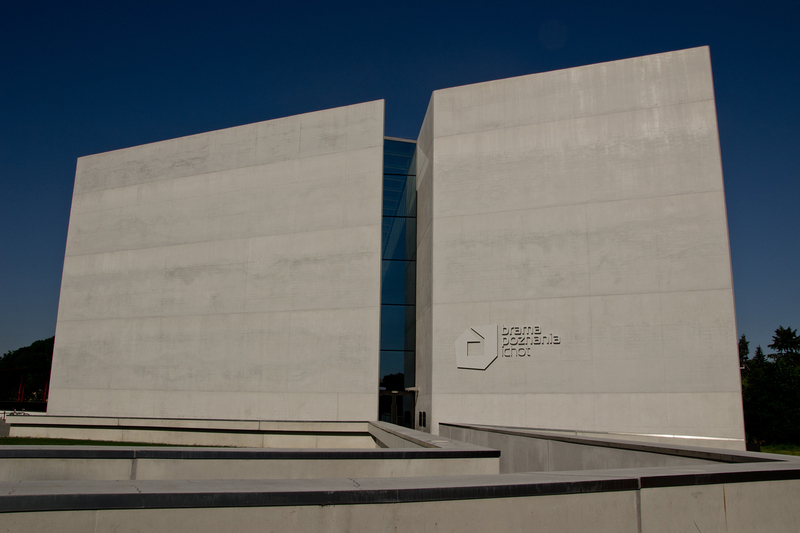 The Porta posnania is an unique cultural institution with a mission to approach the history of Ostrow Tumski – the cradle of Polish state history. 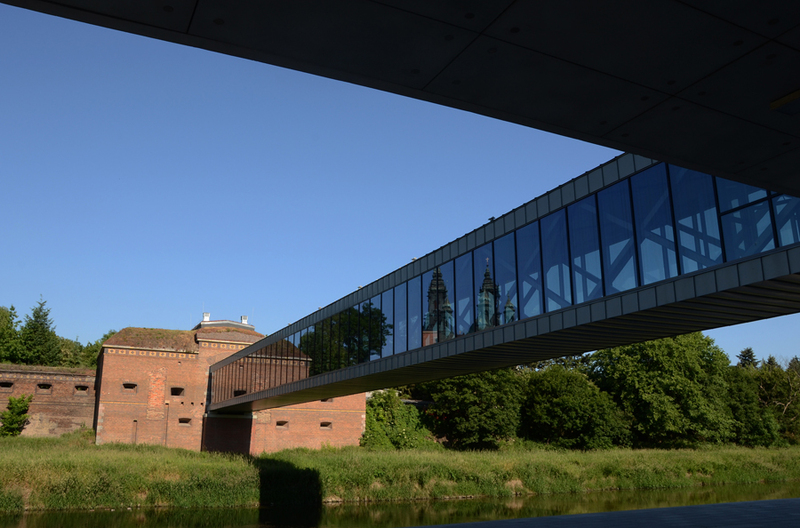 The centre contains a main building and a revitalized cathedral water gate (a relic of former fortification). The whole thing is linked with a footbridge over the river Cybina. 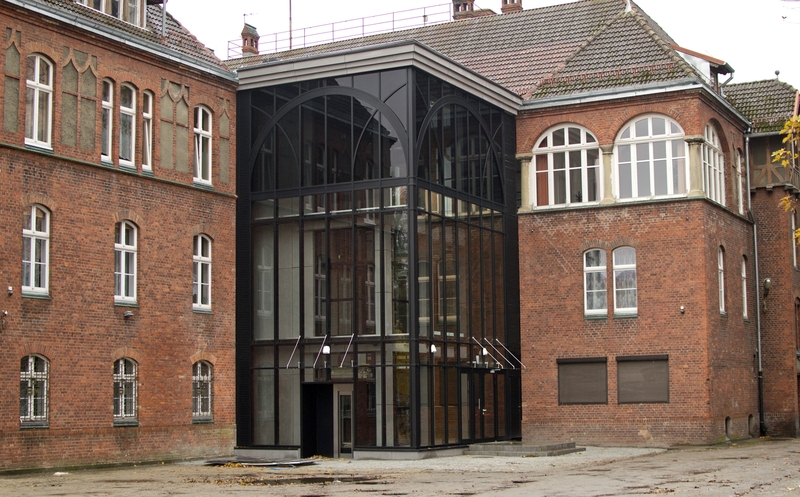 The main building has been designed with a characteristic opening that frames the view onto Poland’s oldest cathedral. 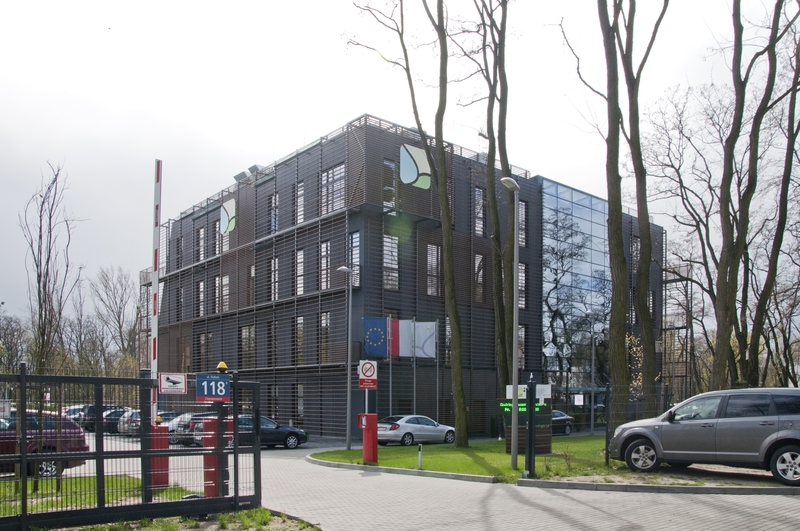 The Poznań University of Economy Educational Centre For Electronic Services is a seven-floor building (two underground levels), with 15 thousand m2 of surface area where ca. 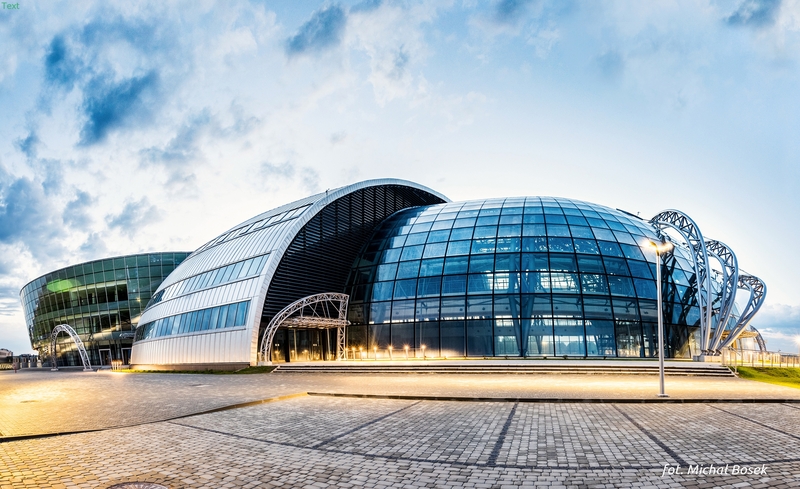 5500 sqm of glass has been used, including fire-resistant glass. 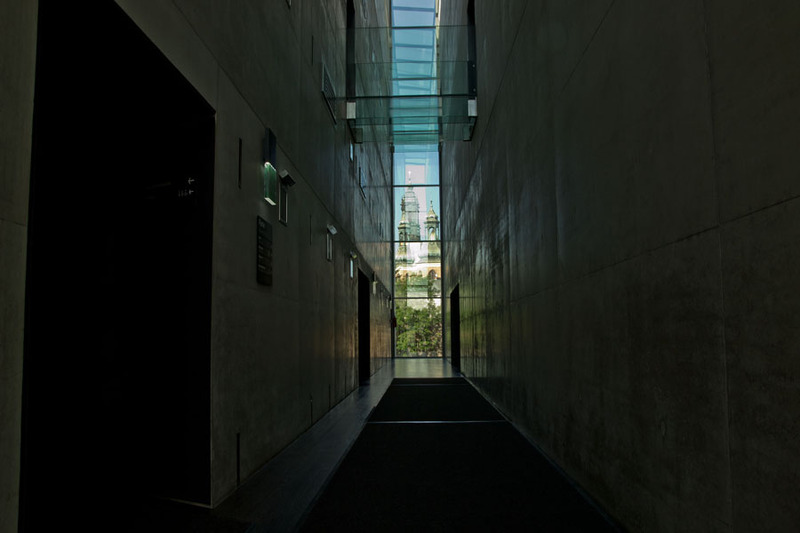 The centre boasts an interesting design, e.g., a multi-storey hall. 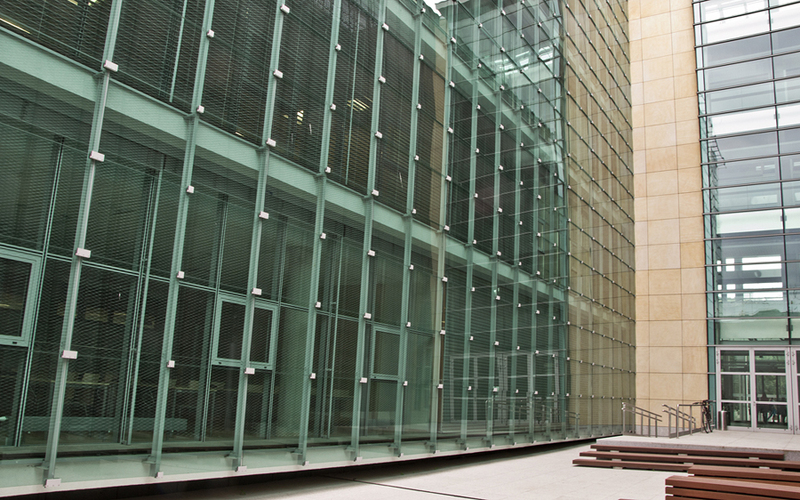 The facade has been made of sandstone, several dozen of pillars and glass. 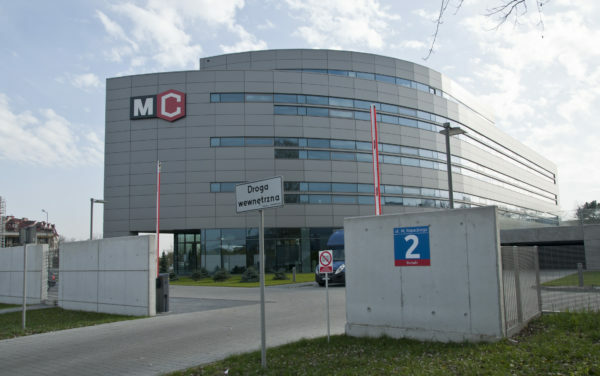 The S. Staszic Academy of Mining and Metallurgy Power Engineering Centre in Cracow has an area of 15 thousand sqm. 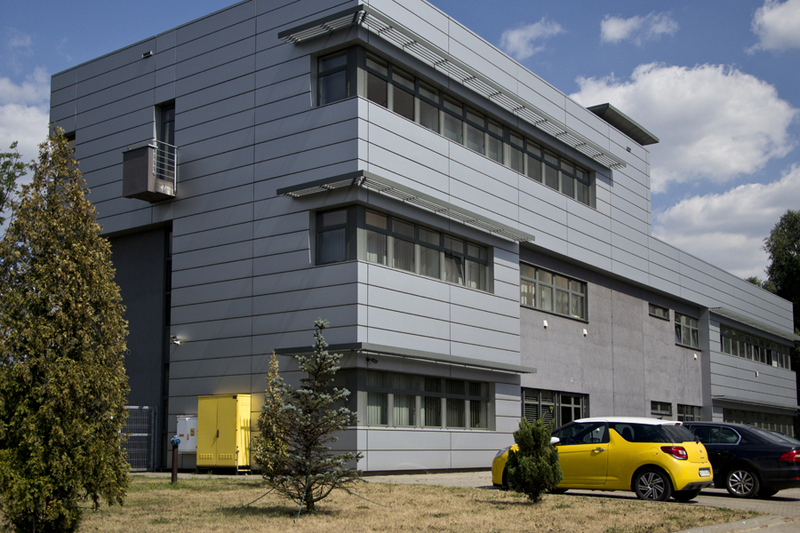 It contains two seven-storey buildings topped with translucent yellow pavilion which houses nearly 40 specialised laboratory centres used, among other things, to conduct research of clean coal technologies. 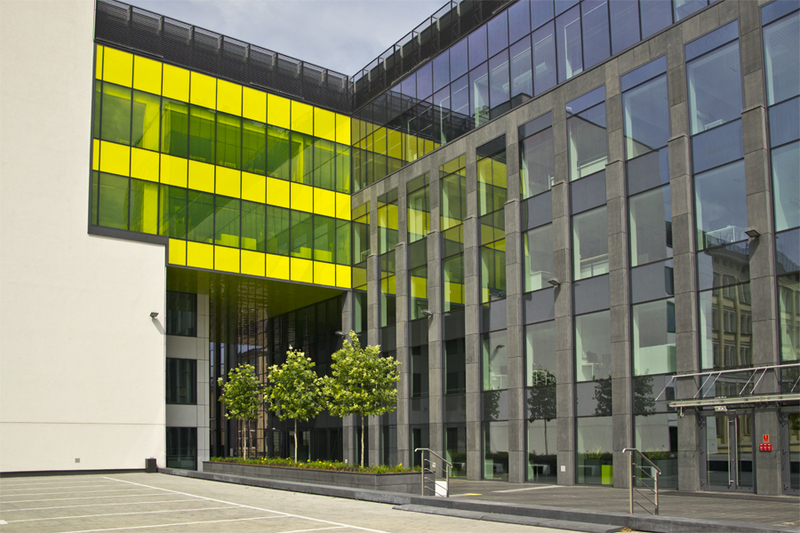 The Power Engineering Centre is outstanding for its truly futurist form and colours. 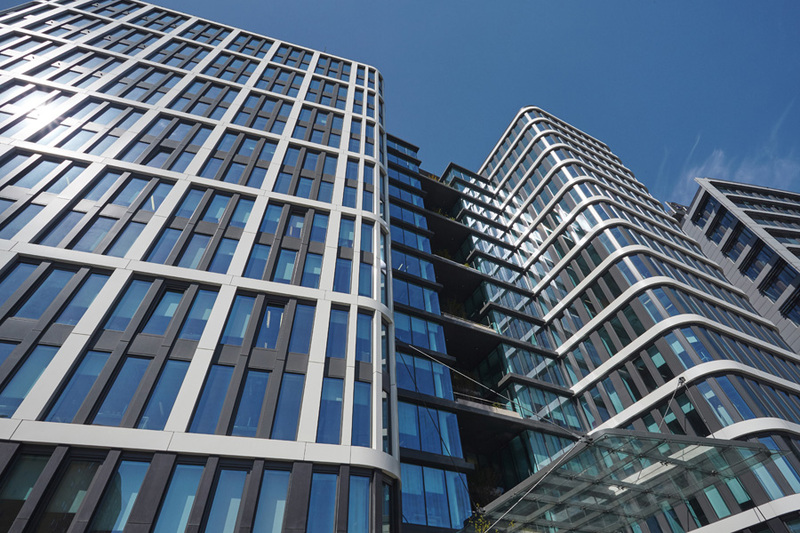 The vertical structuring of the elevation give the monumental-looking building more dynamics, while the black and grey contrast with the yellow detail. 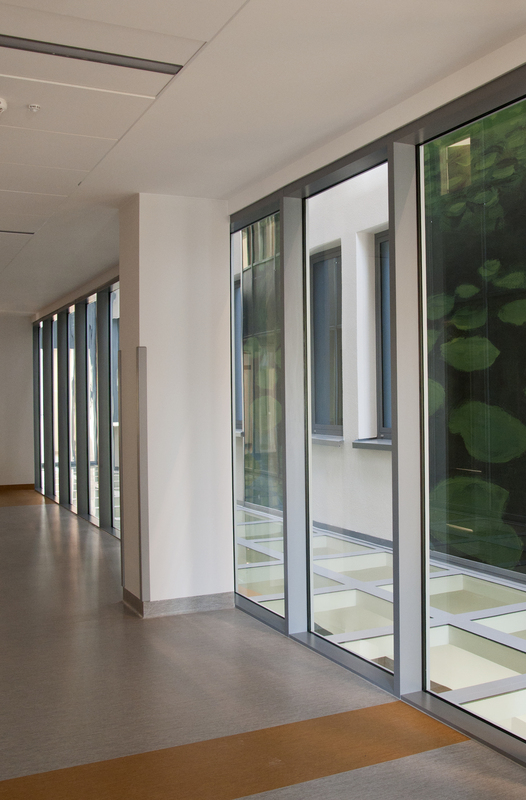 The façade has been made of POLFLAM® fire-resistant glass, class EI 60. 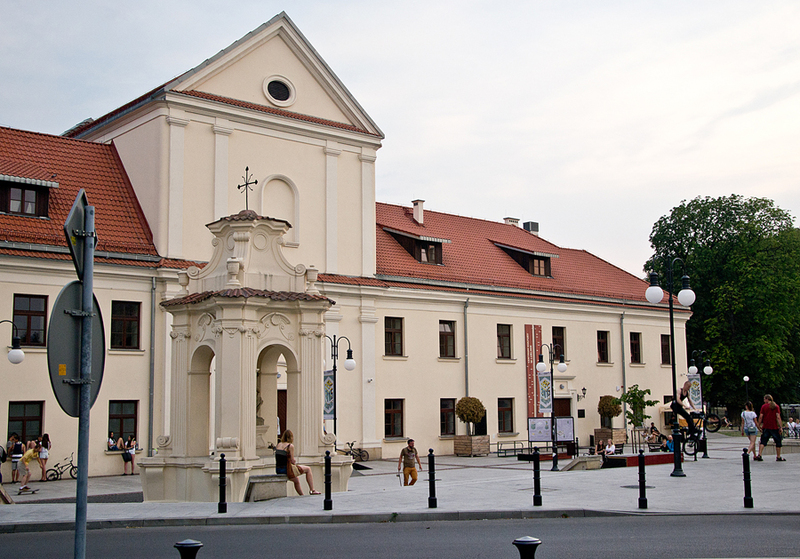 The Culture Centre in Lublin has been situated in the historical monastery which goes back to the early 18th century. 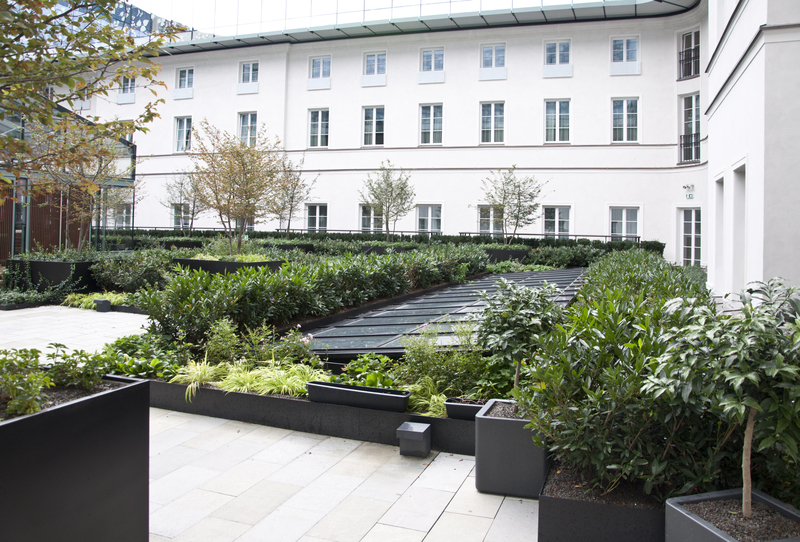 The revitalisation, carried out between 2009 and 2013, has encompassed the area around the building and the greens which were formerly the monastery’s garden and park. The complex was restored to its historic architecture. 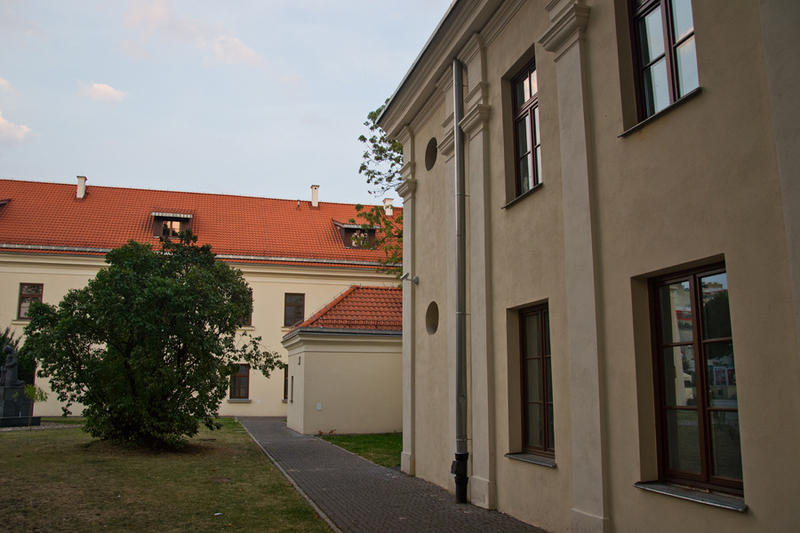 The modernised monastery building is home for the Culture Centre, local library and the creative arts centre „Rozdroża”. 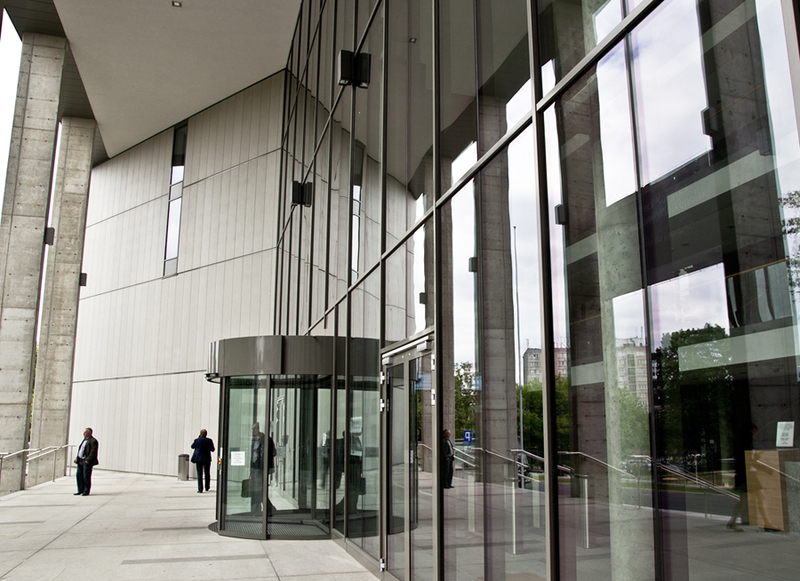 Numerous conferences, scientists’ meetings and culture fairs are held there as well. 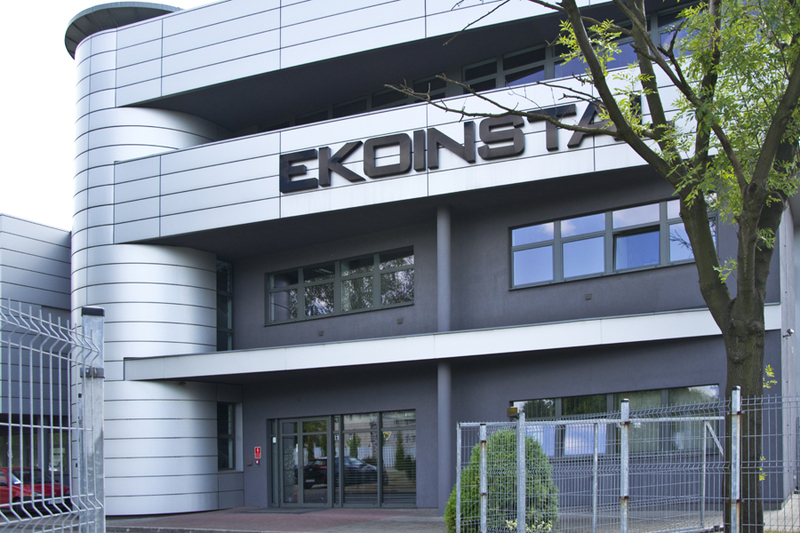 The Ekoinstal office building where POLFLAM® glass has been used, is made of two dilated parts of a total area of 3 000 sqm. 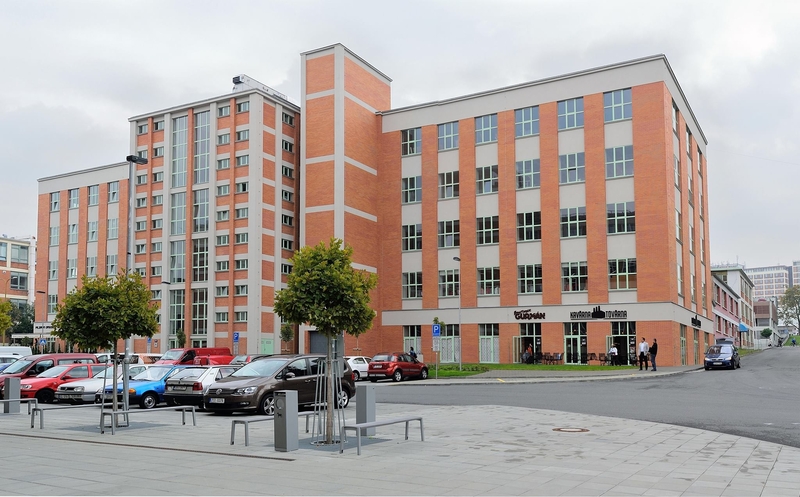 The typically Silesian architectural context has contributed to a very simple form of the building and a clear elevation structure. 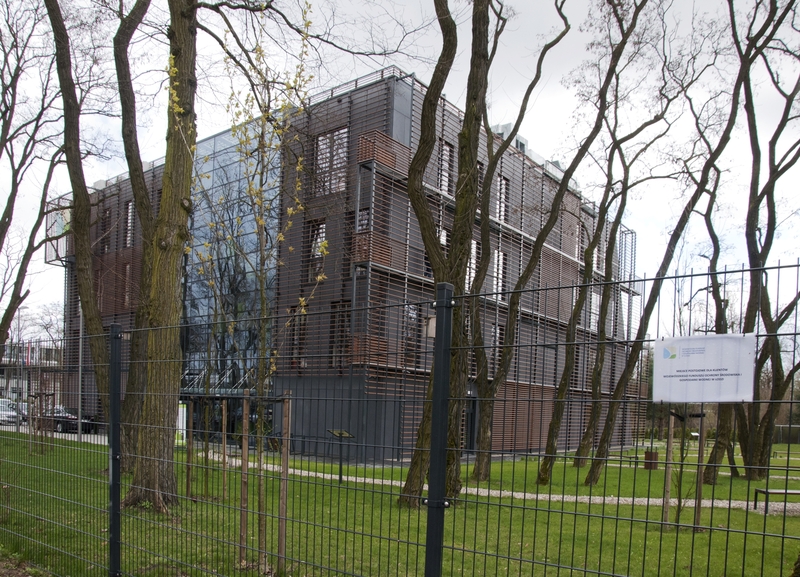 The materials were selected to avoid taking after the former-German brick structure. 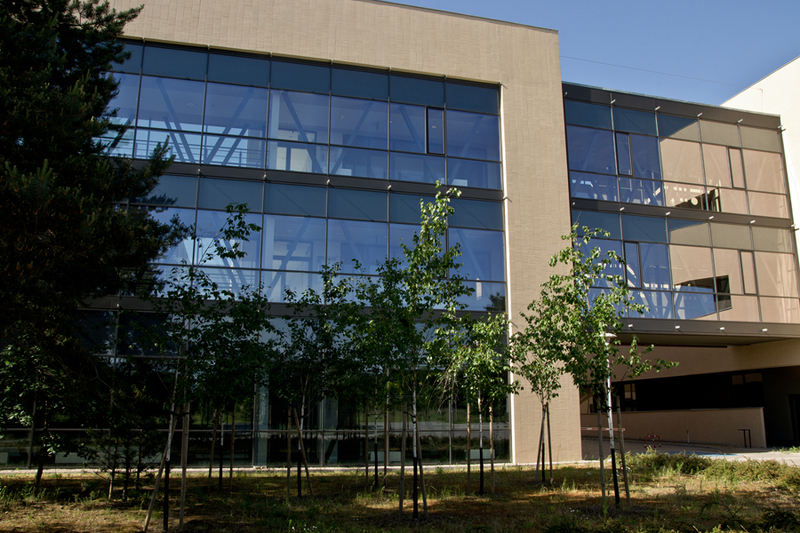 A six-storey building hosts scientific research labs, presentation spaces for scientific achievements, seminar rooms and a cafeteria. 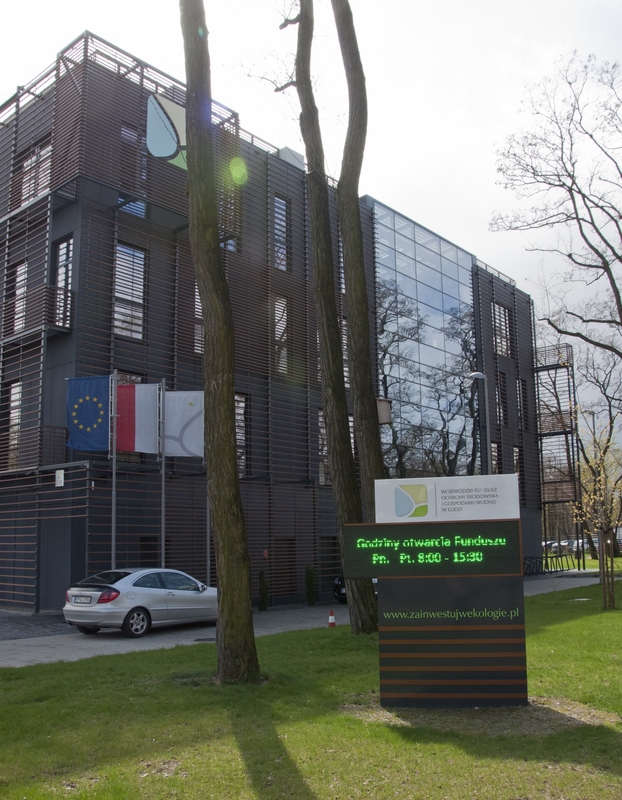 The facility is an element of a comprehensive modernisation and infrastructure development program for the faculties of science within the Ochota campus, carried out by the Warsaw University. 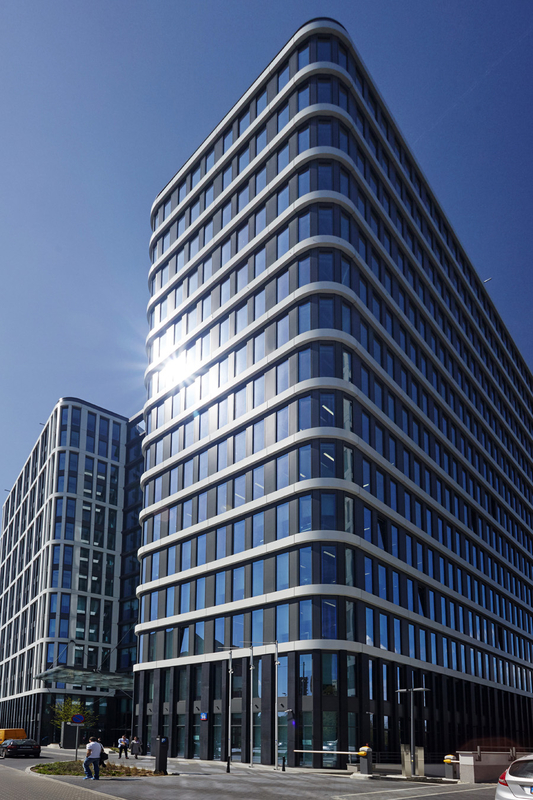 The centre is an office space of a total area of 13 000 sqm, located on eight above-ground storeys. 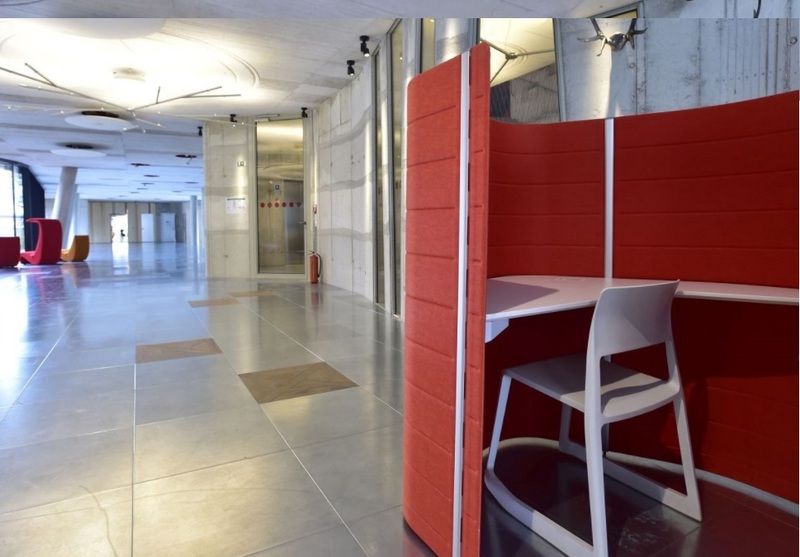 The design was meant to provide comfortable working conditions. 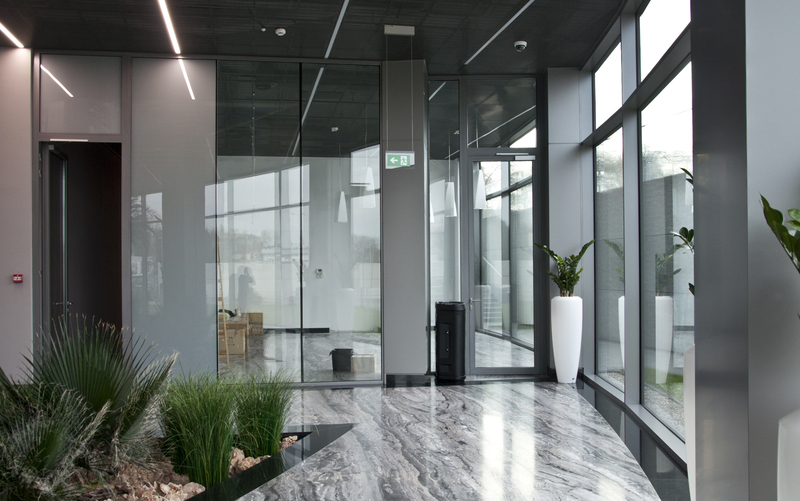 The large-size glass panels provide better exposition to daylight, with the open space providing for efficient arrangement of rooms. 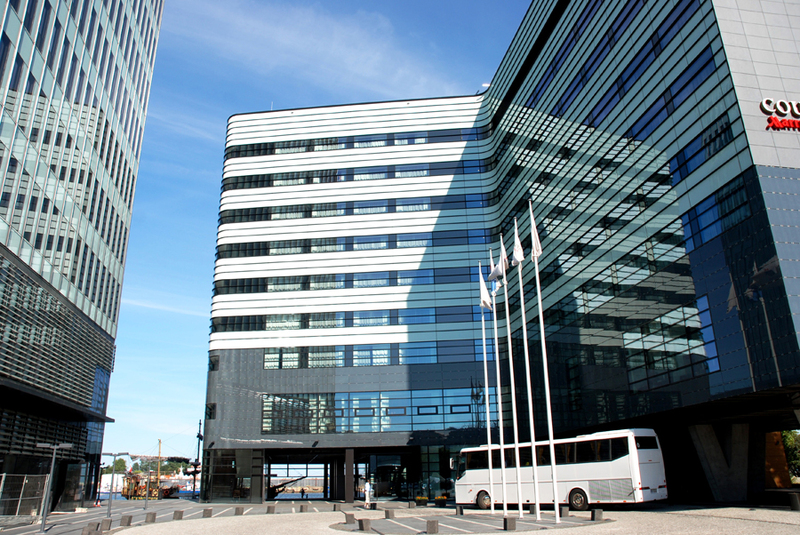 POLFLAM® fire-resistant glass has been used inside the building. 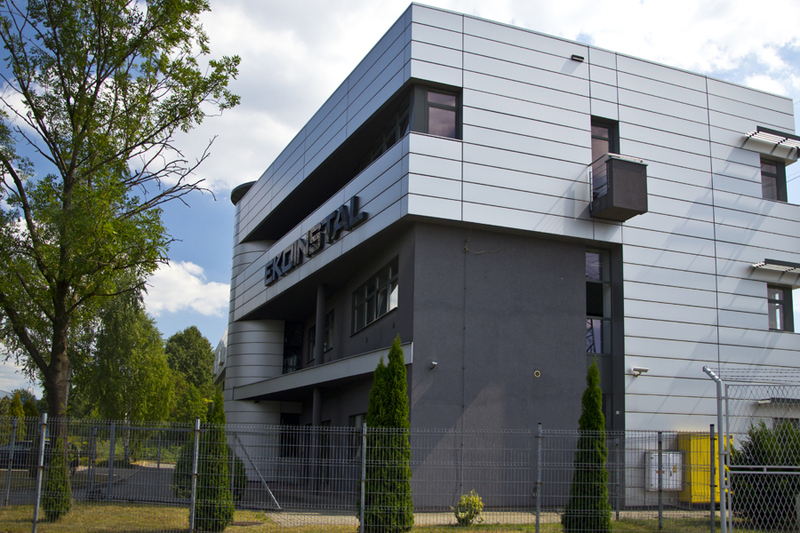 The S. Staszic Academy of Mining and Metallurgy (AGH) Campus in Cracow occupies an area of 16 ha. 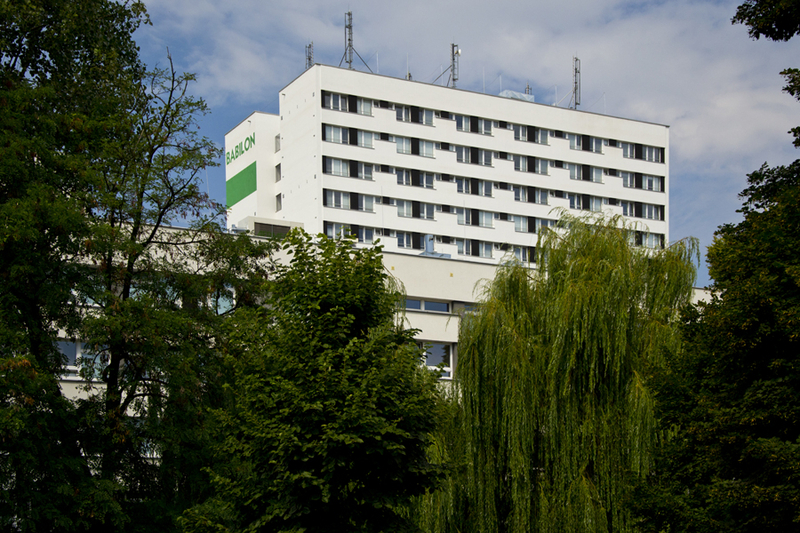 It provides more than 8 000 beds for students from AGH and other Cracow colleges. 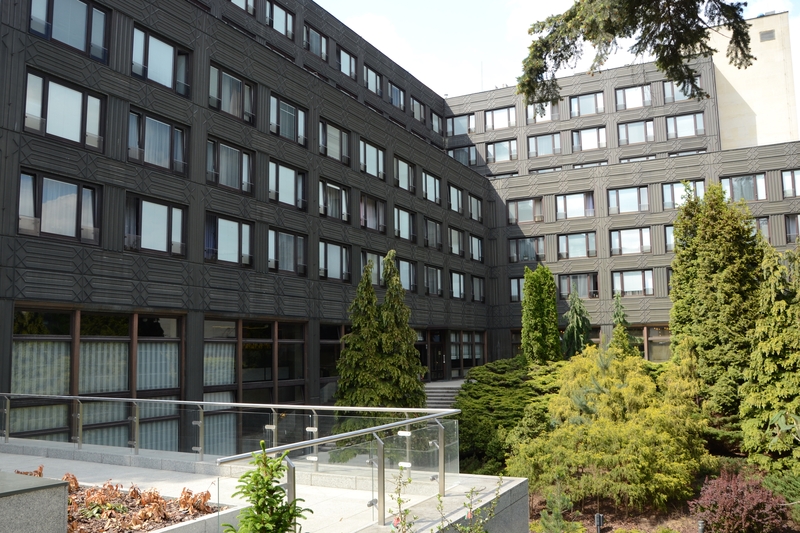 Twenty dormitories of different type are available to students in the campus. 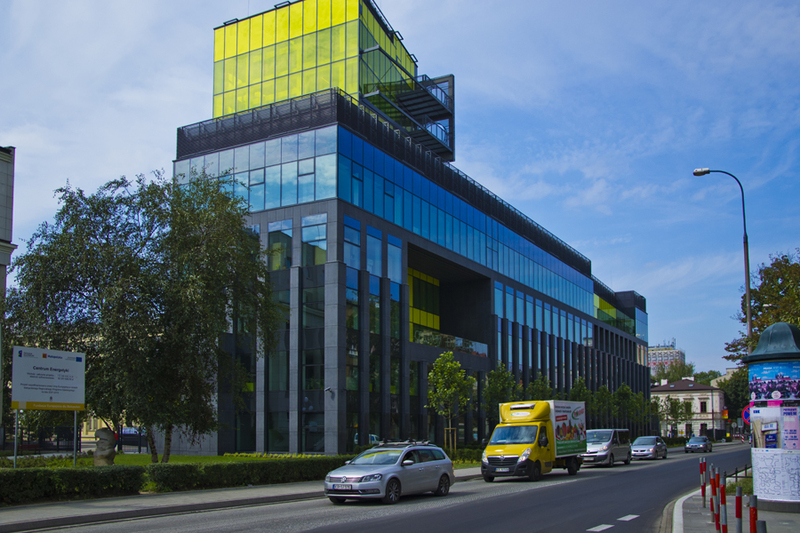 Babylon, a fifteen-storey house where POLFLAM glass has been used, is one of the largest. 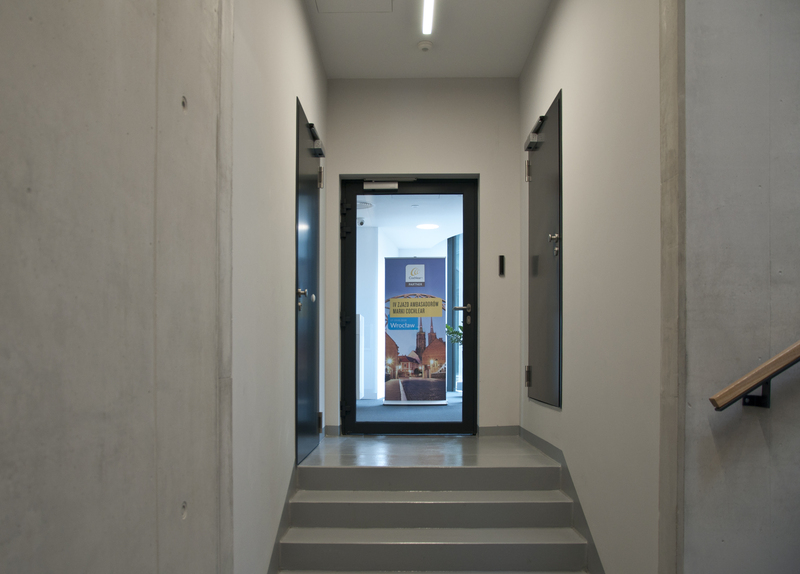 This is part of the extension of Fryderyk Chopin State Music Schools. 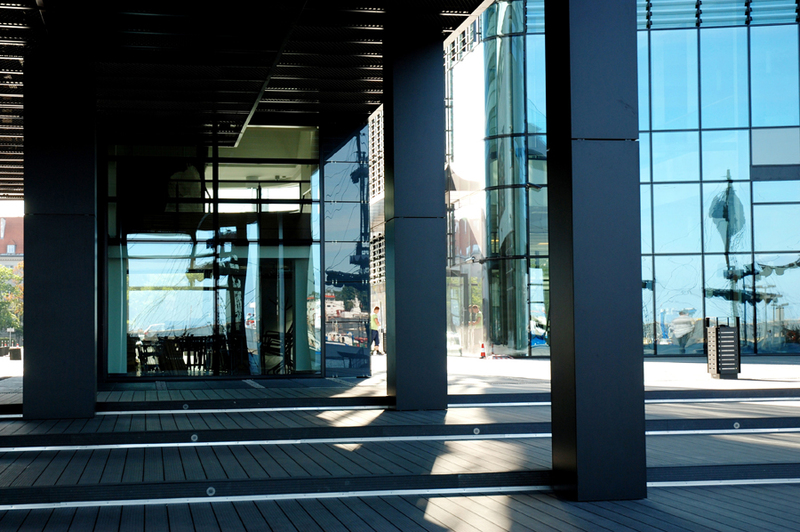 POLFLAM® fire-resistant glass has been used for the outdoor part of the building. 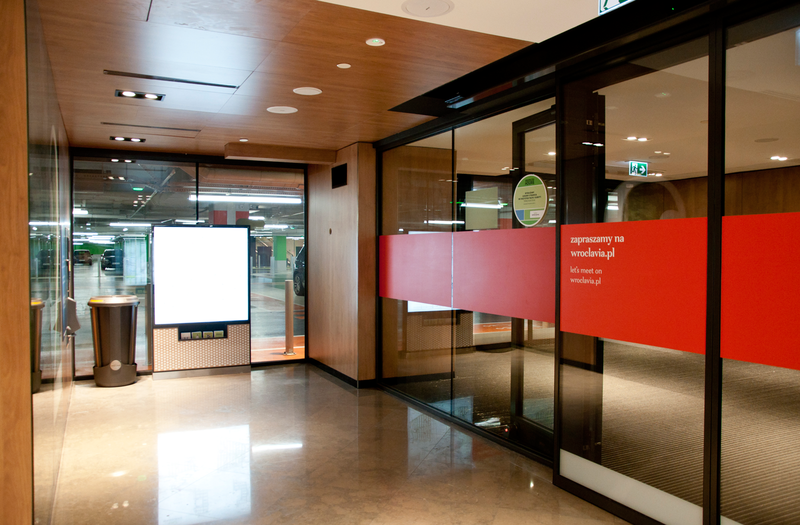 The facility is used for the educational purposes of the Centre. 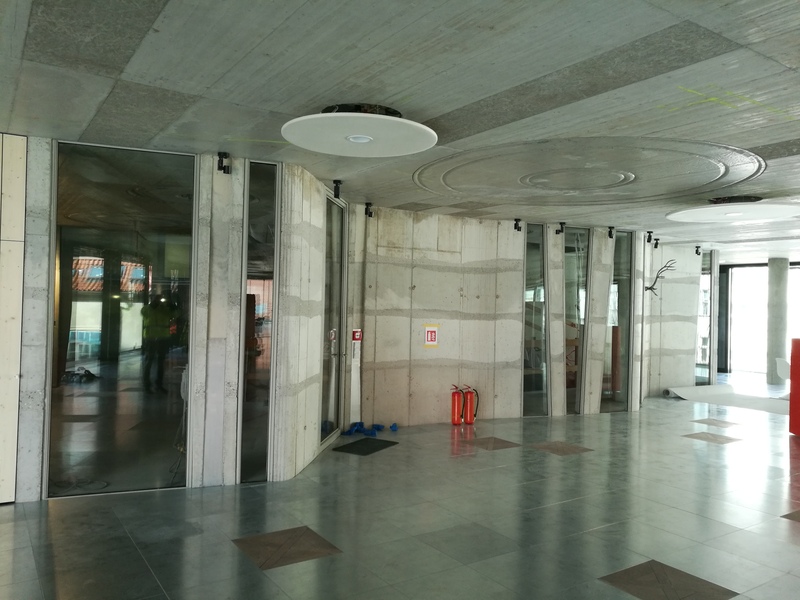 It will also house an important part of the future concert hall support facilities (administration, soloists’ wardrobes, bands’ waiting rooms, toilets). 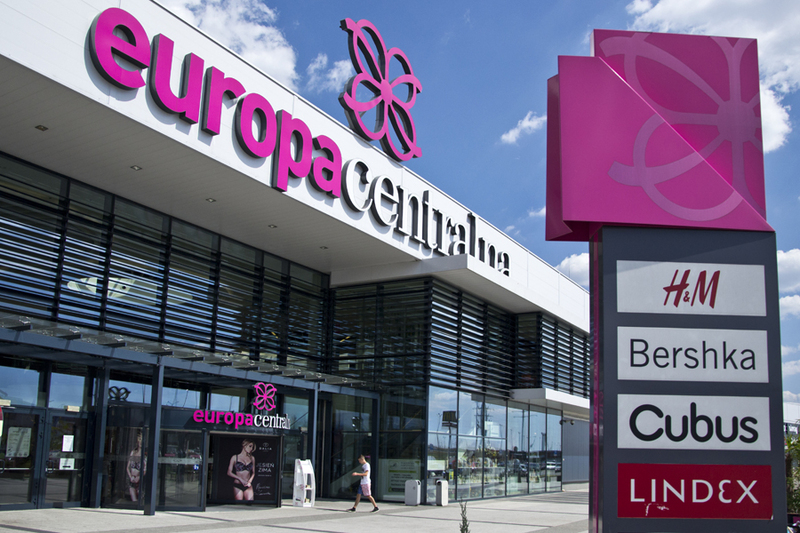 The centre is one of the largest commercial malls in Europe. 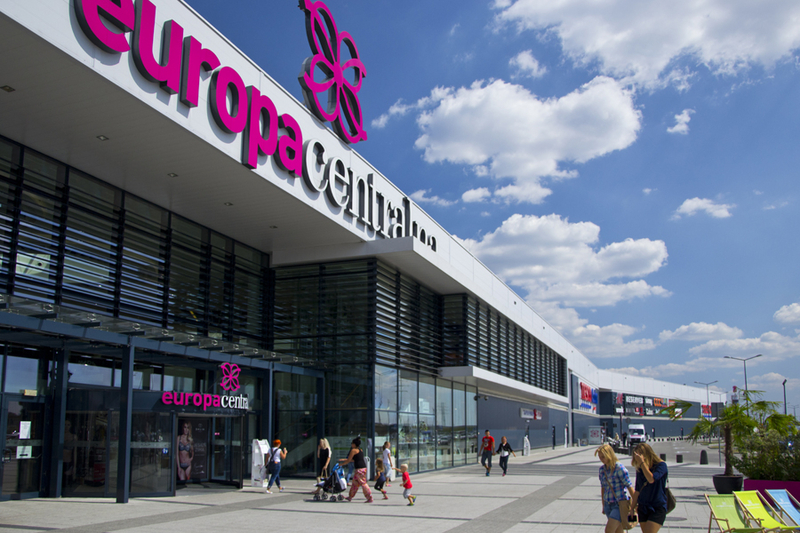 Its shopping area is 67 000 The several-storey block of buildings contains a shopping park with large-surface shops and boutiques with a wide range of goods and services on offer. 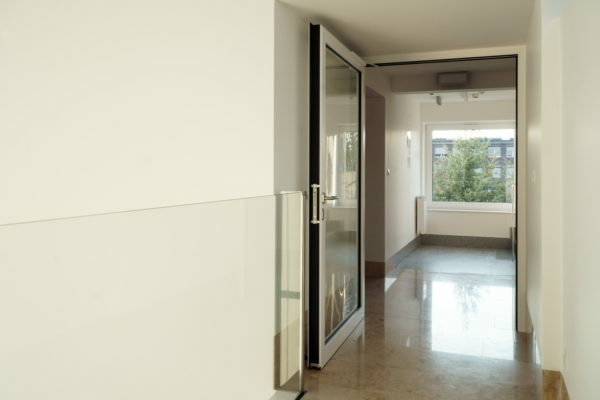 The glazing has been made of POLFLAM® fire-resistant glass. Your newsletter by POLFLAM. Here you can sign in.